“Hail fellow, well met!” I really should start a mission to bring that phrase back into mass usage, I thought as I headed over to the East Coast and to Grimsby, where I’d bring up the big 300. 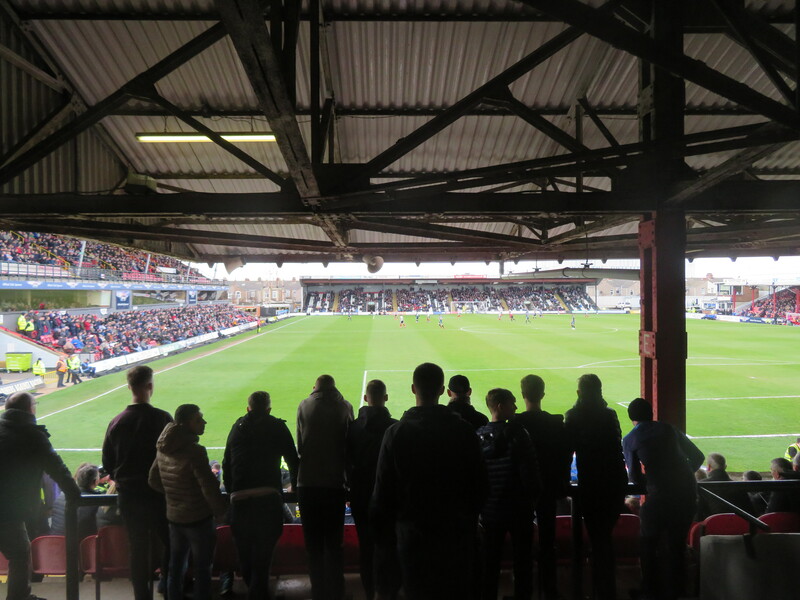 Blundell Park seemed a fitting venue for such an honour and despite my bored thoughts delving off into Alan Partridge levels of 16th century welcomes, I was very much up for seeing what the town had to offer. I just hoped that the name wasn’t reflective! 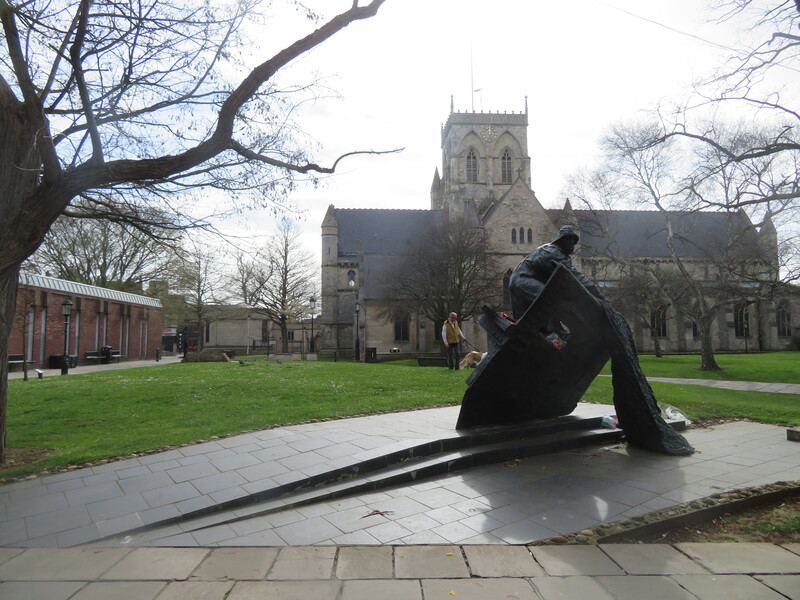 Eventually arriving at about a quarter to midday, I headed slightly out-of-the-way to have a quick peruse of Grimsby “Minster” before walking on through the surrounding gardens and into the centre, passing a striking fisherman statue as I went. Soon enough, I came upon my first stop of the day, The Parity, which is one of those large ranging free houses in the mould of a Spoons. A rowdy group of lads were providing the soundtrack in here as I entered before they were told off by a youngster for doing so and disturbing her dinner. Fair play, though they soon departed and the place quietened down markedly as I supped at a pint of Coors which, at £2.80, provided me with a fair amount of hope when it came to the rest of the day, wallet-wise! 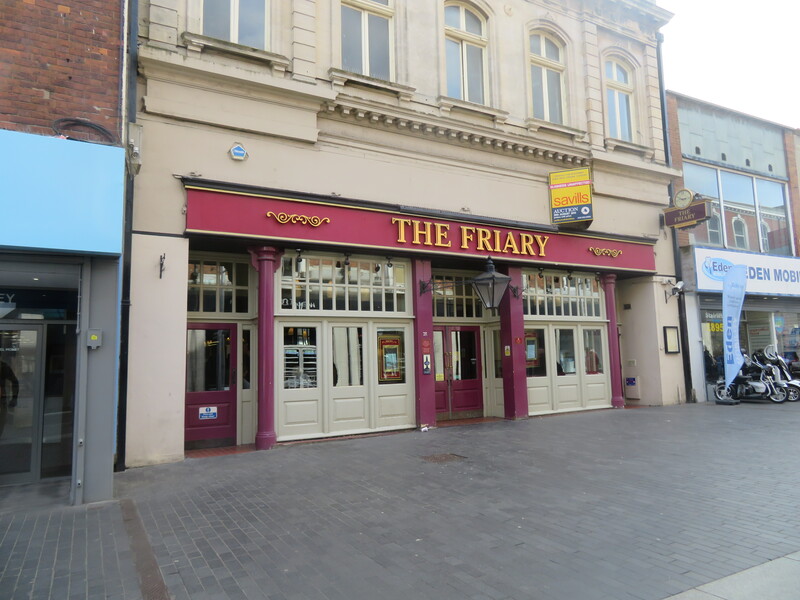 From there I continued onwards through the centre, passing by the closed Tivoli Tavern as I did so and coming upon my second stop- The Friary. 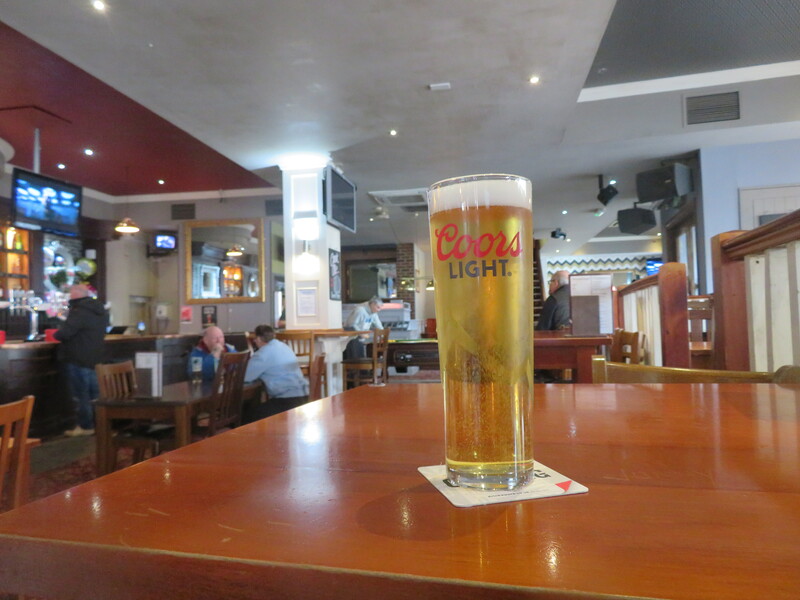 As I approached the bar, I began to see things, crazy things – things like beers costing £1.50. I must have had something I ought to have not, I figured but nope, there was the drinks all lined up with only Stella taking the “normal” price approach. As such, I opted for a Carlsberg for the magical price stated above which came in a pretty attractive glass too. Not too bad so far that’s for sure and I was loving Grimsby! 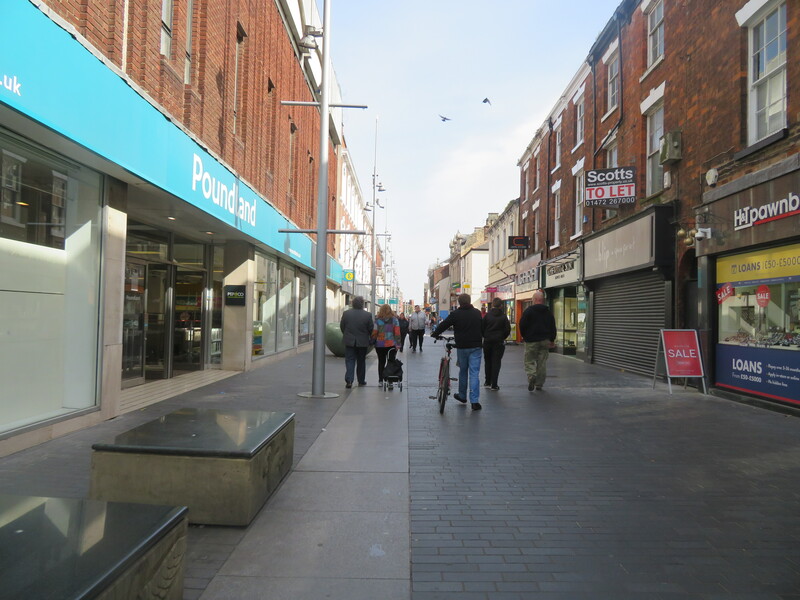 Speaking of which, Grimsby is a large coastal seaport on the East coast of England and is located in North East Lincolnshire on the River Humber’s South Bank close to the river’s estuary into the North Sea. 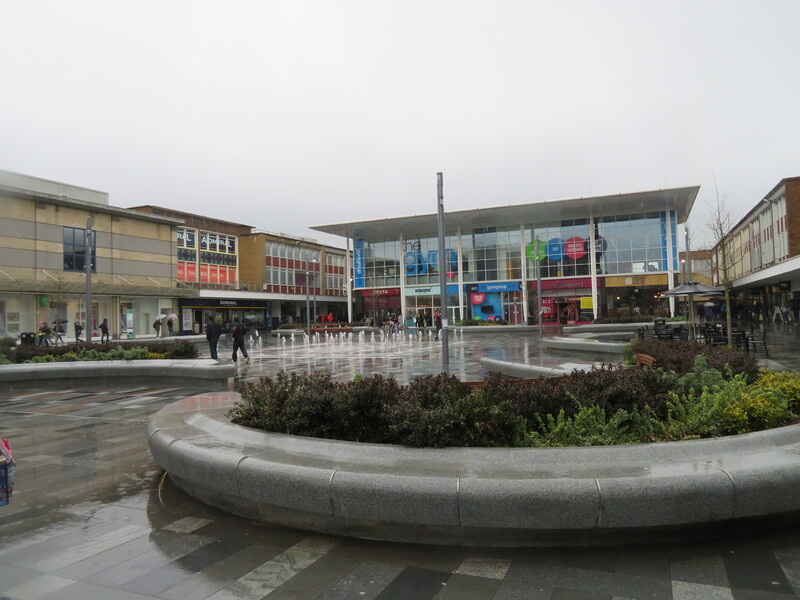 Titled as Great Grimsby as to avoid any confusion with Little Grimsby, a village 14 miles away, it is neighboured and linked with Cleethorpes and many local villages that are now encompassed within the town’s overall reach. It is located within old marshlands and was originally founded upon islands and low-lying areas within them and the areas of East and West Marsh hark back to this. There is some evidence to suggest a small Roman presence, but the Vikings are far more prevalent, their settlement dating back to the 9th century and, indeed, it is thought that Grimsby comes from a Viking fisherman, Grim, with the suffix ‘by’ meaning village in Old Norse, with mythology suggesting the God Odin would travel in this form whilst in the presence of mortals. Grimsby did make an appearance in the Domesday Book as a small settlement of around 200 people and transformed into a fishing and trading port in the 12th century and was later granted its town charter by King John in 1201 and its medieval St. James’ Church now serves as the “minster”. However, the 15th century saw the river’s estuary begin to silt up, restricting access and therefore leading to a decline in Grimsby’s fortunes which would last into the late-1700’s. However, upon the river’s dredging around this time, the port was revived and the area boomed once more with new docks created to cope with the new demands. 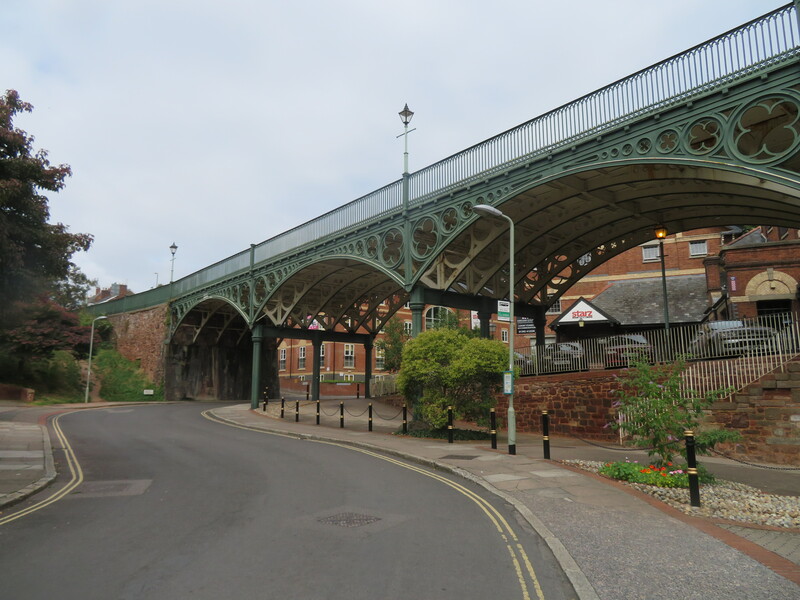 The arrival of the railways in 1848 took some stress off the port and allowed for ease of transport of goods and this allowed the town’s fishing exports to grow in popularity and gain the status it holds. The upturn continued until the Great Depression and the setbacks that came with it. During WWII, many of the area’s trawlers were commissioned by the Royal Navy into the ‘Patrol Service’, but this came at a cost with over 2,000 crew killed and a memorial alongside the 19th century Dock Tower commemorates those lost. 196 further lives were lost during numerous bombing raids at the hands of the Luftwaffe. Grimsby’s local industries soon fell apart post-war and the closures of many port companies and mines left many redundant, with the food processing apparently one of those that continued to expand instead. The town’s tram system also became redundant in the 1950’s as buses became the better option. 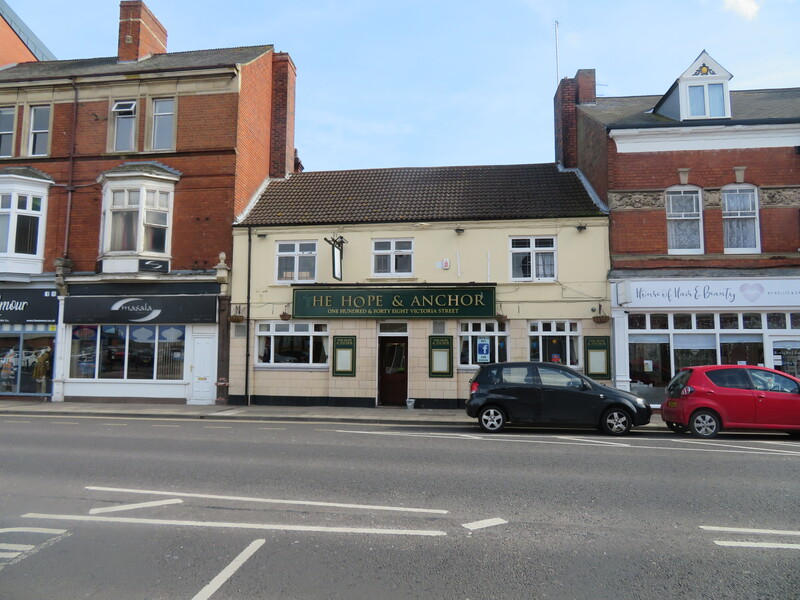 A few doors down sits the Old Lloyds Arms which seems to be Grimsby’s rock/metal haunt, disguised as an old-school, traditional boozer. 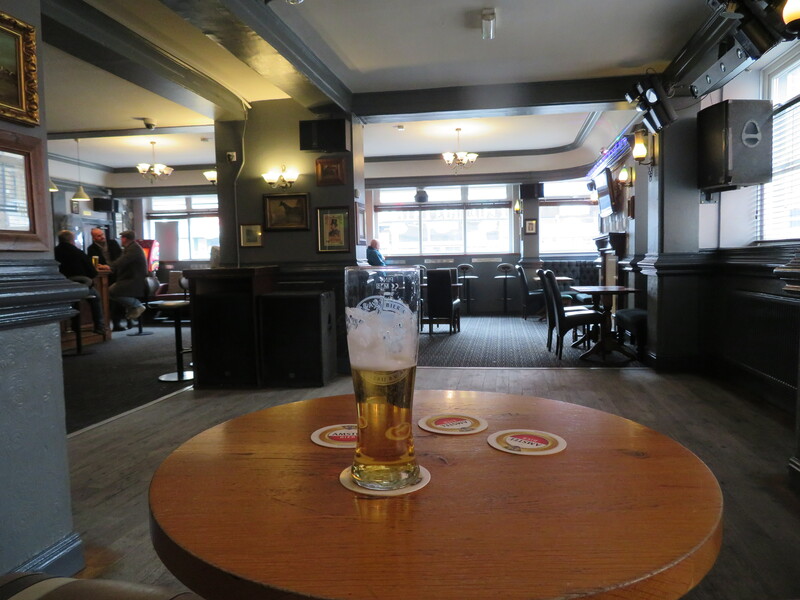 A Stella (£3.15) was had here with little to set the pulse racing on offer once more (that’s probably the biggest gripe I had with the drinking holes of Grimsby) and I swiftly dispatched that as my head had been turned by what was across the way. It was a bar, yes, but not as we know it. No, it was on a Barge. An actual canal boat. Scenes were AOTS as I headed up what I termed the “gangplank” and down a fairly sizeable set of steps to the bar area. Again, the beer choices weren’t too amazing, but I did spy Dandelion & Burdock (alcoholic, don’t worry) in the fridge and my mind was made up. Serving as my designated ‘refresher’ the D&B went down well enough but it was soon time to head onwards and next up was a choice of the Duke of Wellington or the Hope & Anchor. I opted for the latter as it was right in front of me and not about ten seconds walk down the side road. 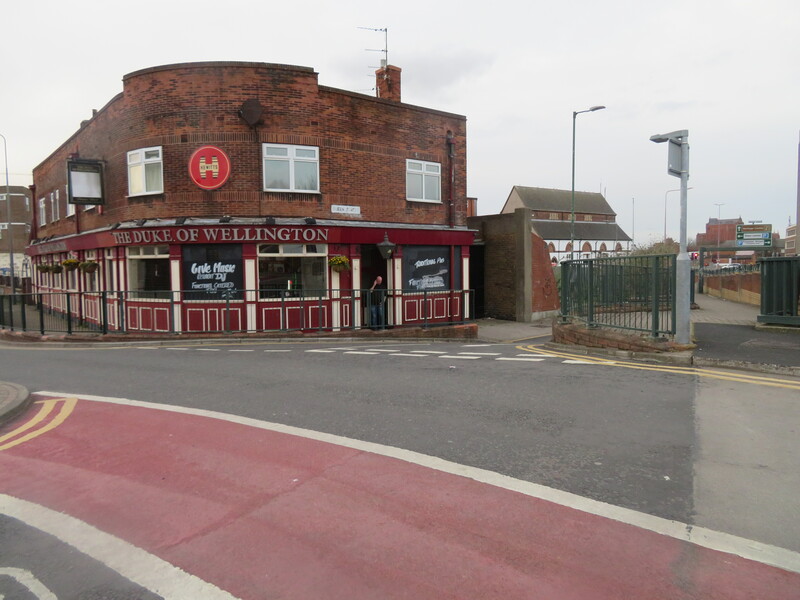 A second Coors of the day was had here as I awaited the bus on towards the Wellington Arms, the very pub that the Mariners were formed in back in 1878. 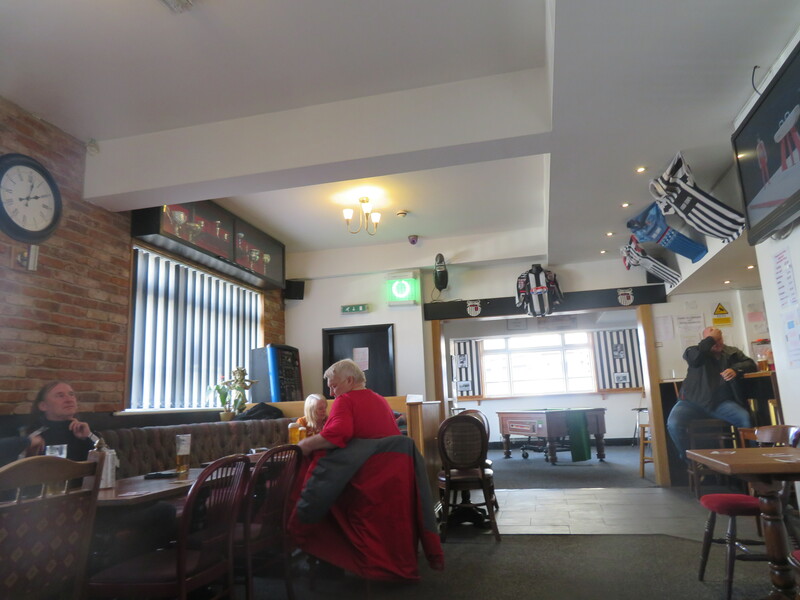 It seemed more akin to a sports club within, and was decorated with many a piece of Grimsby related memorabilia and the like, and again the beer choices sort of reflected this as I had to settle for Coors once again. As I complained about earlier, this day hadn’t been too adventurous, disappointingly, and I hopped back on the bus to two Blundell Parks in the hope of better things. 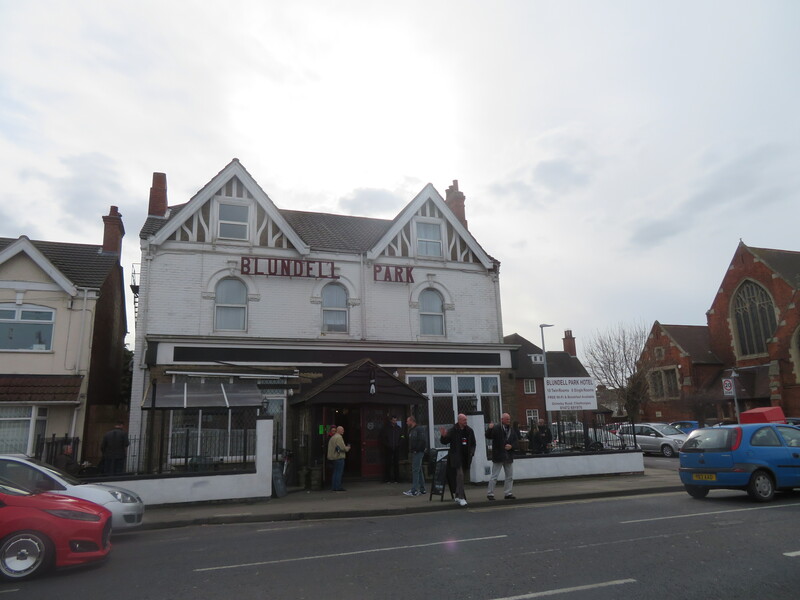 The ground would come second however, the pub would come first, with the closest thing to Carling (their Black Fruits offering at £3) that will ever pass my lips being chosen due to….well, you know the story by now, before it was finally time to head to the “real” Blundell Park. Ground 300, let’s hope the game lives up to it, I thought to myself. How to get your hopes up…. 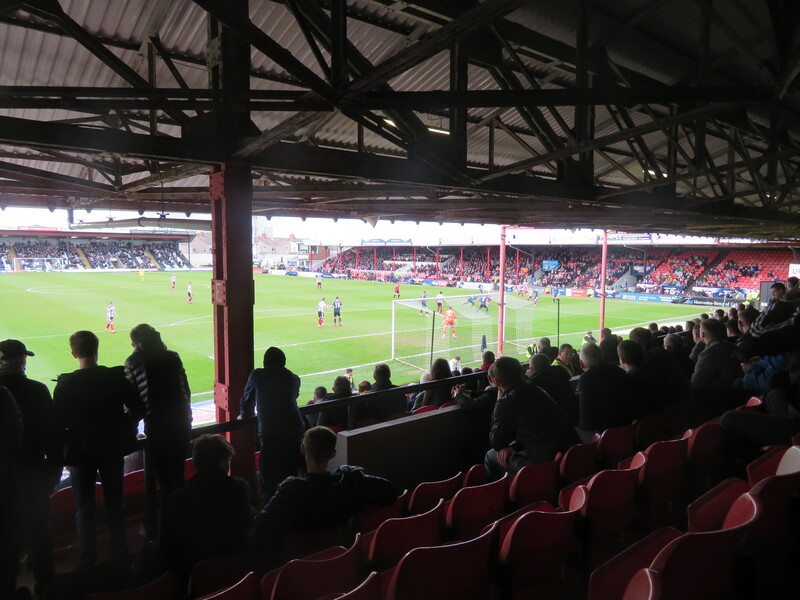 Blundell Park itself is a brilliant, old school ground. 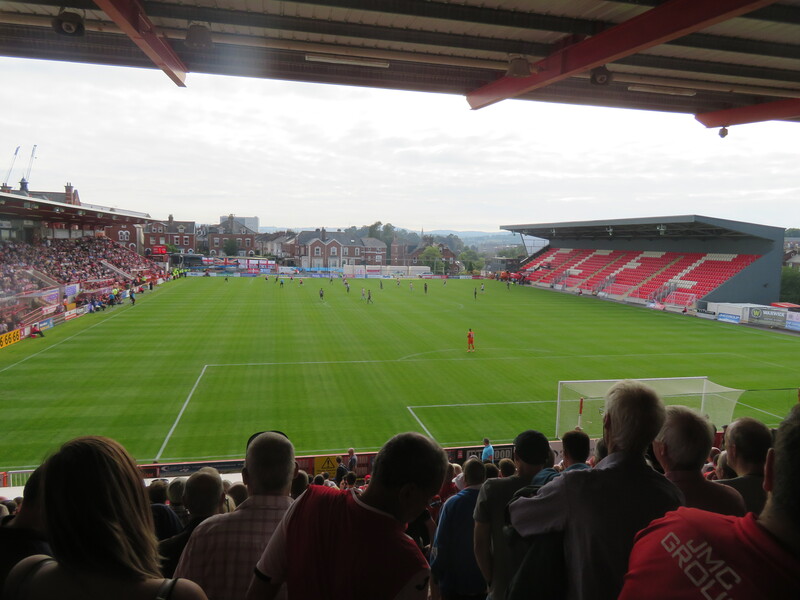 Yes, its views from the away end aren’t superb (and that’s being rather kind), but I’d rather have somewhere with character than one of the soulless new builds that continue to rise up around the country – anyway, I digress. 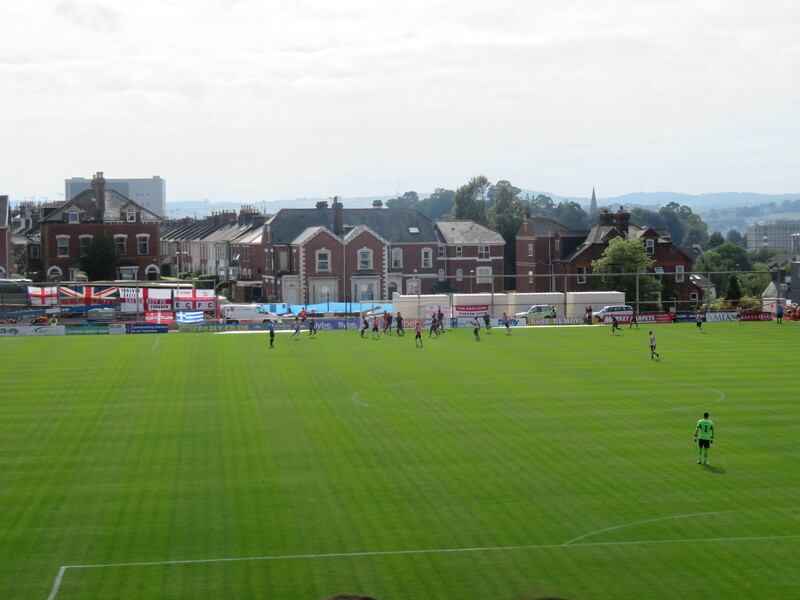 The old Main Stand sits to the right as you look and the middle part of the structure is apparently the oldest bit of Football League stand still in situ in the country. 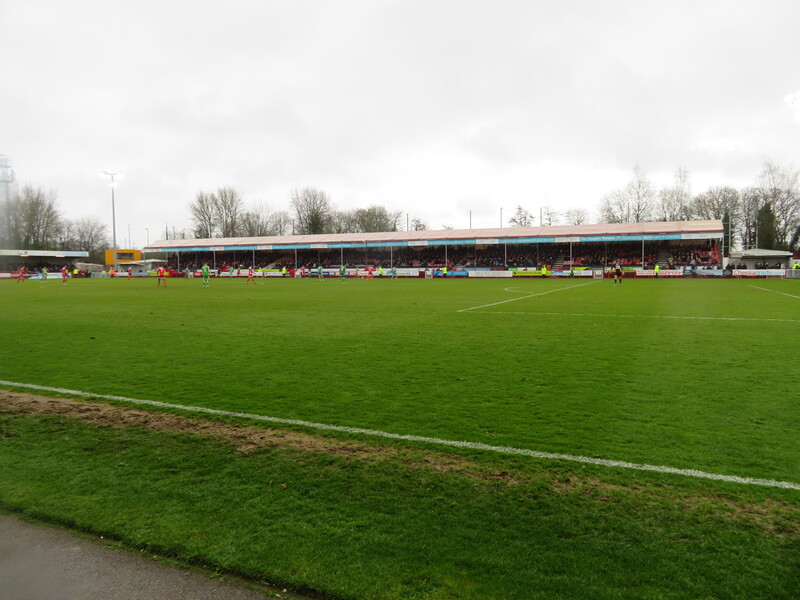 The large, domineering two-tiered stand opposite this towers over the rest of the ground and gives it a somewhat lopsided look, almost akin to that of Gresty Road, whilst the far end features a more modern seated stand. The away end seems to be pretty similar to the Main Stand on the whole and is all but connected to it with the one corner filled in between them. 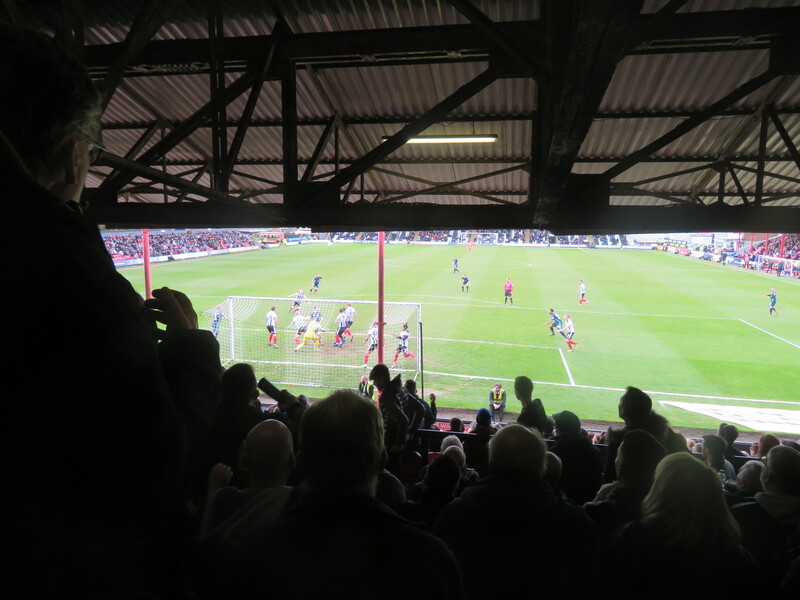 That’s Blundell Park in a nutshell, and this is the story of the Mariners…. 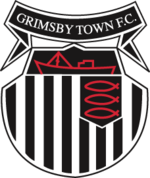 Grimsby Town Football Club was formed in 1878 as Grimsby Pelham by members of the Worsley Cricket Club, though would only spend a year under that name before changing to their current Town name. 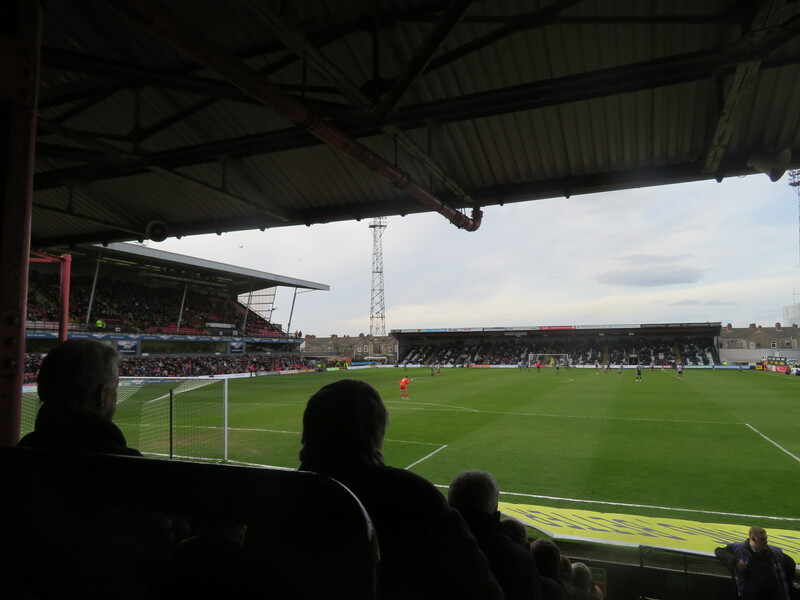 The club moved into Blundell Park in 1898 after spending time at locations on Clee Lane and latterly Abbey Park, first competing in the Combination from 1888 and, upon the league’s collapse shortly after, applied and failed to join the Football League – instead heading to the Football Alliance. However, their stay here would be rather brief and 1892 saw Grimsby accepted to the newly expanded Football League’s 2nd Division. The title was won in 1902 along with promotion to Division 1 but after spending two years in the top division, they were relegated and returned to the non-league ranks within a decade. However, their time outside the League ranks was short, the Mariners winning the Midland League title in their sole season out before replacing rivals Lincoln City by virtue of election process. Interestingly, Grimsby and Hull City were the two teams allowed to compete on Christmas Day due to the fishing trade’s demands, though this would later fall out of use as the trade became less of a bind. Meanwhile, the era around WWI saw Town immediately relegated to the new Third Division in the first season post-war, and though 1921 saw the club play against the newly accepted Southern League but an equivalent Third Division North was created the next season with Grimsby subsequently switching. By 1929, Grimsby were back in Division 1 where they stayed until 1939 (outside of a two season stint out between 1932-’34) recording their highest finish of 5th in Division 1 in 1935. Town reached the FA Cup semi-final in 1936, losing out Arsenal at Huddersfield’s Leeds Road ground. They did so again in 1939, but again were on the wrong side of the result, and this time to Wolverhampton Wanderers in front of a record Old Trafford crowd. Post-WWII, Grimsby were relegated from Division 1 in 1948 and have not returned since, with the vast majority of the 50’s & ’60’s saw the Mariners flit between the Second and Third Divisions, the latter of which ceased to be regionalised during this time. Under Bill Shankly, Town finished as Third Division North runners-up to local rivals Lincoln City in 1952, missing out on promotion due to only one from each region going up at the time. Shankly would later depart, though Town were still promoted as champions in 1956, despite having to apply for re-election the previous season, in doing so, becoming the only club to go from that extreme to the other consecutively. However, things would soon turn to the wrong side again and by 1968 Grimsby were in the 4th Division and were again forced to seek re-election successfully the next year upon ending the campaign second-bottom. Again things would soon look more rosy for the Mariners and they lifted the Division 4 title in 1972, going on to spend five seasons in Division 3 prior to relegation in 1977,though they would return just two years later. They would take promotion form into a further season as the club took the Third Division championship and returned to Division 2 where they’d remain until 1987 when a horrendous run of form saw them drop from 8th to the drop zone. The following year saw a second consecutive relegation suffered and Grimsby were again back in Division 4. Not only that, but Grimsby also, had to stave off a very real threat of going under altogether. They Would do so happily and continued on to a swift return to Division 2 by 1991. Division 2 would become the Division 1 upon the Premier League coming into being the next year and Grimsby set about setting the ground works to be a steady side in the second tier. They remained there until 1997 she was they were relegated once more, this despite the efforts of the legend that is Clive Mendonca. 1998 was a good season for the team and after a 3rd placed finish in Division 3, Grimsby would make a double appearance under the twin towers of Wembley, and the first of which saw them defeat AFC Bournemouth (not just Bournemouth remember, that’s a different club altogether) to lift the Football League Trophy, having defeated Burnley in the Northern Section final to get there. Their second was in the play off final where they met Northampton Town and again were successful, a 1-0 triumph meaning Grimsby were back in Division 1 – and with a 100% Wembley success rate! This spell wasn’t particularly good for Town and they regularly battled the drop over their five-year stint, eventually going down in 2003, though they did record victory over holders Liverpool at Anfield in the League Cup. Financial issues were suffered again due to the collapse of ITV Digital (I still remember the silhouette of Monkey, hanging in the background of an ad – imagine that nowadays, though PG tips has Lazarus effects it seems!) and 2005 saw Grimsby relegated back to Division 3, or League 2 as it was, and still is I suppose(! ), known. Despite a strong promotion challenge, they missed out on an immediate return after dropping into the play-off places and going on to lose out in the final to Cheltenham Town at the Millennium Stadium. 2007-’08 saw their 100% Wembley record end (though this was at the “new” one) as the Mariners lost out in the Football League Trophy final to MK Dons, though things would still go on to get worse as Grimsby were relegated from the Football League in 2010 after the best part of a century there. 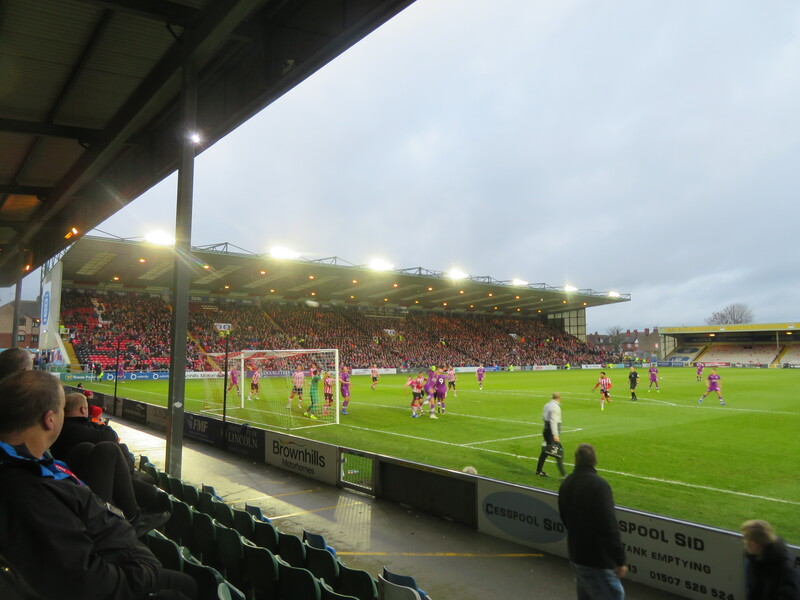 In the Conference for the first time, Grimsby started out in mid-table before finding their feet and reaching the 2013 play-off semi final, losing out to Newport County, the season seeing double disappointment after Town had previously lost to Wrexham in the FA Trophy final at Wembley on penalties. 2015 saw a second play-off place reached, but again the club were defeated on spot-kicks this time in the final to Rovers, as the new Wembley proved less kind than its predecessor. However, it would finally reward Grimsby for its persistence in 2016 as they overcame Forest Green Rovers in the National League play-off final under the arch to return to the EFL League 2 after six years away, despite having suffered a second FA Trophy disappointment months earlier at the hands of FC Halifax Town. They have finished the last two seasons in 14th and 18th as they look to gain a foothold with a view to another rise up the leagues, akin to those that they’ve done before. The game got underway and there was little in the way of action early on with the first twenty minutes or so seeing just the one shot per side, Martyn Woolford seeing a shot comfortably saved by Bury stopper Joe Murphy in the 9th minute, whilst Jay O’Shea saw his own effort kept out by Murphy’s opposite number, and Grimsby skipper, James McKeown, some ten minutes later as both teams tested each other out. As the half continued on towards the half-hour, the game continued to be a pretty uneventful contest in truth (despite the match report on Auntie Beeb trying to convince otherwise) and after Luke Hendrie’s drive was kept out for the hosts, Bury duo Eoghan O’Connell and Jordan Rossiter both spurned chances on goal, with only the former forcing McKeown into any kind of action. The remaining minutes somewhat mirrored those of the early part as the action died out and the half came as something of a relief. 0-0 and it was…..well, grim. I was lucky enough to spend the second half in the company of Shakers fan Mick towards the rear of the stand where it turned out it mattered even less where you were for this match as even less went on to occur by the seaside. 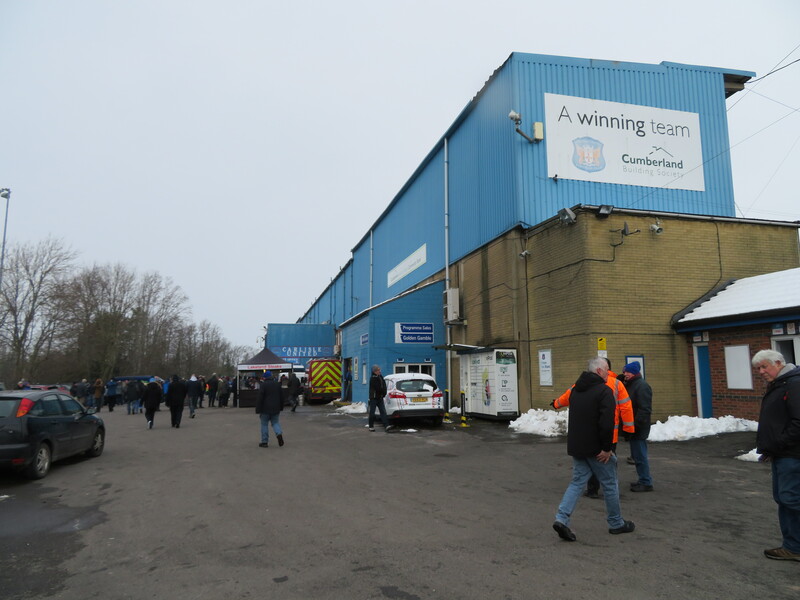 Bury, now attacking the away end, started the half strongly – O’Connell testing that McKeown was alert a couple of minutes in, whilst O’Shea fired over with the Shakers looking to press home their possible title and more likely promotion credentials. The best chances of the game would come along during the final quarter, with Bury’s Byron Moore seeing a goal-bound effort superbly blocked on the line and the resultant loose ball cleared away, before Nicky Maynard was well denied by McKeown from close range. However, the Mariners would come on strong as the contest drew to a conclusion – Jake Hessenthaler, Harry Clifton and Charles Vernam all seeing shots fly just off-target, whilst Bury would reply as Grimsby looked to drop in and consolidate late-on, but due to substitute Gold Omotayo not quite having the touch his name promised on a couple of occasions, the sides would deservedly share the spoils in a game that threatened to, but never quite got into full flow. Having lost my bus ticket somewhere along the way, I set off on the half-hour walk back into Grimsby with the goal of beating the bus – one which I achieved. 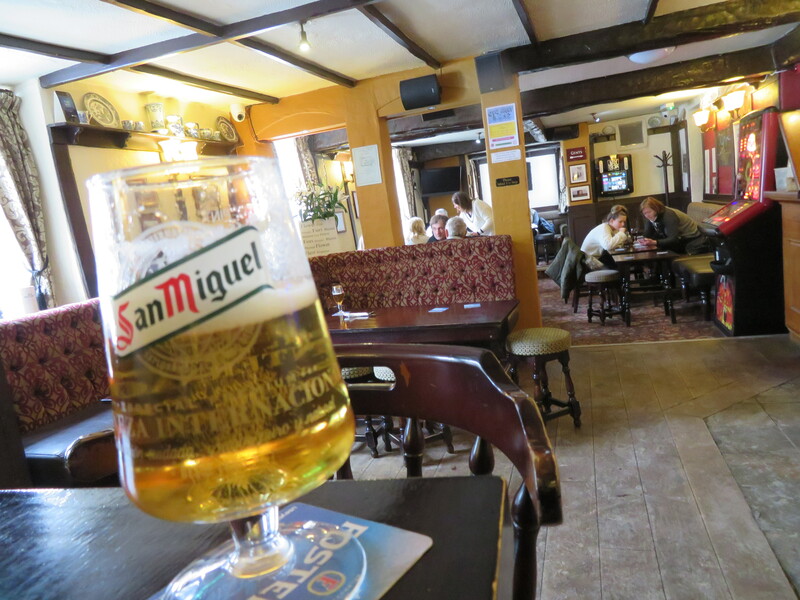 Splitting the walk up with the earlier missed Duke of Wellington, a decent watering hole, for a pint of Stella (£3.10), I then completed the day with a visit to Grimsby’s ‘Spoons offering:- the Yarborough Arms, which handily neighbours the station. As such, I could wile away the time through to the train back to Manchester without issue whilst sipping at a Punk IPA. No problems it seemed, but then I saw it. Delayed. Cancelled. Trains were falling apart and I had no idea of the cause. 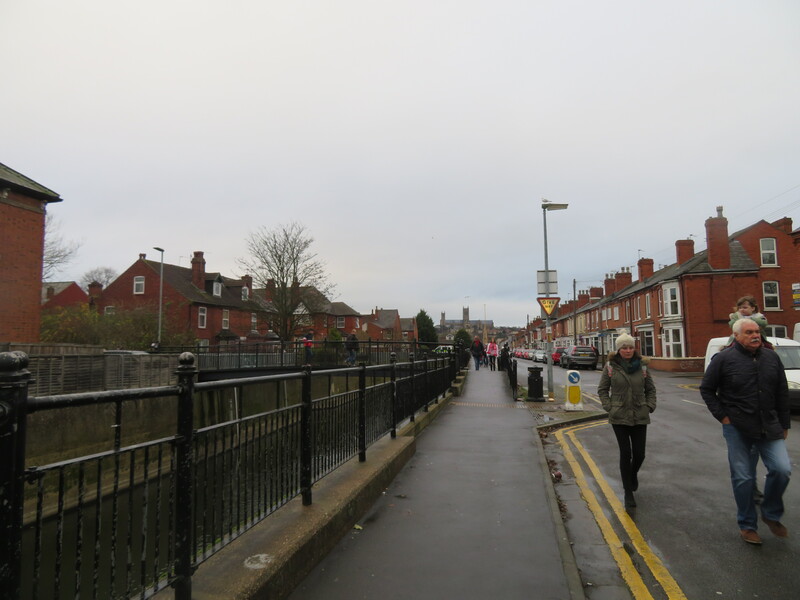 As it was, the train eventually pulled in and we set off, seemingly clear of issue….that was until we arrived in Barnetby – a place that is now ingrained in my memory for all the wrong reasons. Despite nodding off two times, both times I awoke saw us still in the Humberside outpost and we were soon informed of likely ‘alternative transport’ that was being arranged. And we all know what that means. With a Northern service stuck along with us, we soon got the news we were waiting for. After a good hour-and-a-half’s wait, the track was clear and we could proceed. As everyone piled back on, I couldn’t be arsed finding a seat and so settled in on the floor opposite a group of, who I’d later find out to be, Bury fans with conversation certainly not being of normal circumstance from one of these. Upon his disembarkation at Doncaster (if memory serves me correct), I was invited up to join the group, finding out this fella wasn’t part of their group and instead was a randomer they’d encountered whilst in Barnetby. It will do this sort of thing to you, drinks, nil-nils and Barnetby. Anyway, I’d remain with Joanna, Dave Don, Mark, Mike through the remainder of the journey (including the unwelcome switch of train at Sheffield) though we eventually rocked up in Manchester. I bid goodbye to the guys and girls from Bury and jogged off over to Oxford Road for my connection I figured I could just about make….only to miss it by seconds – I arrived just in time to see it pulling away from the platform. In some sort of slight luck, a bus was due shortly anyway and so I was still home by midnight. It had been a long day for sure, the ground being the highlight, with Grimsby’s beer offerings not being too inspiring and the game being pretty poor overall. At least the pie was decent! Oh, and I just got back my train fare in full too; isn’t it great this delay repay, when it works, that is! Anyway, onwards to another week and it’s back off over the border to a town fame for its castle…. So it’s FA Cup Second Round weekend with the attraction of the prospect of meeting one of the “big boys” in the 3rd Round the reward for the victors of each tie. Of course, for the Imps of Lincoln City, the lure of such a tie may not have been quite so attractive – what with their cup run and shock defeat of Burnley still fresh in the minds of the Sincil Bank faithful – however, a fair pay-day will always be a welcome addition to anyone’s footballing calendar. 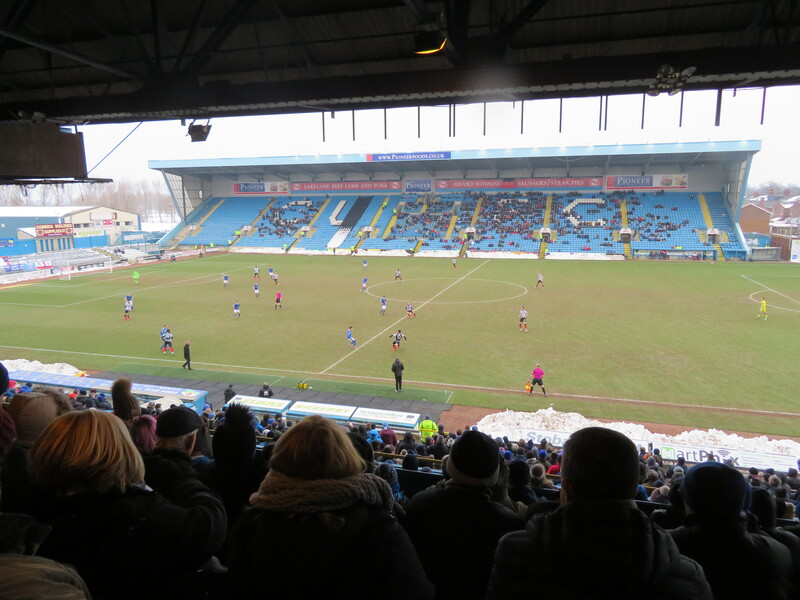 The visitors, Carlisle United, would have their own sights set on their own run, though had been presented with, arguably, one of the harder second round ties to get through. 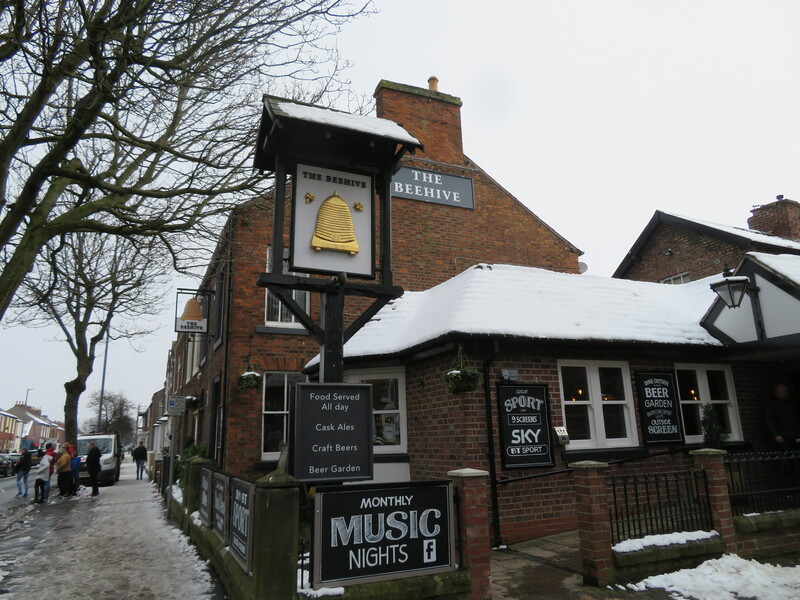 Anyway, this trip was also my regular accompanier Dan’s birthday weekend game and, as such, provided a fine opportunity to have a mooch around the famous, historic city itself…..and sample some of the local public houses, of course! Meeting in Piccadilly at a little after 8am, we were soon on our service through to Doncaster, where we’d have to endure a good 50 minutes until our connection which weren’t exactly favourable, what with the lack of Northern services yet again. Luckily for myself (in a very selfish way, I admit) I had a blog to write and so got to work both en route and whilst wasting away time in a Donny waiting room. It really was as exciting as it sounds. Soon enough, our excitement was ruined by the arrival of our service which would take us the forty-five minutes into the county town (city?) 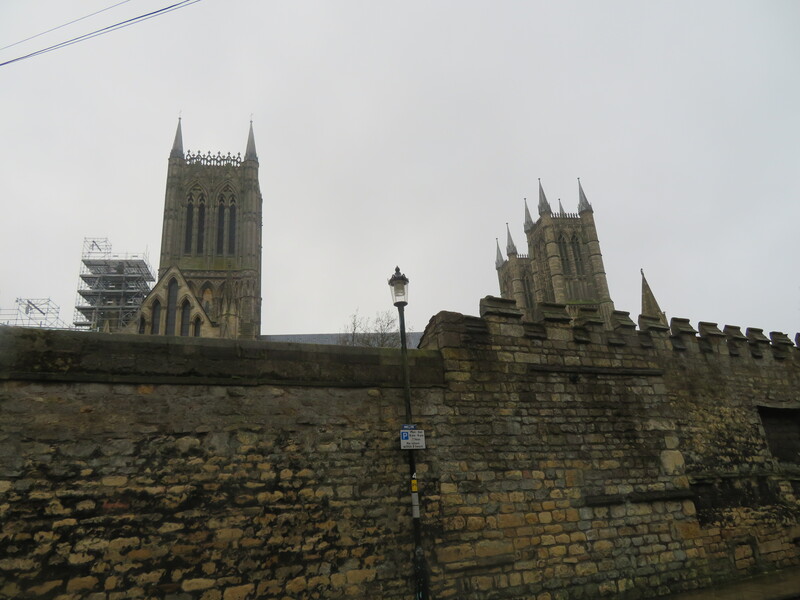 of Lincolnshire and we were swiftly rolling through the likes of Gainsborough and a couple of other stops before arriving into sight of the towering Lincoln Cathedral spires, accompanied by a drizzly, greying sky. After agreeing that grabbing a bus to avoid traipsing up the imaginatively named “Steep Hill” (which, would you believe, is rather steep), we disembarked outside the cathedral and began our “tour de Drinkoln” (sorry!) at the ‘ancient’ Lion and Snake, which apparently dates from the 16th century. 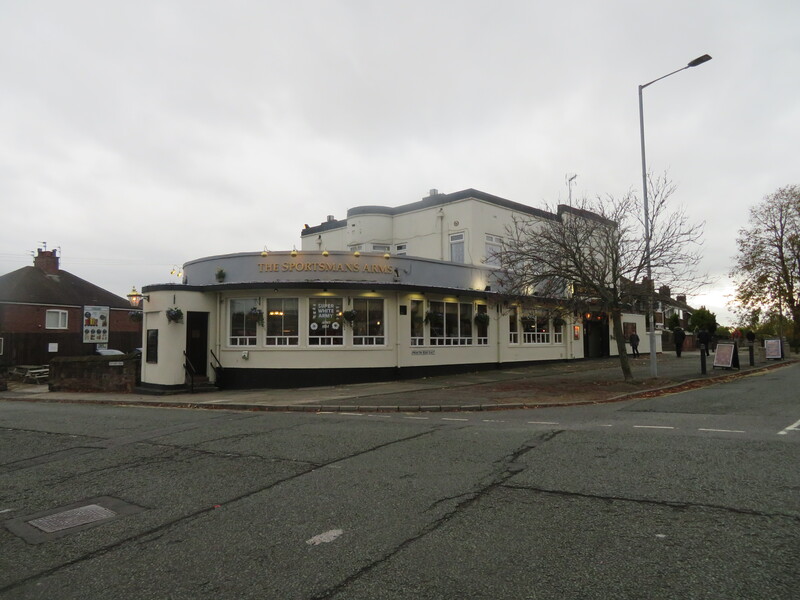 Though it had been modernised somewhat inside, it still had a-hold of a fair bit of character and was a good place to begin our day in – especially as it was the only one in the immediate area that seemingly opened before midday, the round here costing just £6.05! Lincoln is a highly historic cathedral city and the county town of Lincolnshire. 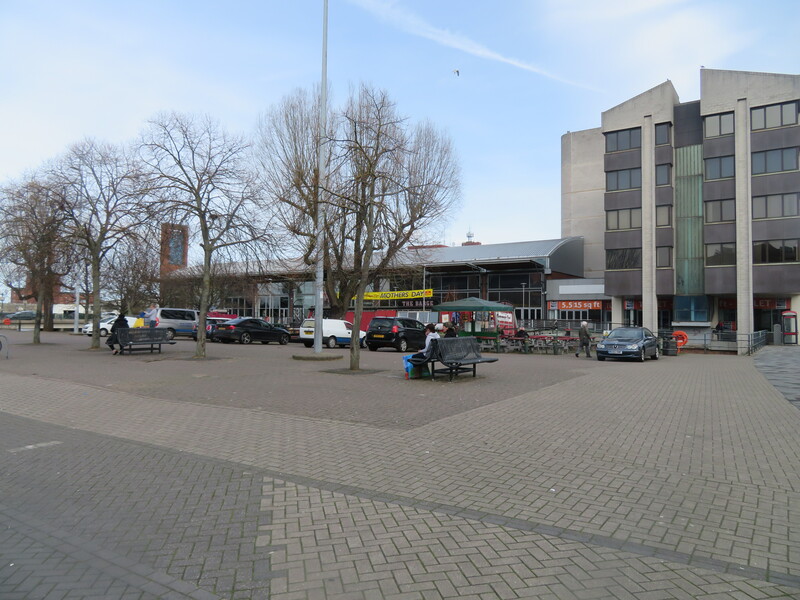 It began life in the Iron Age around the Brayford Pool area at the foot of the hill where the castle and cathedral now reside and it is thought the Brayford Pool lent the city its original name of “Lindon” (or “The Pool”). It would later become the Roman settlement of Lindum, which continued to grow up around the River Witham, with the Romans originally conquering the area in 48 AD and constructing a legionary fortress at the end of the northern part of the Fosse Way. The legions would later move on to York with the town being given the suffix “Colonia” when it became a residence for army veterans. 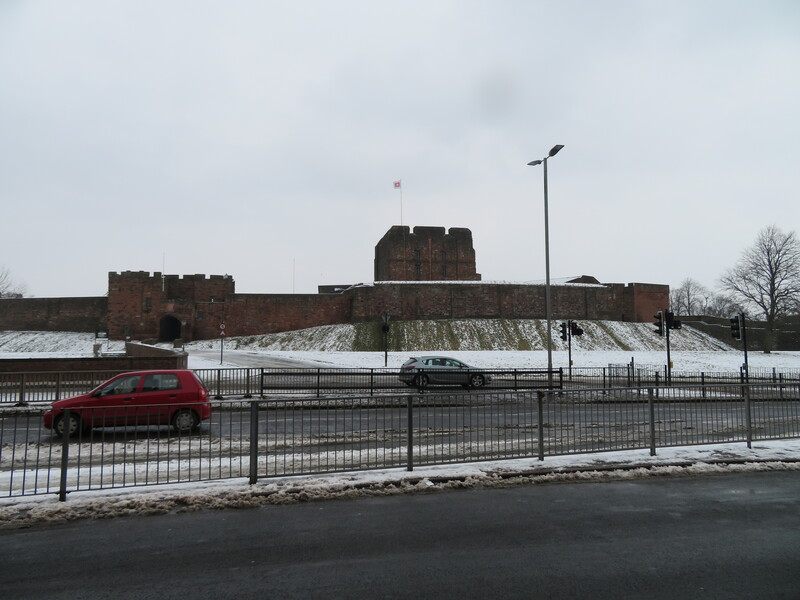 It would continue to flourish, being accessible by both the rivers Witham and Trent, though despite being thought of as the capital of the Flavia Caesariensis, would fall into near desertion by the end of the 5th century. Having its name later shortened to the Old English Lindocolina and then Lincylene, the city rose once more after the first Viking raids with and would become an important Viking trading post, which also minted its own coins. This would culminate in an explosion in the economy with the settlement of the Danes, though only the upper part of the city seemed to have been populated, for the most part during this period, though by the mid 10th century, it was being re-populated with the suburb of Wigford becoming a trading post in its own right, the castle being added in 1068 by the Normans on the orders of William I, for strategic means. The original cathedral was completed by 1092 though had to be rebuilt after a fire originally and a later earthquake in 1185. Upon its latter rebuilding, the cathedral is widely agreed to have usurped the Great Pyramid of Giza as the world’s tallest building. 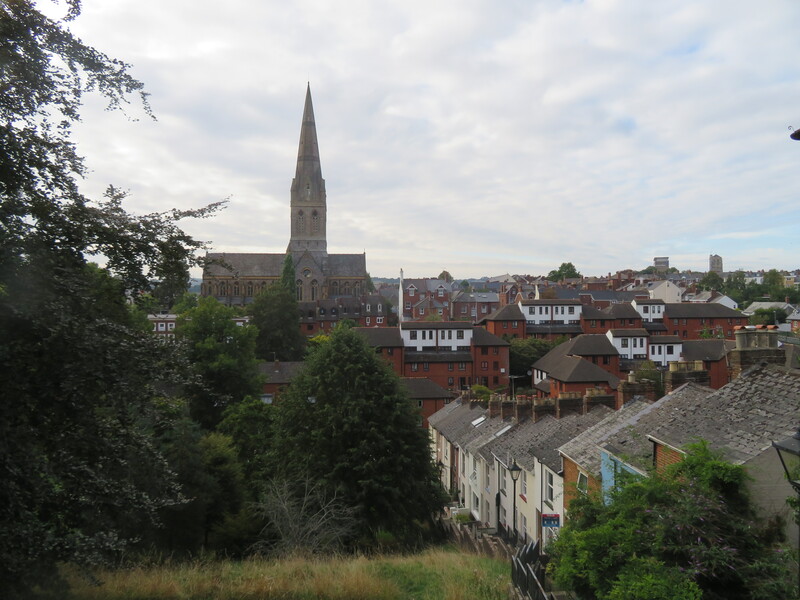 The city was the site of an 1141 battle between King Stephen and the Empress Matilda’s forces during ‘the anarchy’, with the King’s men defeated and the man himself taken prisoner. Within a decade, Lincoln had become one of the most wealthy towns in England, largely on account of its cotton and wool industries (Lincoln Green was worn by Robin Hood in legend) though would later be a scene of a large anti-Semitic riot in the 1200’s, with the large Jewish population eventually expelled by the end of the century, with 18 of the more prominent members of the community executed at the Tower of London for murder. It again saw battle in the 13th century in the First Barons War as those who’d aligned with the French fought the English and lost, and the Second Barons War saw one of the aforementioned attacks on the Jewish people occur, as the synagogue was ransacked and debt records burned. Made a county in its own right in 1409, it would enter decline within the next century or so, and the dissolution of the monasteries didn’t help its cause. Seven were closed within the city, with the cathedral’s spire rotting away and collapsing and never replaced, a signal of the decline in political and economic fields. 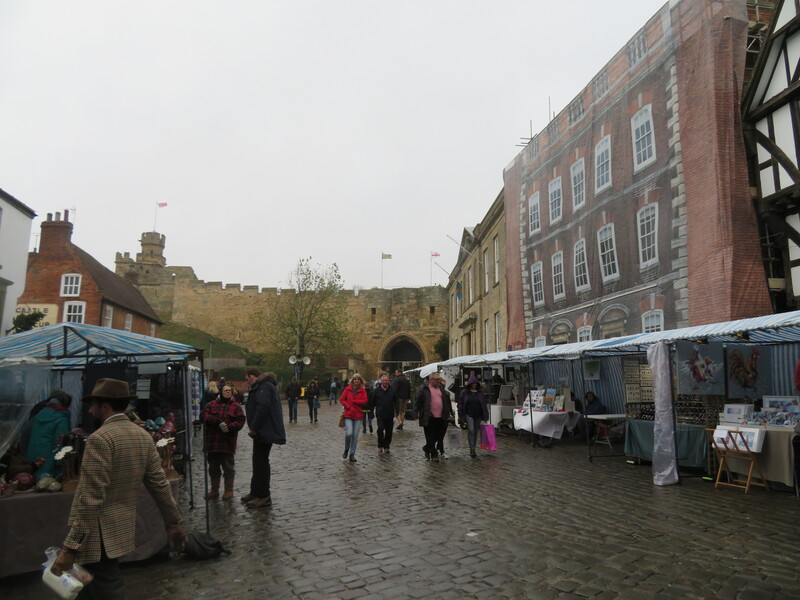 During the Civil War, Lincoln was on the borderline of the Royalist/Parliamentarian forces and therefore changed hands on a number of occasions and its ability to trade and create saw the city decline further into a “one street town”. 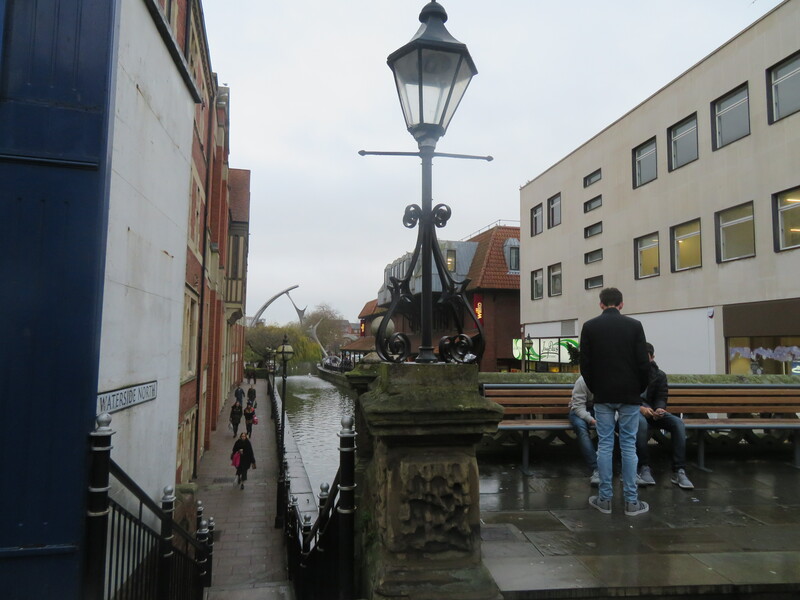 The Georgian-era would see the Agricultural Revolution begin to help Lincoln recover and the re-opening of the Fosse Canal saw trade and industry become far easier to take part in. Lincoln grew in both economic and geographical ways and the Industrial Revolution of the 19th-century saw this continue, the railways seeing locomotives and heavy machinery made and many (latterly) large companies take residence and 1857 saw a permanent military base set up. The early twentieth century saw the city hit by a couple of disease epidemics, but it would recover and become a big player in wartime production, the first tanks being made in Lincoln and this was added to with aircraft and the like during WWII. Toward the end of the 20th century, the heavy industry began to fall by the wayside, though the area around the growing university has seen the city continue to grow in size and the city is also home to its famed Christmas Market. Finishing off my pint of Hop House (whilst Dan was on a Carling binge for some reason), we headed off towards the castle walls and the Strugglers – the board outside portraying a guy struggling at the gallows in an explanation of the name! This was a real old school pub, tight and cosy and split into two parts, with one being pretty much behind the bar in what is more of a living room than anything else. 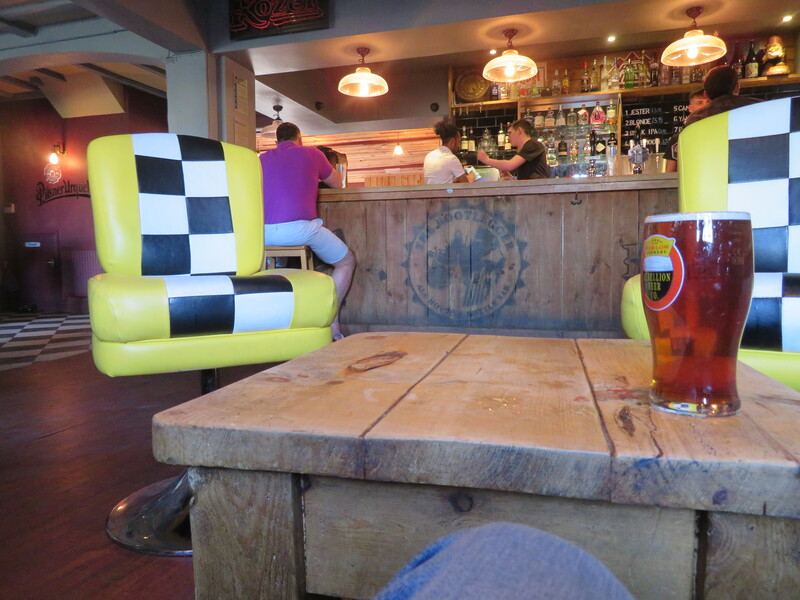 A nice little place to have a pint and I opted for a pint of the Cornish Pale Ale, whilst Dan went for…. *sigh* Carling. Deary me, though at least the rather pocket-friendly prices continued at £7.05. 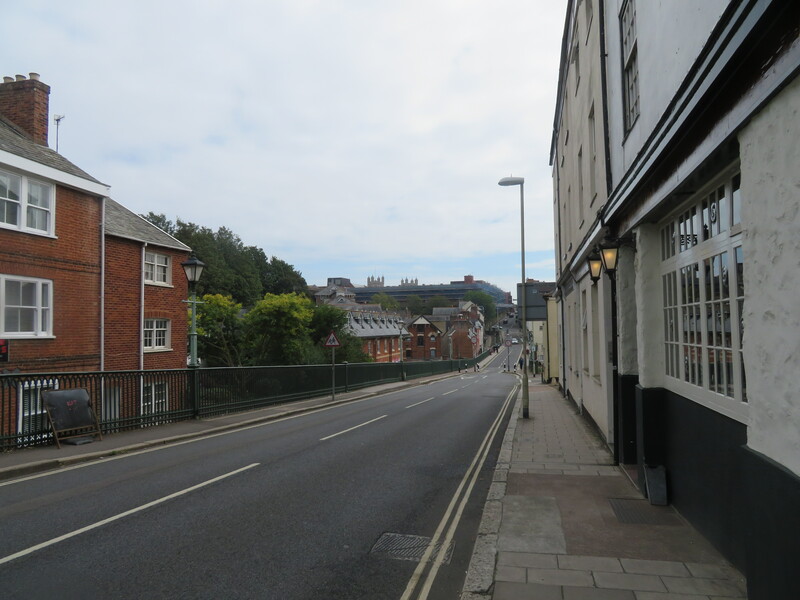 Unfortunately, the Victoria around the corner is closed on Saturdays apparently (according to Maps at least) and so we back-tracked towards the top of “Steep Hill” and to the Magna Carta, just outside the castle’s main entrance. 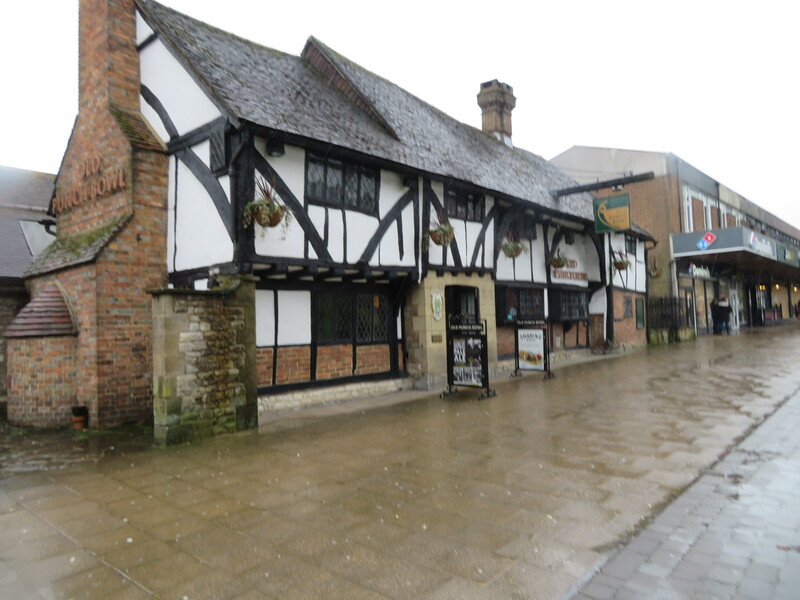 This was another apparently old pub, its name coming from the 11th century copy of the book of the same name (one of only four) which resides within the stronghold opposite though, to my eye, this had gone slightly the wrong side of modernising. As I said to Dan at the time though, this could, of course, have been impossible to avoid for one reason or another, though this isn’t to say its a bad place, far from it in fact. The pint of Estrella was really good too, whilst Dan remained on his tried and tested formula, the round coming in at a touch over £8.00. Unfortunately, we couldn’t spot the Imp hidden somewhere within the Magna Carta before we departed down “Steep Hill”, bypassing the small-ish bar on the way down in preference of getting to more within range of the ground itself. Well, that was the plan anyway, until we came across the Cardinal’s Hat (not an actual hat) and I decided we couldn’t go on by without popping in, especially with it being only about twenty minutes walk away from the ground. With that being said, this would be our final stop pre-match, with Dan’s Carling vigil coming to an end with the self-badged Cardinal’s Lager going to him instead (via the recommendation of the barman), whilst I ventured a little more to try out the Swiss Stiegl, a round of £7.75. I’m not sure what it is with Lincoln and the 5p thing, but it did allow me lighten the load via a fair bit of shrapnel. Finishing off in here, we headed off straight down the high street and over the level crossing in the nick of time to avoid the dropping of the barriers, arriving at Sincil Bank a little before quarter to three, despite having somehow got separated in the crowds whilst heading around the far end. 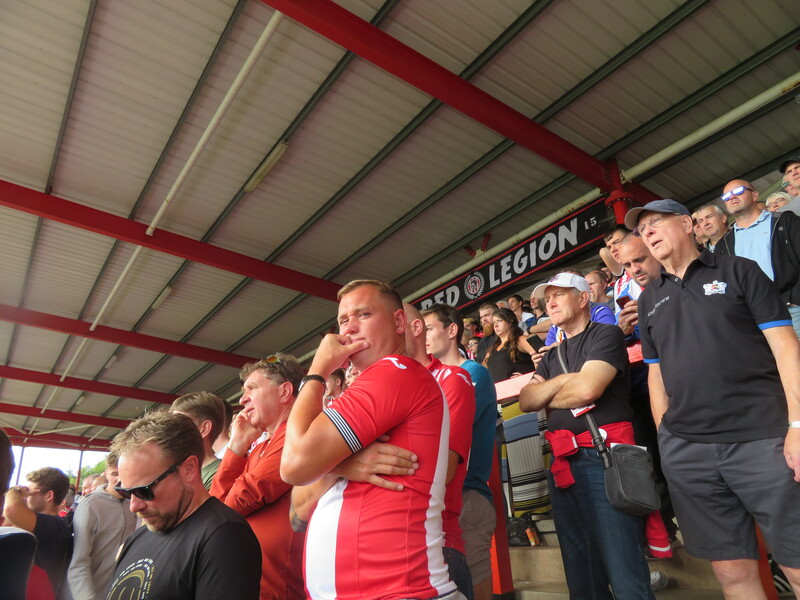 Eventually having re-united, we handed our £15 over at the turnstiles and were into Sincil Bank and we went about sorting out a pie pre-match, myself opting for the Steak pie in the end with my initial option being off the menu, only to result in an upgrade, in my opinion. Anyway, the ground is all-seater, with two larger stands, one to each side, being joined by two smaller stands, with these running the width of the pitch at either end. The cathedral was just about visible from our viewpoint, its spires peering above the stand opposite. 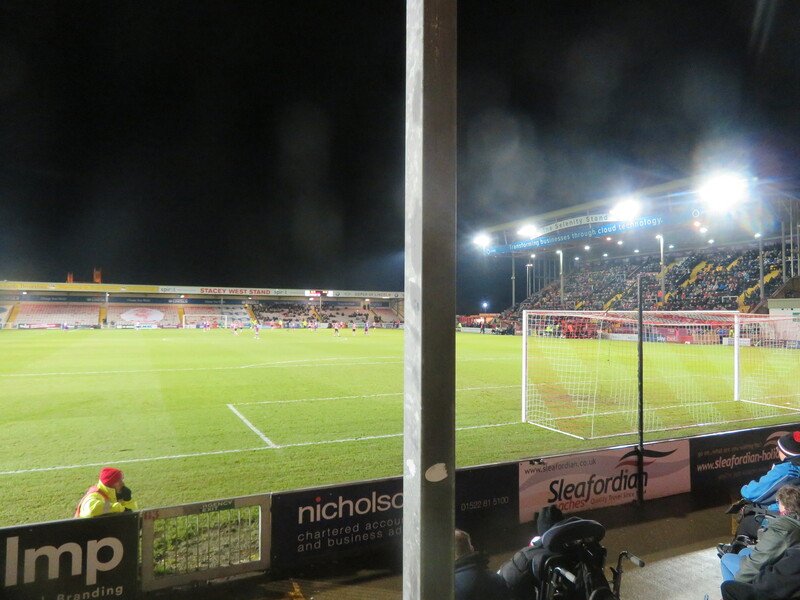 That’s Sincil Bank in short and this is the story of Lincoln City…. 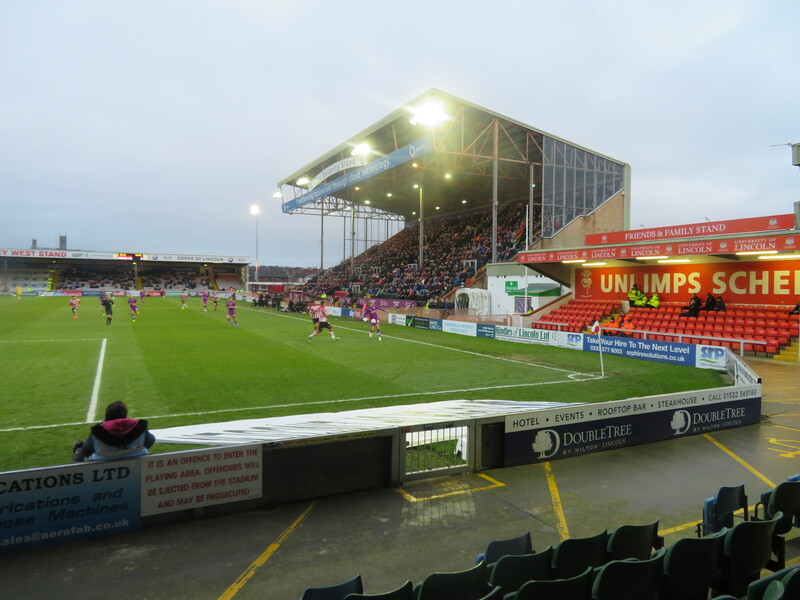 Lincoln City Football Club was founded in 1884 as an amateur outfit, though football had been a prominent player in the city since the mid-19th century, with the major player before City being Lincoln Rovers (née Recreation) who had disbanded the same year. Their first competitive games would be highly successful affairs, with City coming out 9-1 Victor’s over Sleaford in their opener, before thrashing Boston Excelsior 11-0 in their first home clash and their first silverware arrived in the form of the Lincolnshire County Cup, with a 2-0 replay win over Grimsby Town. However, amateur status at the club would be short-lived and Lincoln would turn professional come 1891, and moving from their original John O’Gaunts home to Sincil Bank in 1895. Come 1892 and the recently undertook professional switch allowed a move into the Football League, with Lincoln taking a spot in the newly formed Division 2. After moving from the old ground on account of the landlord’s passing, Lincoln’s first game at the Bank ended in a goalless draw, with the first competitive game – against Arsenal – ending in a draw also, this time one-a-piece. Through to the 1920’s, the Imps spent time yo-yo-ing between Divisions 2 & lower leagues including the Midland and Central Leagues. However, they would form the next new expansion division of the league in 1921, taking a spot in Division 3 (North). Again, Lincoln would spend a large period going between both the Second and Third Divisions right up until the 1960’s, when they would eventually drop into the Fourth Division, the regionalised system of the third tier having long gone. Season 1975-76 saw Lincoln make history in scoring 75 points under the 2-point for a win system, which stands as the record under these rules, and take the 4th Division title in doing so, whilst also becoming the first side in almost a decade to pass 100 goals, these feats coming under the late Graham Taylor. The early 80’s saw City narrowly miss out on promotion to Division 2 in both 1982 & ’83 and tragedy would later strike both Lincoln and Bradford City in the terrible Valley Parade fire, which claimed the lives of 56 people, the two City fans killed remembered in the Stacey West Stand, the two men’s surnames. The following season saw Lincoln relegated to Division 4 once more before suffering the drop into non-league at the end of the very next campaign. The club soon recovered, becoming the first club to be promoted from the Conference (as opposed to being elected) as Champions, they would cement their spot back on the League, though the end of 2001-’02 saw them enter administration. Despite this and an overhaul of the squad to make ends meet, the late Keith Alexander almost got the side promoted, rather than suffering the dreaded drop, only losing out in the play-off final to AFC Bournemouth. They would repeat the trick following Alexander’s recovery from a brain injury, losing out in the 2004 semis to another future Premier League outfit in Huddersfield Town. 2005 saw a hat-trick of play-off appearances under Alexander secured, and despite defeating Macclesfield Town on the semi finals (whom Keith would be managing at the time of his passing of course), they would go on to suffer final heartbreak once again, this time at the hands of Southend United. A fourth straight play-off spot was made in 2006, though Alexander would depart the club at the end of the next season after disagreements with the great and good. Despite and prior to this, Lincoln again made the play-offs for a fifth successive season, but defeat in the final to local, rivals Grimsby Town saw them become the first club to lose in four consecutive play-off finals. They again made the play-offs in 2007 after finishing 5th – the highest Lincoln have finished in qualifying for them – though would lose out once again, again setting a record for the most unsuccessful consecutive play-off campaigns. Worse was to come though and after a few unsuccessful years and managerial changes, the club were relegated back to the Conference in 2011 after a poor late season run. Struggling the next season to just above the Conference drop zone, a change of management saw results improve enough to ensure safety, whilst cup runs were also non-existent. After another season where safety became the main aim, a few seasons of mid-table security followed prior to the appointment of the Danny Cowley as boss for 2016-’17. Their league form, though initially inconsistent, turned into a promotion chance and after defeating seemingly runaway leaders Forest Green Rovers after a late comeback, reeled in their 12-point advantage to take the National League title and with it promotion back into the League 2. The seasons also, saw the Imps embark on their famed FA Cup run when, as a non-league outfit, they made the quarter finals by defeating Premier League Burnley at Turf Moor before bowing out to Arsenal, their first Football League opponents. Last season saw Lincoln get their hands on silverware in the form of the much-maligned EFL Trophy, as they at least overcame an u21- side, Chelsea, in the semi-finals, securing their first Wembley appearance in the club’s 134-year history. 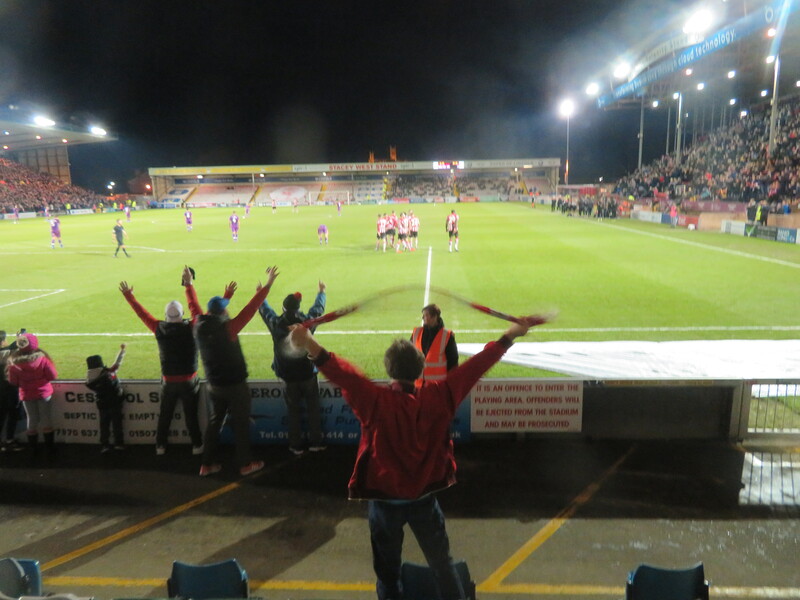 It would prove a fruitful visit as the Imps overcame Shrewsbury Town to lift the trophy by a solitary goal and have started this season strongly and are in a good position to push on and look for promotion back to the third-tier of English football. 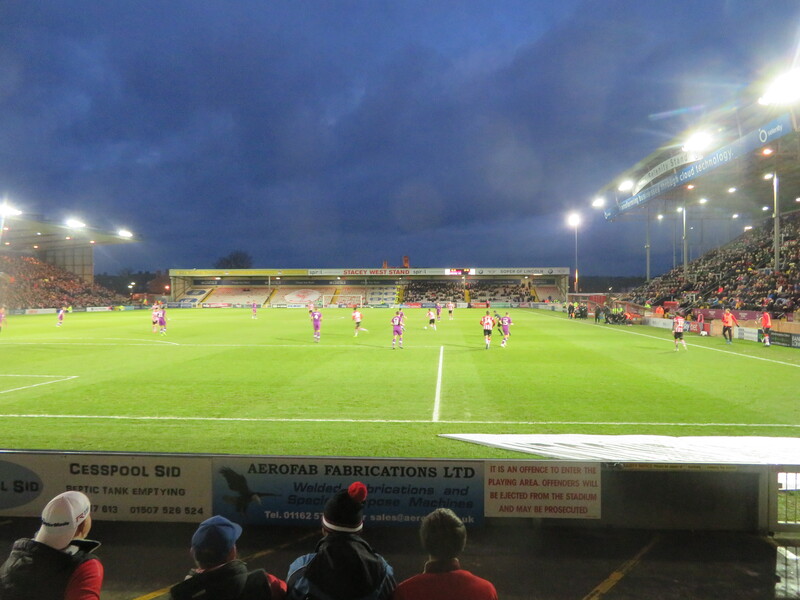 The game got underway after a minute’s applause in commemoration of the career and life of the late Kevin Austin, who had spent time at the Imps during his time as a player, and in the complete opposite end of the spectrum to Tuesday night at Old Trafford, the deadlock was broken immediately, as Matt Rhead netted within 30 seconds, meeting a Bruno Andrade delivery to control a close-range volley into the back of the net. Quite the start and certainly the quickest goal I’ve seen for quite some time, and possibly the second quickest I’ve ever seen I suspect, beaten only by a 21-second Llandridnod Wells goal a couple of years back. That game went on to finish one-nil. Surely, history wouldn’t repeat itself here….could it?! 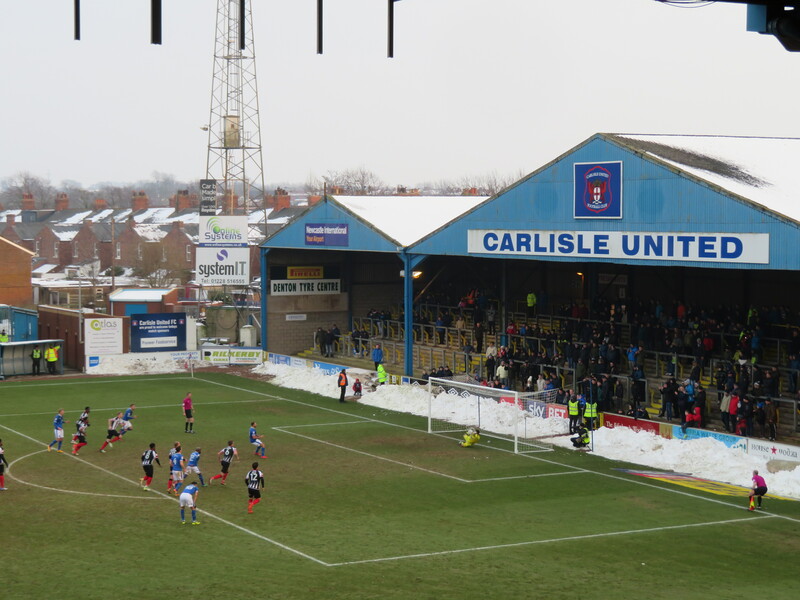 Neal Eardley went close shortly afterwards, his free-kick hitting the side-netting just the wrong side of the post from his perspective, whilst Adam Collin between the Carlisle sticks had to pull off a fine save to deny the second Matt up front – Matt Green. However, Lincoln were almost made to pay for these missed chances when a deep cross wasn’t fully cleared and the ball came to Regan Slater who’s shot from the angle flew through a group of bodies, somehow evading everyone, with the ball smacking back into play off the upright directly in front of us. A wake-up call for the hosts that it wouldn’t be all plain sailing for them and Josh Vickers in the Lincoln goal had to be alert to dive away and tip over a Richie Bennett drive that looked destined for the top corner. Lincoln would go close again at the end of the half, Harry Anderson’s drive across goal going narrowly wide of the mark, as the sides headed in at the break with that early goal still separating them and it looked as though the first-minute curse would strike once more. 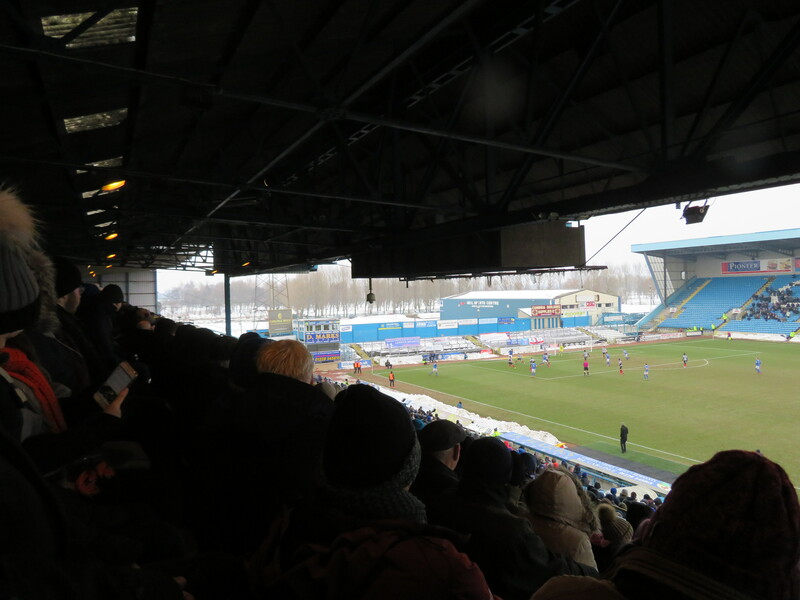 The second-half began with the familiar fifteen-to-twenty minute spell of the side behind coming out strong with Carlisle, now attacking the end at which their band of supporters were situated, striving to get themselves back to parity. Regan Slater had the better of the sights of goal the Cumbrians would create during this spell, with his effort flying over the crossbar before Lincoln began to regain the front-foot and went close with a few efforts that were well defended by the solid Carlisle defence, until on came John Akinde, a man who always seems to find the net when I am about. I commented on the fact to Dan as well and gave him a confident prediction that the former Barnet man would bag under the ever more dominant Sincil Bank lights. However, it would be Lee Frecklington who’d twice go close to finding the net and putting his side two-up. First, he hit a crisp volley which Collin flung himself at to his right and pulled off a fine save (even better at close quarters) to keep his side in the contest and he later scuffed an effort up and over the bar when he ought to have done far better. If the contacts had been reversed, he would likely have been far happier! However, these missed chances wouldn’t prove to be vital as that man Akinde popped up with around four minutes left to slide home a low cross by the impressive Andrade at the back-post to seal the Imps’ place in the hat for the Third Round. That would prove to be that for the game in truth with the whistle going after a few minutes of stoppages and we beat a hasty exit and popped in to the nearby Shakespeare pub, which was the first we came across, just at the top of a side-street leading to the main road from the bridge over the stadium neighbouring stream. The highlight in here? 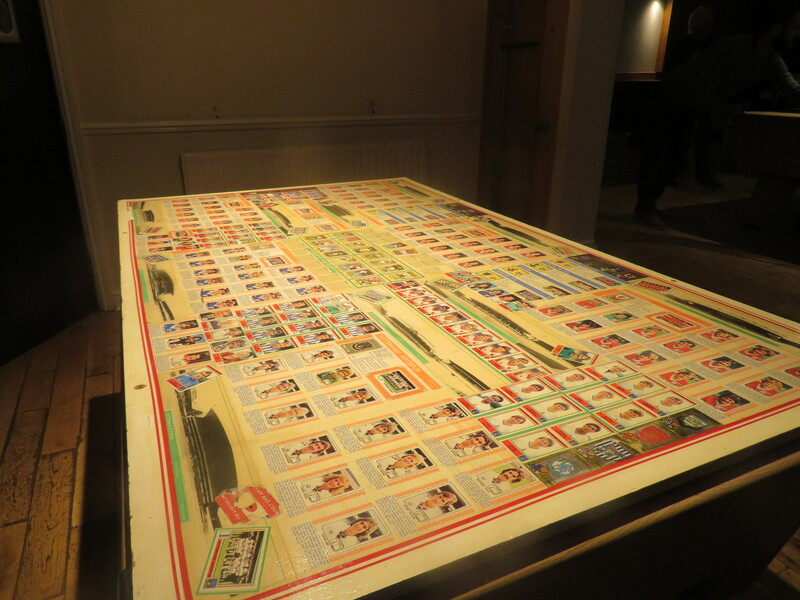 The pool table being covered by a 1978-’79 (that’s what we tried to decipher, anyway) season sticker collection. Finishing off our drinks of a Heineken and Carling – yes, normal service was resumed – which came in at the now standard £6.90 with an extra 5p, we grabbed a bus from right outside and up towards the station. However, we weren’t ready to depart Lincoln just yet, no sir. 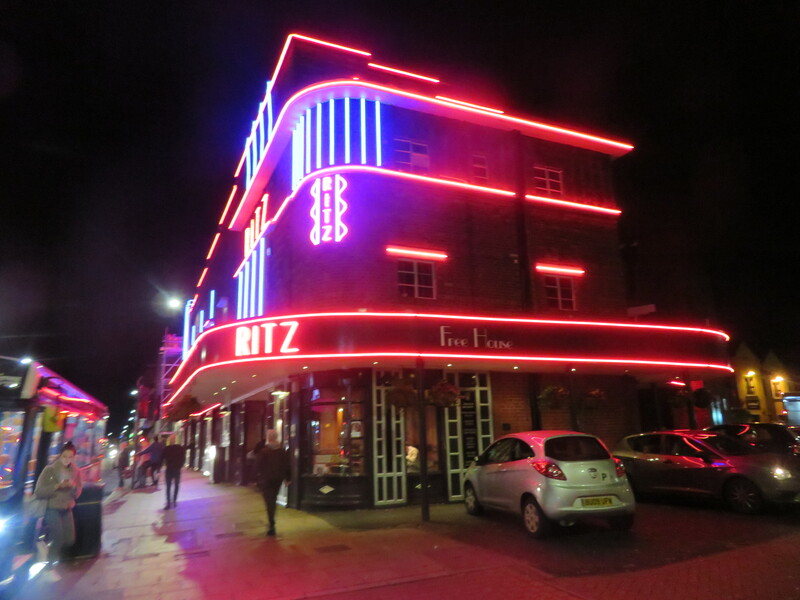 First, we had stops at the Ritz Wetherspoon’s (a former theatre) which is far more impressive from outside than inside to be honest, where I got a Punk IPA for £3.95, and the interesting looking Treaty of Commerce, a narrow Tudor-style, wood-clad building just short of the level-crossing, where we had a round of Kronenbourg and Carling whilst breaking into an occasional sing-along on account of the fine tunes being played out. By the point I’d finished my pint, Dan had decided to play safe on his drink here and so I headed off over the crossing to the Witch and Wardrobe, which sat next to a nicely lit church and another small waterway. 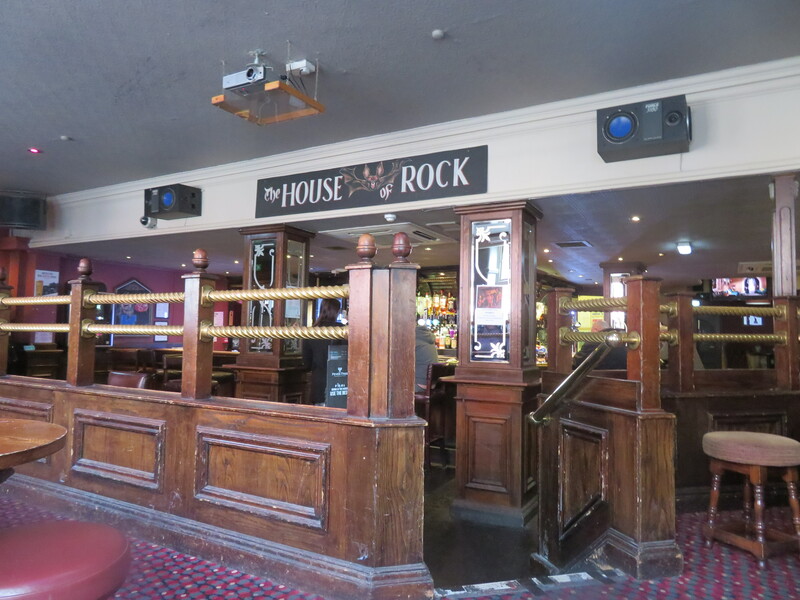 After a quick pint of Strongbow in here whilst suffering through the last few minutes of the Southampton-Manchester United game, I headed back to the station and Dan prior to boarding our train back to Doncaster and then onwards back to Manchester once again. On the second train, we got talking to Rochdale fan Chris who had got us agreeing to go to Spotland the following day to watch their cup tie against Portsmouth. Unfortunately, things would conspire against us, causing these plans to go awry, and so my weekend came to a premature end. At least the Saturday had been a fine one! 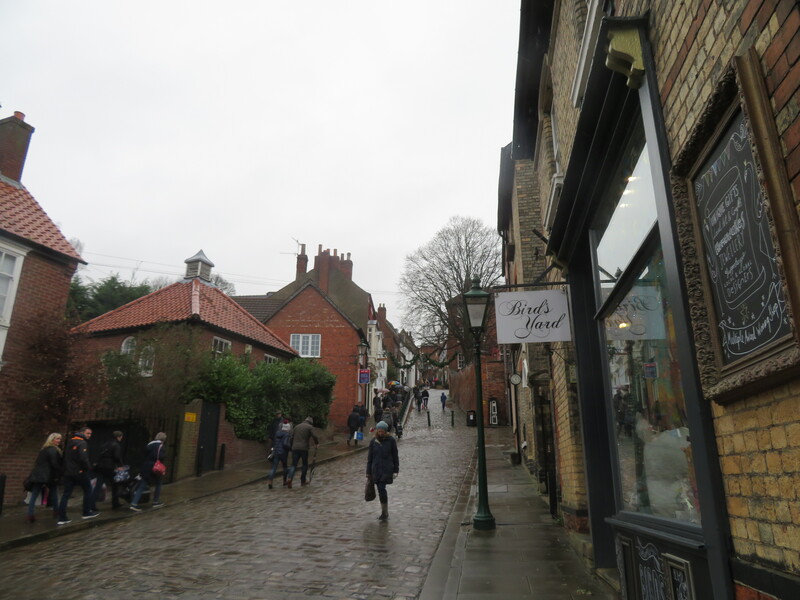 Lincoln is a brilliant city and it was certainly far cheaper than I suspected/feared! The game was decent, the ground the same food and programme both of good quality (the latter surprisingly so, as they usually seem to be cut-back issues in the Cup most places) and the travel went as well as could be expected, all things considered. So on to next week and a return down to the Big Smoke for the first time this season. In true GTA San Andreas style, Gunners will be involved. I’ve just gotta follow the damn train…..! I’d already visited Tranmere Rovers’ Prenton Park, but that game was in the Cheshire Senior Cup and, as such, I always felt as though it was one I couldn’t really count (first team games only at regular grounds being a rule of mine now). So when I found myself with an empty weekend and not looking to travel all that far, I felt it looked like a perfect storm was forming on the banks of the River Mersey. Back to Birkenhead I would be headed and for Rovers’ home clash with fellow League 2 high-riders Exeter City. With the never-ending RMT strikes still taking their toll on the local rail system up North, I was forced into an earlier than ideal start, though this did mean a quicker service to Liverpool Lime Street was in service, so I guess there was some silver lining to be found within the mayhem. Having arrived in Merseyside, a quick trip down into the depths of the station’s Merseyrail system platforms had me on my way under the river and into Cheshire (I hope that gives me some brownie points with the locals! 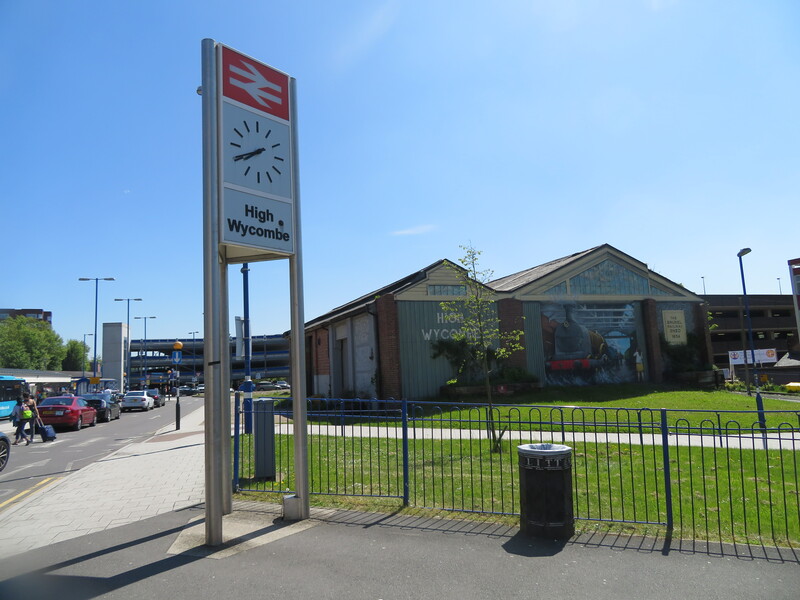 ), the short trip to Birkenhead Park station taking just 15 minutes. With the time being way too early for beer, especially with regards to my 11am self-imposed acceptable start-time, I decided to pay a visit to the park which supplies the station with its name. There was a fair amount to see too, including some discarded pumpkins, a man mowing a cricket pitch and some joggers. Exciting just doesn’t cover it. 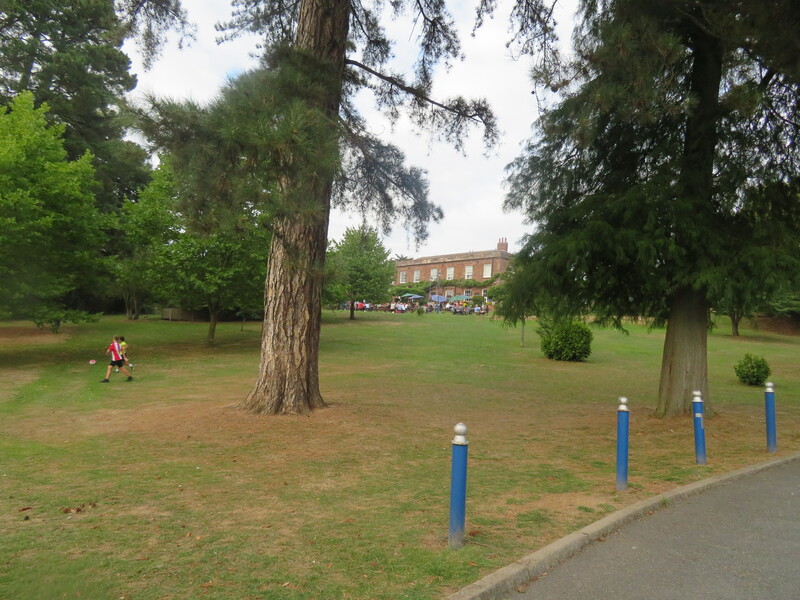 Having spent a good 40 minutes exploring the town’s large greenery, I passed the grand (no joke this time) pillared entrance to the park, the time was slowly ticking towards eleven and so the DRINK – said in Father Jack voice – was on the horizon. 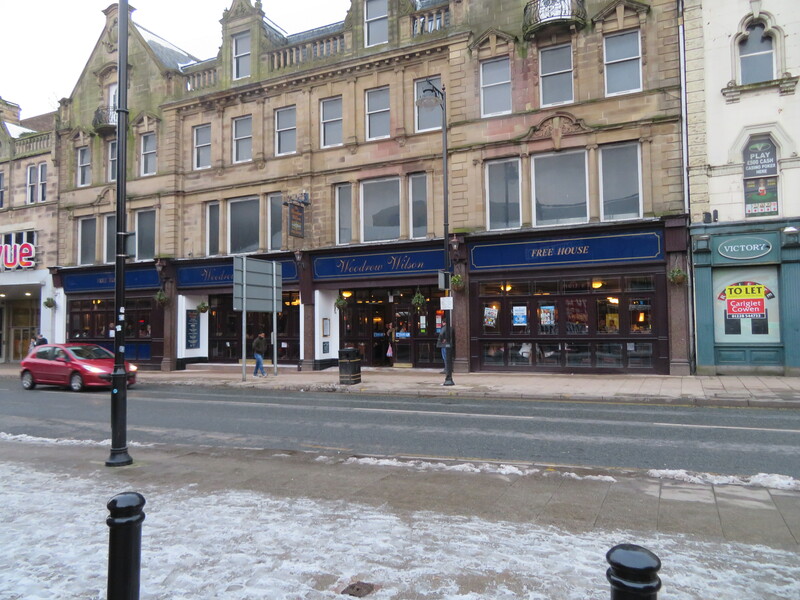 As such, I looked for somewhere to begin my tour, though these looked to be very few and far between at that hour and so I chose to err on the safe side and opted to pay a visit to the Wetherspoons first. The Spoons here goes by the name of the Brass Balance, though my visit wouldn’t be too smooth as my ordered Baltika would turn into a Bud as it was served. Not one to care too much, I took said bottle and settled in to begin the final bits of my Sunderland blog from my previous week. Oh, and I’d get that extra Baltika back later on. 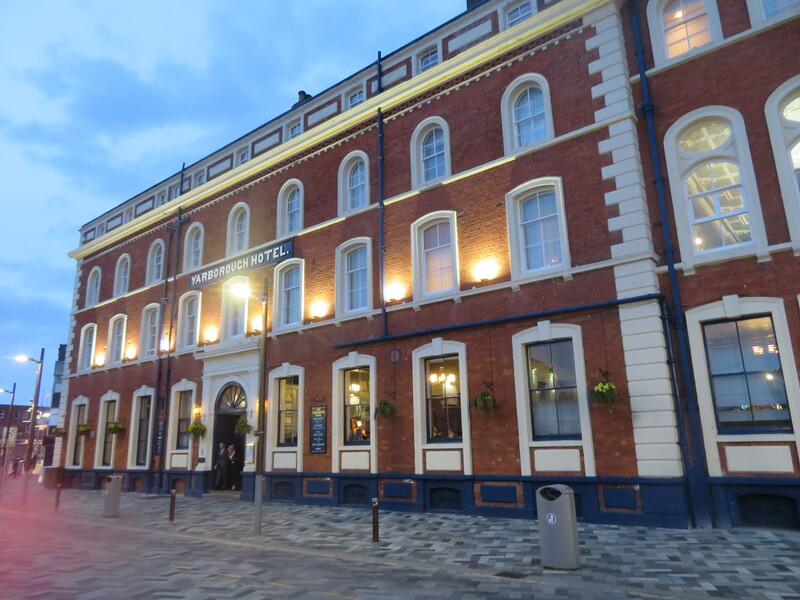 From there it was off towards the river and the ferry terminal, with the Liverpool skyline looming over the Mersey as I entered my second stop-off of the day: Gallagher’s. 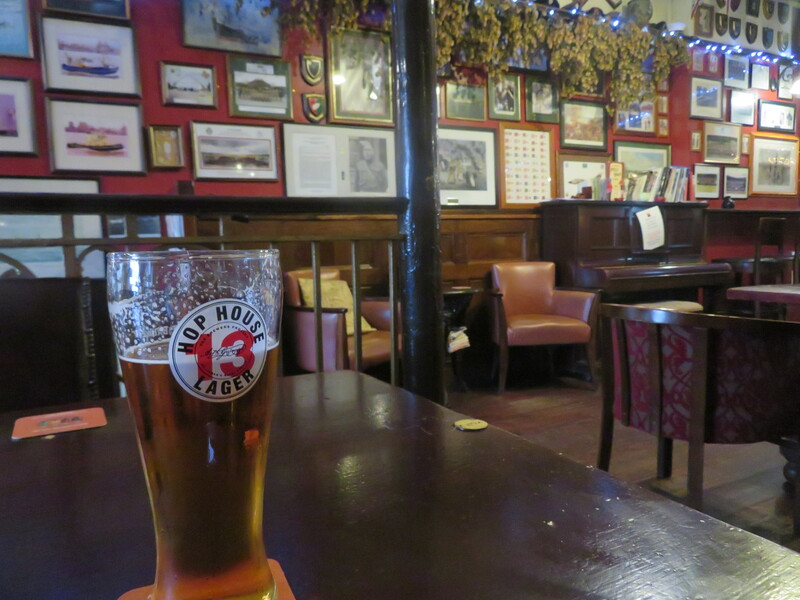 This pub is a brilliant little place, filled with an assortment of maritime paraphernalia all over the ceilings and walls including a story of a legend of H.M.S. Birkenhead’s ‘heroic’ (bar the gunpoint bit) act which lends its name to the “Birkenhead Drill” – the “Women & children first” call came to be on the ship for the first of only two occasions for it to have taken place. A pint of Hop House here came in at the decently priced £3.80 before I finished up and popped next door to the River View where I opted for a pint of Coors (£3.30) whilst watching the start of the Bournemouth-Manchester United game aside a window, shockingly, overlooking the river. After around twenty minutes of the game had been played, I began to work my way back towards the ground, which still stood a good mile-and-a-half or so away. Of course, this trek would be getting broken up along the way and after crossing a bridge over what seemed to be a long gone railway line, I came upon the interestingly named Swinging Arm. Despite the visions of what sort of things within may have inspired such a name, the place was actually very musically driven and a pint of the Spanish Palax Craft Lager came in at just the £3.45. It was bloody good too. Birkenhead is a town on the west bank of the Wirral peninsula, historically in Cheshire. Its name likely derives from the Old English ‘bircen’ meaning ‘birch tree’ and probably means headland overgrown with birch, with regards to the many trees which grew on the headland that jutted out at Woodside and not the Birket stream which enters the Mersey nearby. 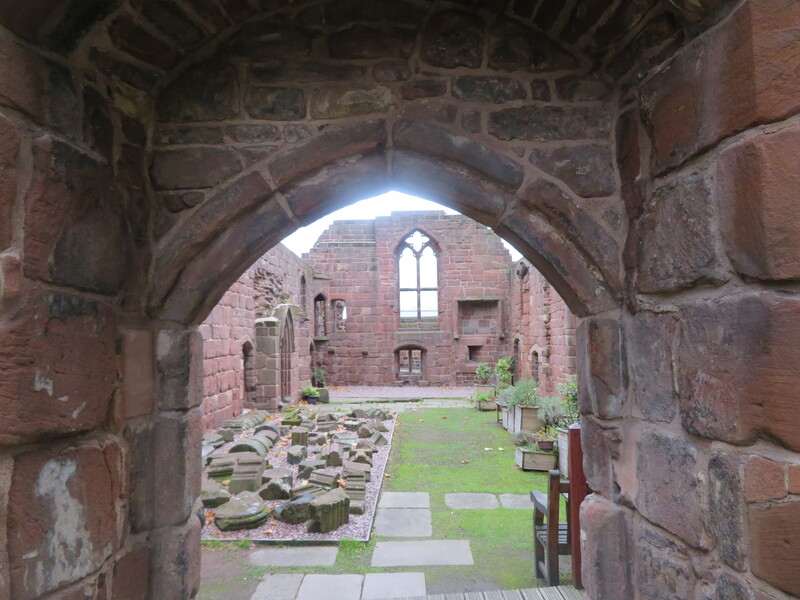 Ferry “services” began operating from Birkenhead in 1150 for the Benedictine monks who’d built the Birkenhead Priory which would later be visited by King Edward I and was later granted further rights in a 1330 charted by Edward III. Distanced from the Industrial Revolution in Liverpool, Birkenhead retained its agricultural status through to the advent of the steam ferry services which introduced something like the service which runs today in 1817, along with services to Ireland and Isle of Man, and five years later the paddle steamer Royal Mail would begin operating between Liverpool and the Woodside terminal Maritime business continued to grow and shipbuilding began on the peninsula from 1829 following on from an initial iron works built by William Laird in 1824. This eventually grew to become Cammell Laird with the likes of HMS Ark Royal, HMS Prince of Wales and HMS Birkenhead itself being constructed on the site, as well as the submarine HMS Thetis which sank in sea trials in Liverpool Bay prior to being raised and commissioned as HMS Thunderbolt. Sadly, this would later be lost in action with the loss of its full crew. The Mersey Railway tunnel opened towards the end of the 19th century, becoming the world’s first tunnel under a tidal estuary, providing direct rail access to the city across the water and this was later joined by the Queensway road tunnel (1934) and this opened the peninsula up to development, due to it providing easier access. Previously, Birkenhead became home to the first street tramway in Britain, which was later electrified in 1901, prior to its closure, though a heritage line still remains with a pair of trams brought over from Hong Kong along with a maintained original. 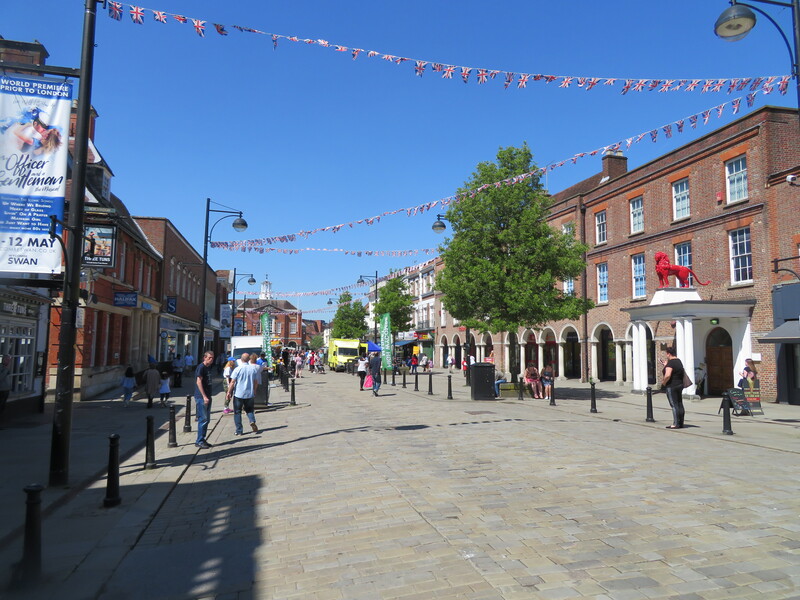 With growing links, the area began to become more industrialised and urbanised, with the town growing from just 110 inhabitants in 1801 to almost 111,000 inside a century, with an influx of workers and settlers from Ireland, Wales and other parts of Cheshire. However, the 20th century would signal a period of decline and a reduction in port activity. 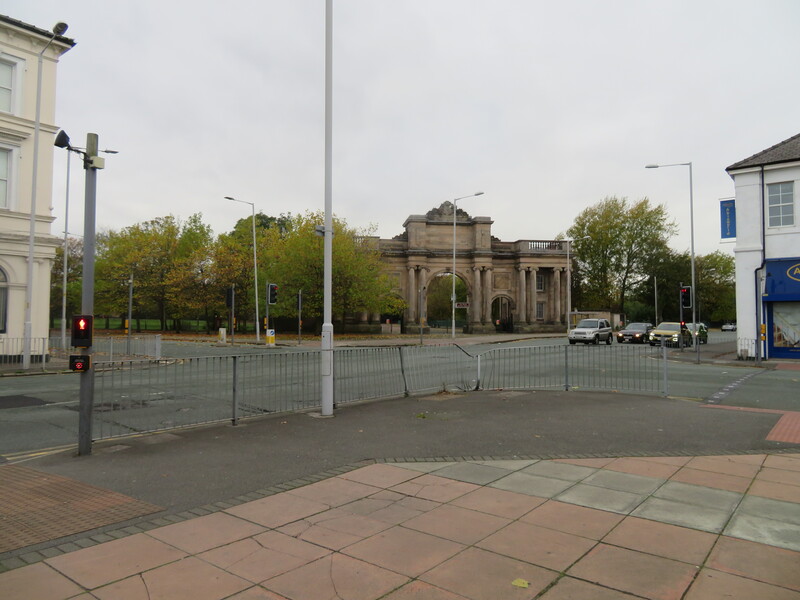 A few side notes saw Birkenhead Park become the first publicly funded park in Britain and it is home to a Greek-style Grand Entrance, modelled on the Temple of Illysus in Athens, an ornate ‘Swiss Bridge’ and a ‘Roman Boathouse’ as well as two lakes. 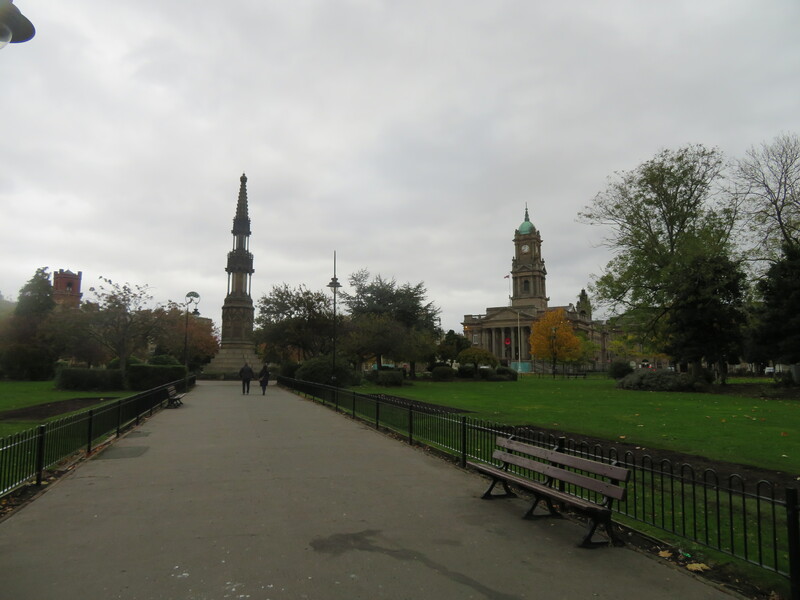 Hamilton Square contains the most Grade I listed buildings in one place outside of Trafalgar Square, including the Birkenhead Town Hall (on the site of the original Birkenhead Market which saw Michael Marks of M&S open up a penny bazaar), whilst scenes for the film Chariots of Fire were shot at Woodside, substituting for 1920’s Dover. Its priory remains standing too…. 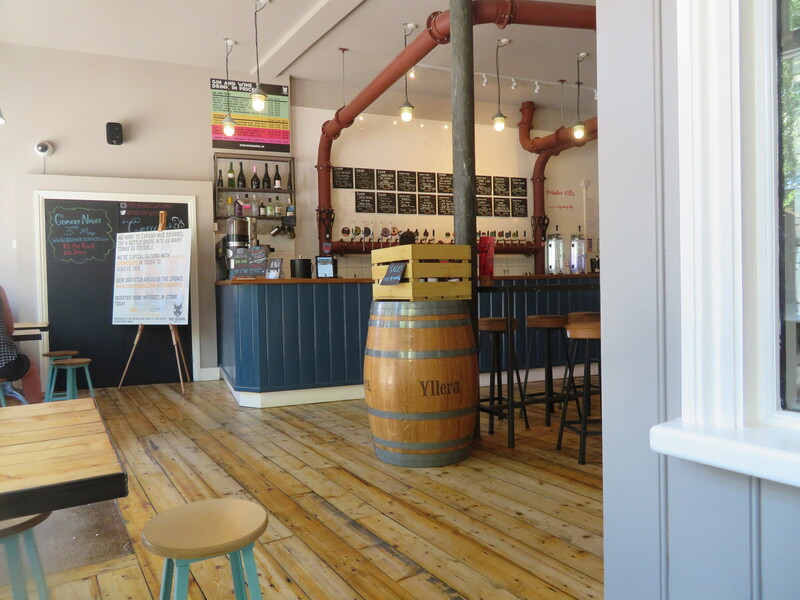 After a brief visit to the peninsula’s oldest building, the Birkenhead Priory, I continued heading for the Glen Affric Brewery in an otherwise unspectacular warehouse estate by the side of a busy intersection. 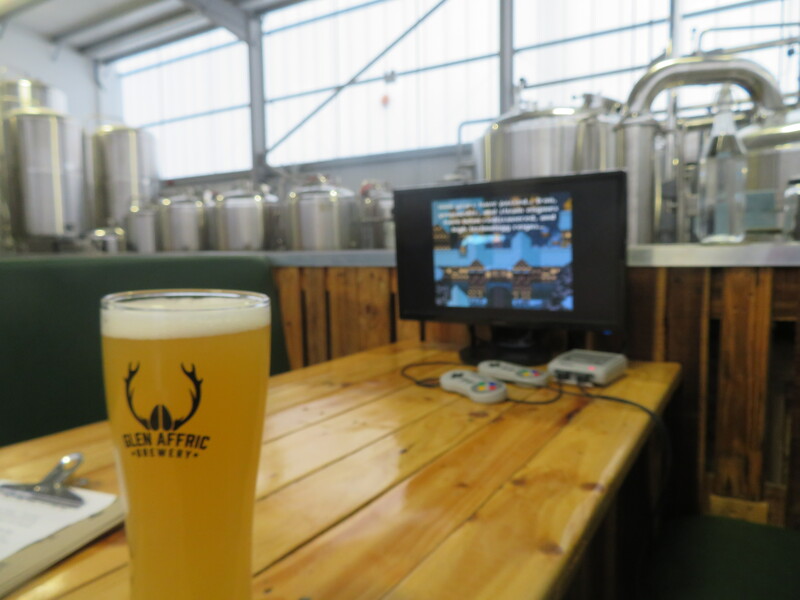 However, inside the warehouse bearing the brewery’s name is a “tap” bar with a decent selection of its own stuff brewed on site, all equipment is located by the side of the tables, with the benched areas being home to vintage Nintendo game consoles too. A bit of a throwback to my youth for sure there! It was quite fun watching it go through its demo runs and seeing the vintage classics loaded upon it, but it was soon time to up sticks once again and set my sights on my final planned pre-match stop, the Sportsman’s Arms, which was eventually reached a good 15 minutes later having walked through a few side-streets and encountering a rather steep hill from outta nowhere. Dark Fruits would be my choice of refresher here whilst I watched the final throes of the match and Marcus Rashford grabbing us the three points. At least I wasn’t alone in exclaiming “YES!! !” or I may have been in some bother…. 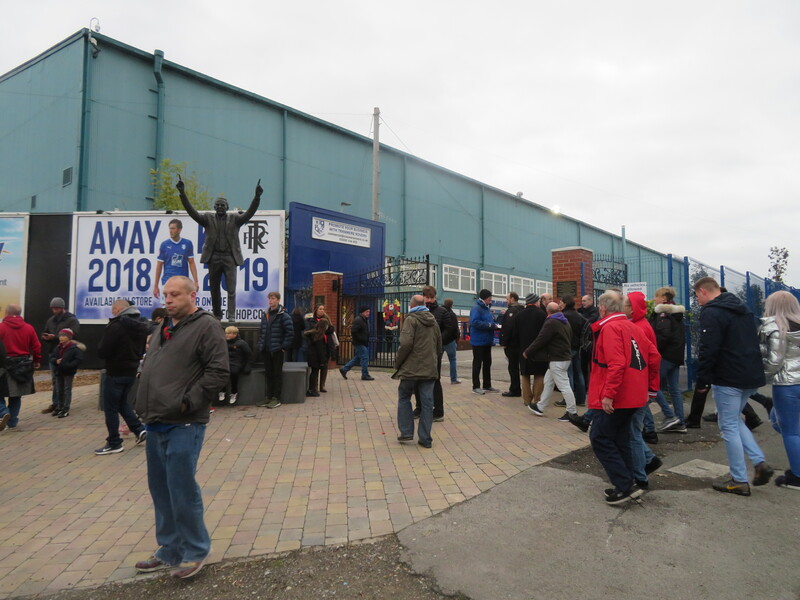 A short walk later had me at Prenton Park where, having a few extra minutes in hand, completed a lap of the ground before opting to head into the first of the cash turnstiles I came across, completely forgetting my best-laid plan to take a place in the Kop. Instead, I ended up right on half-way, so I couldn’t be too aggrieved! After a quick visit to the food bar for some chips (more like potato wedges really) it was off to pitchside ahead of the game, which was only a few minutes away. Having again got to my seat in time for the minute’s silence – this being a dual one, with it also serving to remember the victims of Leicester’s helicopter accident – it was soon time to get into the match. First, Prenton Park is a decent ground with the all-seater, one-tiered Kop stand behind the left-hand goal (from my point of view) largely dominating the ground, with only the Main Stand opposite my seat being anything close, and having something of a hint of age about it, giving the ground some extra character. 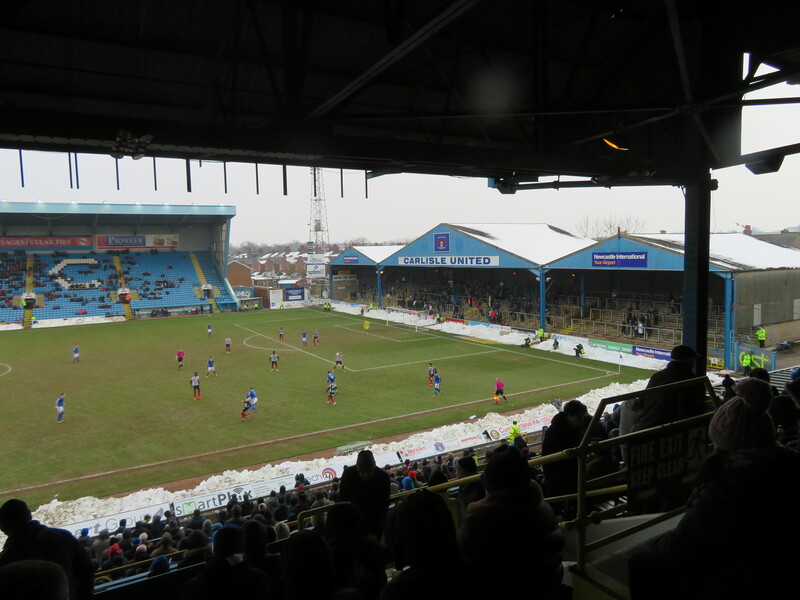 Both the right-hand Cowshed End, housing the away fans today (and that appears to slope away to one side due to its seating arrangements and not due to drink) and the Johnny King Stand – named after the club’s most successful manager – that I was in are both fairly small affairs, though are easily capable, the latter running the length of the pitch. That’s the ground described in short and this is the story of Tranmere Rovers…. Initially formed as Belmont Football Club in 1884, upon the merger of two cricket clubs’ footballing arms – Lyndhurst Wanderers and Belmont, the club played, largely, only friendly matches through to 1888 due to a lack of a league, though did enter the Liverpool and District Challenge Cup in 1886. They would play their initial matches at Steeles Lane in Birkenhead before changing their name to Tranmere Rovers prior to the beginning of their second season in existence (a previous Tranmere Rovers side had existed as an offshoot of the cricket club of the same name in 1881-’82, though this side was unrelated to the current club) and would later purchase Tranmere Rugby Club’s Ravenshaws Field in 1887, renaming it as the first ‘Prenton Park’, 25 years before Tranmere would move into their current home. 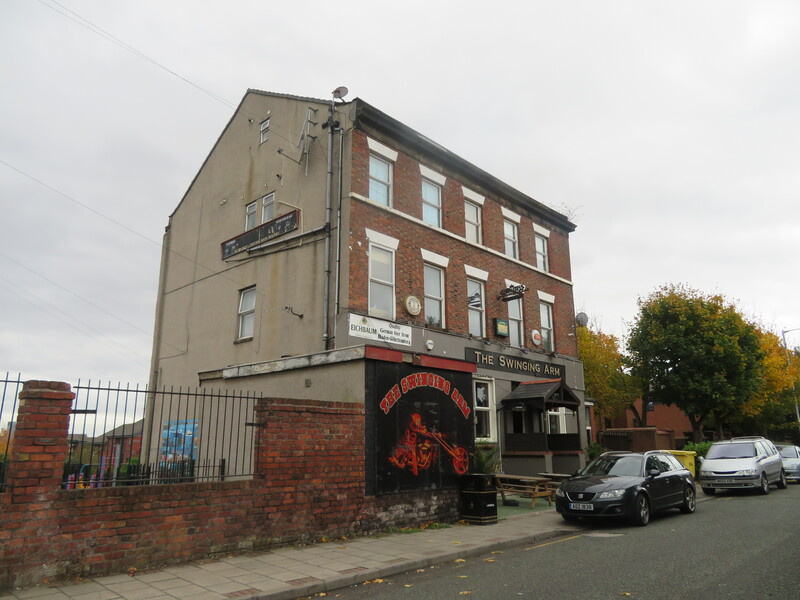 Entering their first league – the West Lancashire League – in 1889, the club would spend eight years here prior to switching to the stronger Combination in 1897, winning the title in 1908. 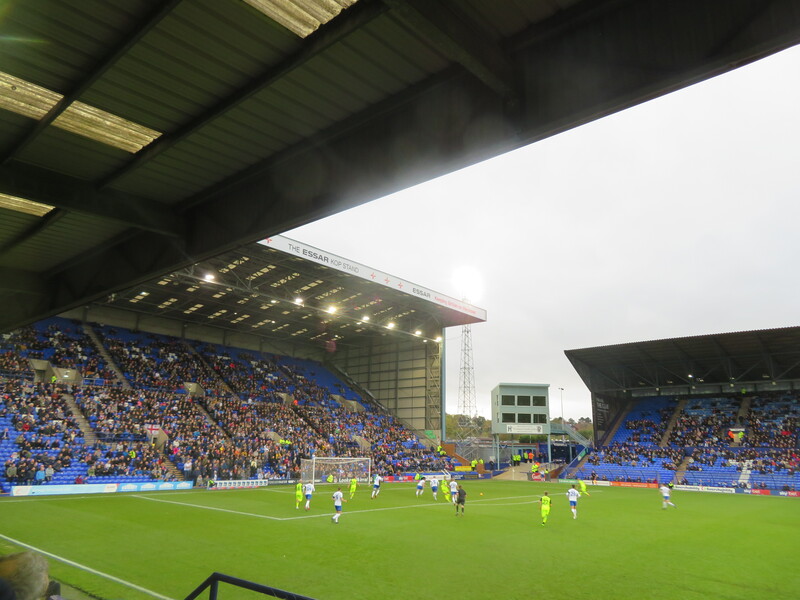 Two years later, Tranmere would join the Lancashire Combination and 1912 saw them make the move to the current Prenton Park home, complete with 800-seater stand. 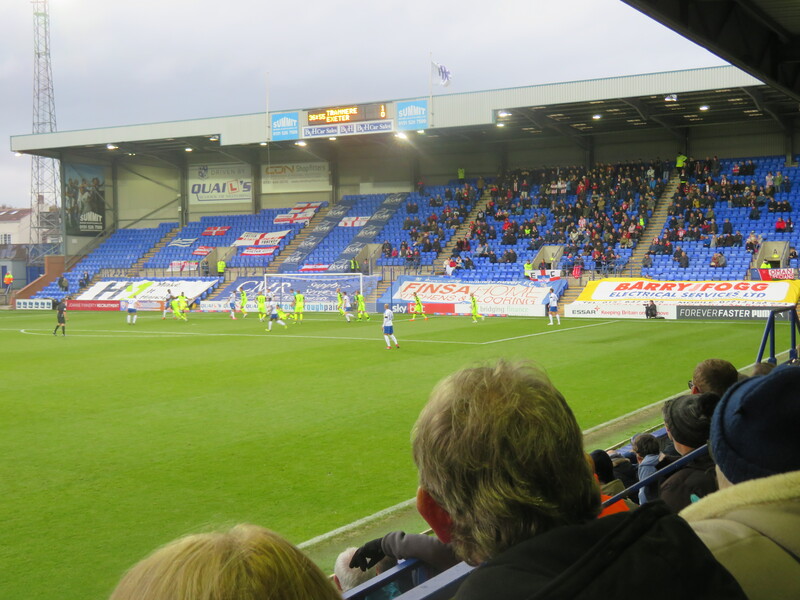 A further two seasons later, the club would lift the Lancashire Combination title and they would remain in the league through to the First World War, whereupon Tranmere did continue to remain active throughout the conflict, though players were criticised for avoiding active service, despite working in the local shipyards. 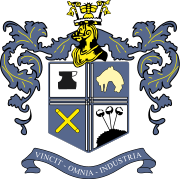 After Leeds City Reserves were ousted from the Central League in 1919, Tranmere were able to take their spot and this timing proved a further blessing as after just the one campaign there, four clubs were invited to join the newly formed Third Division North of the Football League as founder members. They duly accepted and won their first league clash 4-1 at home to Crewe Alexandra. 1924 saw Dixie Dean make his debut for Rovers and he went on to net 27 goals in 30 matches before moving to Everton where he would make his name, with further local players would follow in his footsteps up the leagues. In 1934, an FA Cup tie pitted Rovers against Liverpool at Anfield in a game watched by just a tick over 61,000 fans, Tranmere would latterly achieve a place in goal-scoring history, as they defeated Oldham Athletic 13-4 on Boxing Day of 1935, with the game’s 17 goals remaining the highest aggregate scored in one Football League game. Bunny Bell netted nine in that game. During the same period, Rovers would compete in the Welsh Cup and reached the final twice, losing to Bristol City in the 1934 final after a replay first time around, before defeating Chester one-nil in the next season, the club’s first silverware as a Football League Club. Rovers would win their first League title in 1938, lifting the Division Three North championship and promotion to Division Two for the first time and this remains their first and only League title to date. Success didn’t immediately follow either, with Tranmere relegated at the end of the next season. Post-WWII, Tranmere re-joined the League and again took their spot in Division 3 North. They would remain here until the restructure of 1958 with Tranmere’s 11th placed finish seeing them achieve a high enough spot to remain in the newly nationalised Third Division. 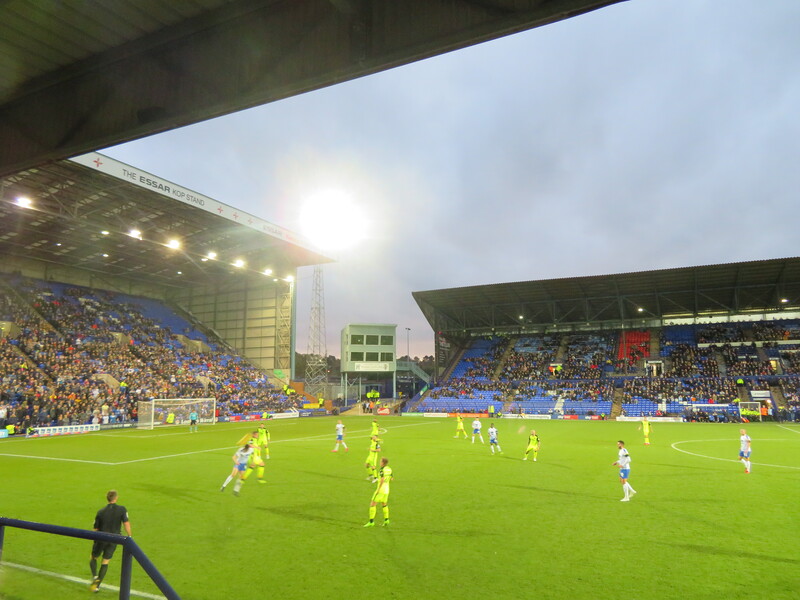 The final match, against Wrexham attracted a crowd of 19,615, which remains a record at Prenton Park for a league match. In 1961, Rovers skipper Harold Bell left the club, having not missed a game from the first game post-war through to 1955 when he was eventually dropped from the side, a total of 459 consecutive games which also remains a record. His influenced was missed, as Tranmere were relegated that same year to Division 4, and the club switched up their kit from blue shirts, white shorts to all white, to distinguish themselves from Everton. 1967 saw them return to Division 3 and the following season saw the club reach the FA Cup Fifth Round for the first time, ahead of a game in that competition three years later achieving a club record attendance at Prenton Park of over 24,000 for a tie vs Stoke City. 1972 saw Ron Yeats join the club and his links to Liverpool saw the likes of Ian St. John join the club as well as Bill Shankly in a consultancy role. This team would go on to record one of the most memorable Tranmere results as they won one-nil at First Division side Arsenal in the League Cup. However, things soon went awry and 1975 saw them return to Division 4 once again, though they would be here for just one season, with promotion immediately won the following year. After another drop back to Division 4, many poor seasons would follow, with Rovers rarely troubling the top-half of the table, though after a resurgence in the latter part of the 1980’s (including a first appearance at Wembley in the League Centenary Tournament), 1989 would see them recover up the division to the runners-up spot and the rise back up to the Third Division once again. They missed out in the following year’s play-offs, having had a strong season, losing in the Final at Wembley to Notts County, just a week after lifting the league’s Trophy at the same venue with a 2-1 win over Bristol Rovers, and they would have play-off success the next season, with wins over Brentford and Bolton Wanderers seeing the club in Division 2 for the first time since the 1930’s, though lost out in their second consecutive League Trophy final. After Division Two became Division One upon the formation of the Premier League in 1992, and with John Aldridge beginning his decade-long spell at the club (going on to net 170 goals for the SWA and becoming Tranmere’s first – and only to date – player to score at a World Cup), Tranmere went on to reach the play-offs for the next three successive seasons, missing out on promotion to the Premier League in each of 1993, 1994 and 1995, and ’94 saw further disappointment as they went out in the League Cup semi-finals to Aston Villa on penalties. 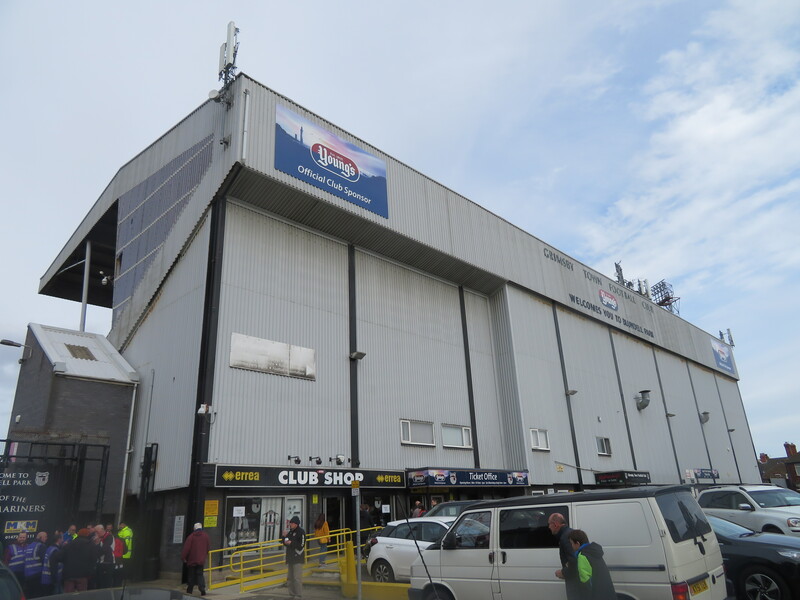 Prenton Park was reconstructed and re-opened in 1995 but financial constraints took a-hold over the millennium season, though they did reach the Sixth Round of the FA Cup and reached the 2000 League Cup Final, losing out to Leicester City by 2-1 in the last game played at the ‘old’ Wembley. The all-white kit was re-introduced ahead of the next season but despite success in the cups (including a 3-0 win over Everton), the club were relegated to Division 2 ending a decade-long spell in Division 1. The play-offs were reached in 2005, but the campaign was unsuccessful and despite going close to reaching them again, they never would. Just avoiding the drop to the now-named ‘League Two’ in 2010, 2013 saw manager Ronnie Moore sacked after admitting breaching betting rules and the season would eventually end with Rovers relegated to League Two for 2014-’15. Further disappointment was to follow immediately, as Tranmere dropped out of the League in 2015 ending their 94-year stay. 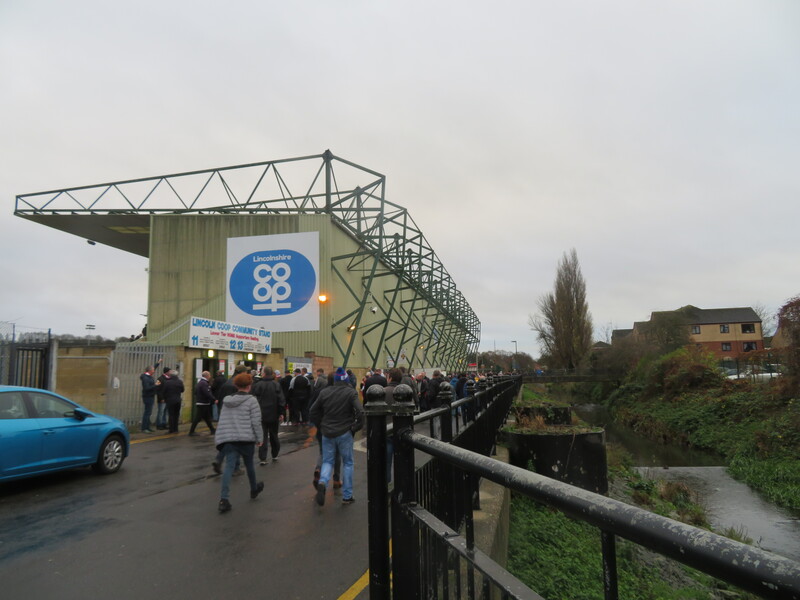 A poor start to their non-league life in the Conference followed, though a resurgence saw the club just miss-out on the play-offs and after double disappointment in 2017 saw Rovers lose out in the FA Trophy semis and miss out on promotion in the play-off final to the extra-green Forest Green in, despite a runners-up spot and 95 points being achieved, last season saw the club eventually return to League football as they recovered from another sluggish start to again reach the play-offs where they overcame Ebbsfleet United in the semis before overcoming Boreham Wood 2-1 in the Final at the ‘new’ Wembley and they have bucked the trend of the last few years in starting a season strongly, sitting towards the right half of the table. We got underway with Exeter forcing a couple of fairly comfortable stops out of the home ‘keeper Scott Davies, before Connor Jennings responded for the hosts, with his low shot being kept out by Davies’ opposite number James Hamon. 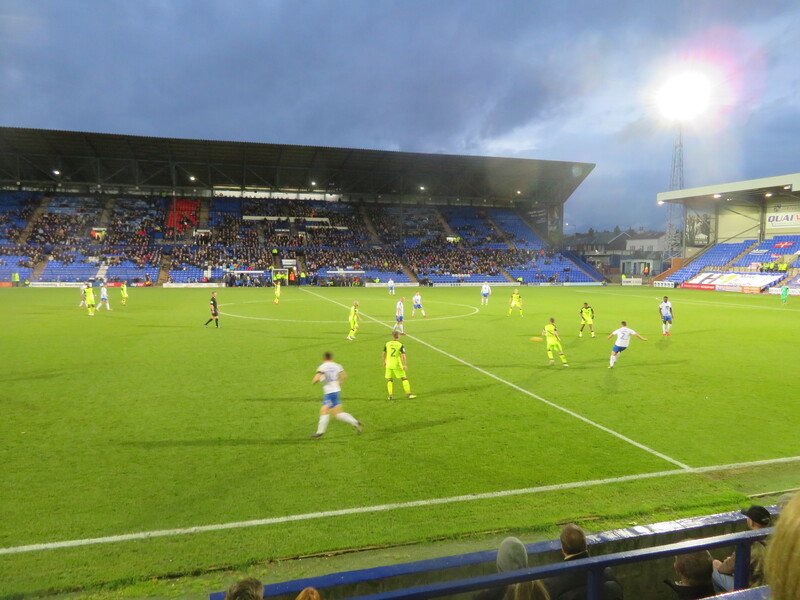 The first-half hour came and went with the game still all-square in deadlock but on 31 minutes it was finally broken from a Paul Mullin cross – Mullin himself had gone close minutes before, his delivery being guided into the net by James Norwood, despite the Hamon seeming to get a good piece of the ball on its way into the net. Be that as it may, it was another game closer to a calendar year without a nil-nil. Just the three weeks to go! Outside of a few blocked shots, Norwood going close to adding a second to both his and his team’s tally, very little happened in terms of real action in the remaining fifteen minutes or so of the first half as Tranmere headed in with their slender advantage still intact at the break. Half-time saw little in the way of action, so let’s get straight on with the action! Again, it was City who would fashion the first chance of the half, Matt Jay this time forcing Davies into action to maintain his clean sheet for the time being at least. After Jennings and Jay had traded chances for their respective sides, Tranmere would grab that vital second goal and it was Norwood who would grab it, showing some real striker’s instinct in the process. After the impressive Larnell Cole had seen his rasping drive from a good 25 yards beat Hamon only to unluckily smash into the post, Norwood responded well to be in the right place at the right time to slot the rebound home and send the fans in the Kop behind the goal into brief delirium. That looked to be that in truth, as Exeter were pretty disappointing overall and their display was summed up by Dean Moxey receiving a second yellow card within 15 minutes to receive his marching orders for (I think I remember) handball. From there it was a pretty routine quest for Rovers to see out the final twenty minutes or so, though they also looked to take advantage of their extra man and add one or two more strikes to their scoring sheet. However, Hamon was in no mood to let any more past and kept out efforts from each of Johnny Smith, Jennings and the hat-trick chasing Norwood. Lee Martin would go close for the visitors as the game ran down, keeping Davies alert to the end, but that would be that and it was a big three points for Tranmere in this top(ish) of the table clash. Not a bad return so far for the SWA. As for me, that’s two games and no goals this season for Exeter, so maybe I have something to do with it? Post-match, I took in a swift visit to the ground neighbouring, and appropriately named, Prenton Park for a quick Dark Fruits (£3.10), before heading off and up to Rock Ferry station where I’d pay a visit to the two station neighbouring hostelries, namely the, again fittingly named, Rock Station (Coors £2.7/95) prior to popping over the road to the Bedford where a Rekorderlig Mixed Berry came in at a decent £3.20 ahead of the train back into the lower reaches of Lime Street. Arriving with a good 40 minutes to spare ahead of my train back, I thought I’d grab that Baltika I’d missed out on earlier in the station’s Spoons, whereupon I would be rewarded for my day’s good deed, giving up a table for a group of guys and girls who’d come into the packed place, meaning a free one was on them, despite my protestations to the contrary. Ah well, if you can’t beat them!! Rock Station. Camera didn’t play ball on the others! So that ended another trip and it was good to truly get Prenton Park done. The game was decent, Birkenhead is too for a few and all else went smoothly, so can’t have too many complaints, especially with a nice early return home being secured (i.e. before 8pm), a distinct rarity these days. Anyway, it’s back onto the FA Cup trail next (this just gone as it is) weekend and a visit to a club who are just experiencing their first season in non-league, having replaced this very club for this season. Twisted…. The second of my trips to Devon in consecutive weekends saw me heading the slightly shorter distance this time around out of the county’s two League sides. Yes, I was off to Exeter this time around, having been further down the line at Plymouth the previous week, for their 5-1 drubbing at the hands of the Posh. Plymouth was a decent day, question was :- could Exeter go one better? Grabbing the 8am train down from Manchester, I arrived into St. David’s station at a little before a quarter to midday, after having to endure a tortuous 10 minutes of sitting stationary outside on the station approach. This duly meant my first drink of the day would need to be a swift one, and so the walk to my first stop would need to be too. After eventually gaining my bearings (I’m getting a little better by now! ), I set off towards the side of the River Exe and the appropriately named “Mill on the Exe” which, you may be surprised to learn, used to be a mill. I know, I share your disbelief!! 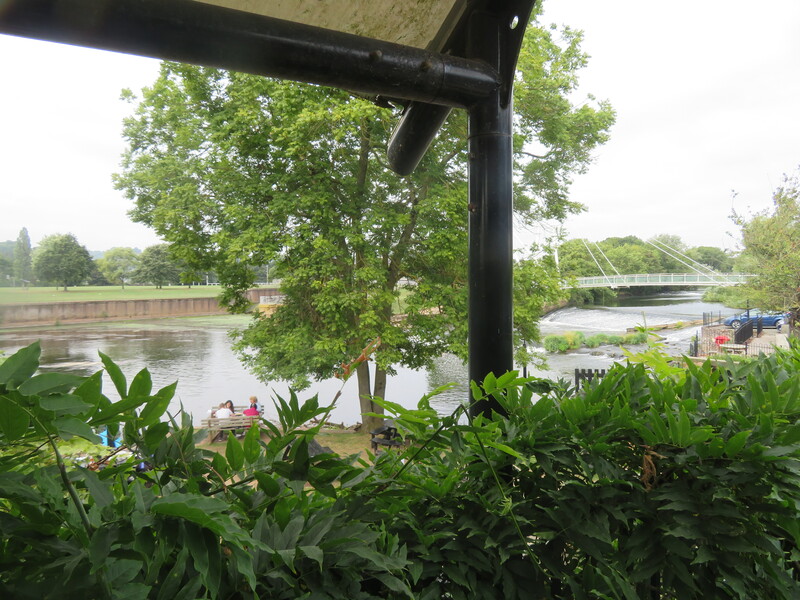 Anyway, a swift pint of Rattler cider (the locally brewed stuff) was enjoyed out on the balcony overlooking the river bridge crossing, prior to me continuing onwards into ‘town’. After heading past what first appeared to be an old, grand garden (though a later deduced it was actually a seemingly abandoned cemetery), I approached a large iron bridge which, again, was fittingly named “Iron Bridge”. Hence, there had to be a pub named just as well, and, shock of shocks, there stood the Iron Bridge Inn, right there upon the bridge. Just kidding, I knew this was there! What I didn’t fully expect was the pint I ordered to cost a full £6.50, though I was of course informed prior to the matter. Not being one to shy away when it comes to a good beer, the Tropical Pale Ale was, as promised, bloody fantastic. The pub was a lovely old classic too, so well worth a visit. Next on the list was something of a diversion, if I’m to be honest. Having planned to seek out the Beer Cellar first, I couldn’t spot it for one reason or another and so instead popped into the far easier to see City Gates, which I just so happened to be stood right outside of. This was another elder statesperson of the city, dating from the 19th century and age seemed to equal cost here, as a bottle of Sol came in at a full £4.40. Jesus. Anyhow, I took it out into the nice ‘Walled Garden’ outdoor area, which also allowed a quick exit out of the old coaching entrance. The price didn’t make me feel sunny…. 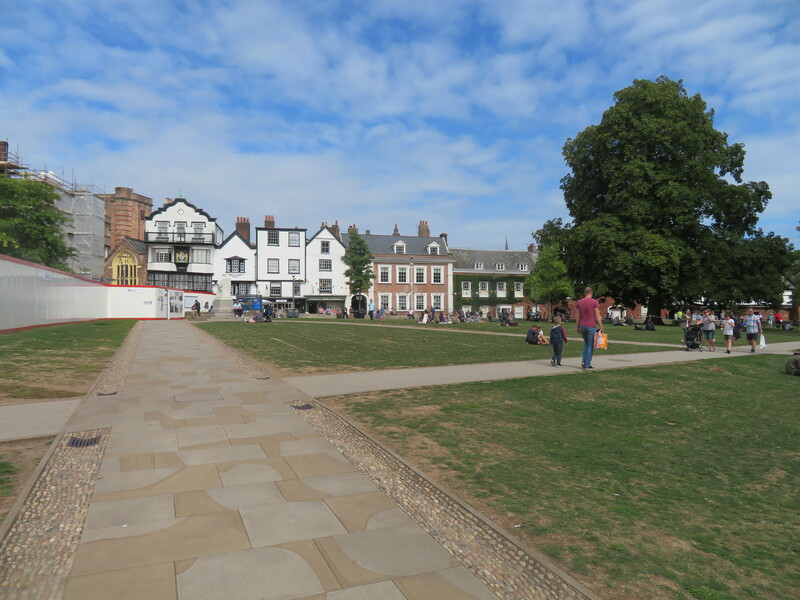 The name Exeter derives from the Old English Escanceaster, from the anglicised from of the river now known as the Exe and the suffix -ceaster, used to mark important fortresses and towns. Exe is a separate Brittonic name meaning “water” or, more specifically, “full of fish”. The area began as a riverside settlement, likely dating from around the times of the Roman occupation, with coins from the Mediterranean – especially the Hellenic region, having been found dating back to 250 BC. It would later grow into a fort, with it becoming the southwest terminus of the Fosse Way and served as base for the legion presided over by Vespasian, who would later become Emperor. The fort grew into a larger settlement containing the families of those based here, alongside natives, becoming the tribal capital of the Dumnonii area. Upon the forts abandonment in 75 AD (CE can piss off), the grounds were converted for civilian use and is located close to the cathedral. 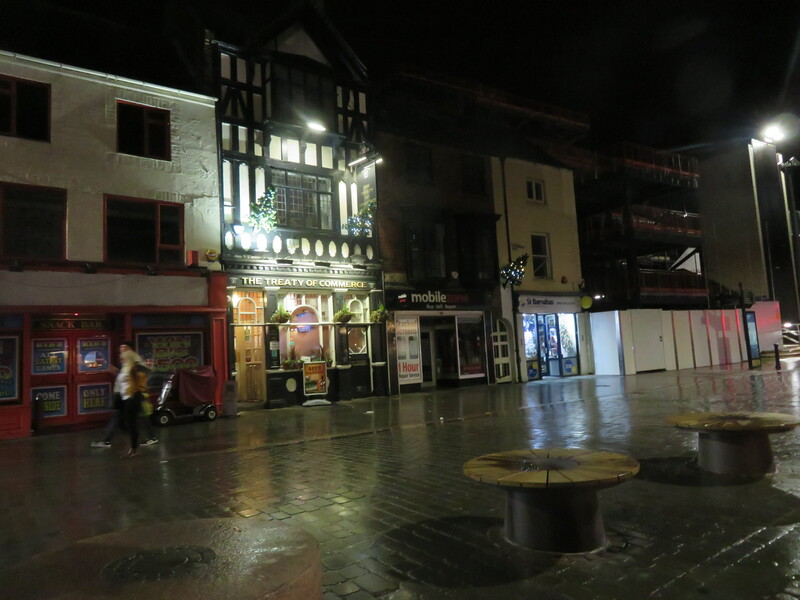 Exeter would latterly be conquered by the Saxons, though they did leave a quarter of the city to remain under native control, the road named Bartholomew Street (nee Britayne Street until 1637) was formerly named, apparently, in memory of these people. In 876, it was attacked and captured by Viking raiders, though they were driven out rather quickly by Alfred the Great. 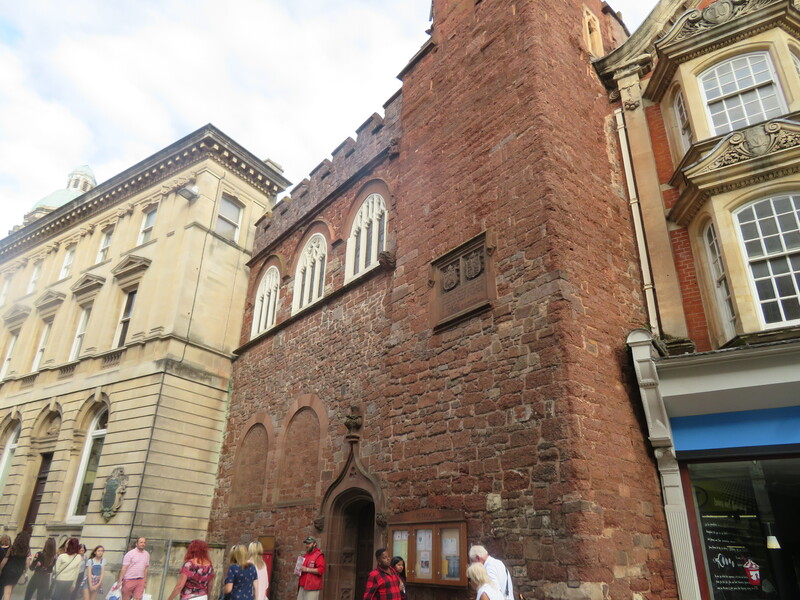 King Athelstan, who went on to further fortify the city, drove out the British to (perhaps) the St. David’s area just outside the city’s walls. After a further failed Danish attack, the Norman conquest took hold and, despite the city’s peoples rebelling a couple of years in, a siege put in place by King William put paid to that. In later years, the town would become a more market-based area, for the benefits of the locals. 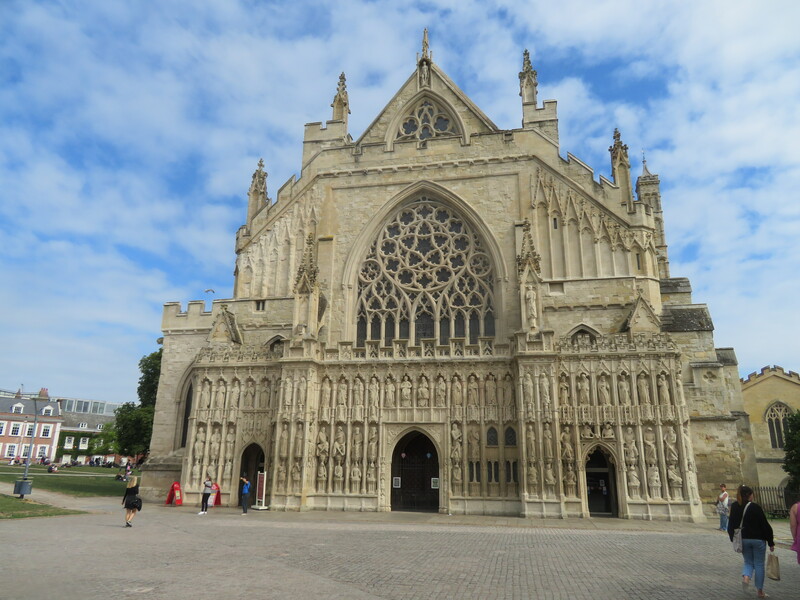 As time went on, into the Tudor period, the city withstood a siege from the local Cornish and Devonians, outraged by the religious instructions of the monarchy at the time. This was ended in battle, with many rebels meeting their end soon afterwards. The city would go on to play a major part in the defeat of the Spanish Armada in 1588, whereupon it is said it gained its motto “Semper Fidelis” from Elizabeth I in recognition of its service, though schools teach that it was in fact bestowed by Charles II in 1660 after the Restoration due to its part in the English Civil War. 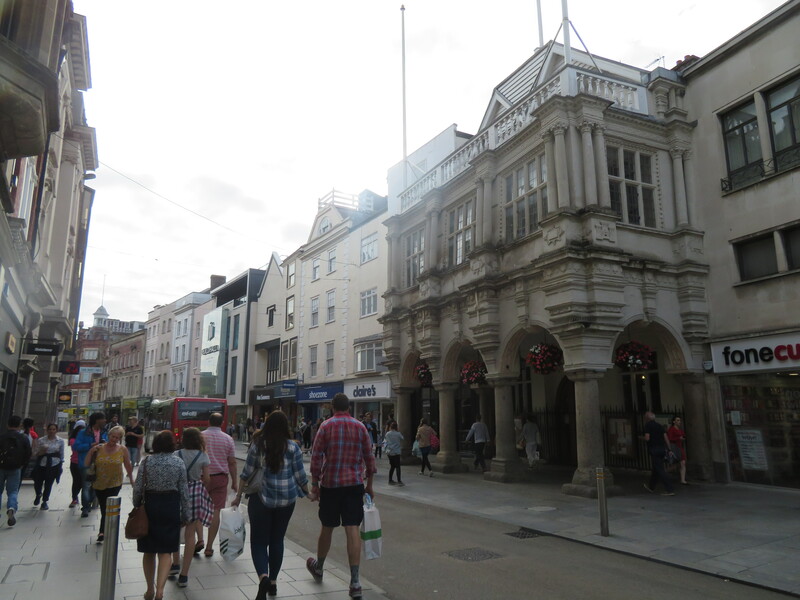 Around this time, Exeter became a stronghold of the wool and cloth trades, trading with many areas of the world, with the industrial revolution of the 19th century bringing agricultural goods to the fore. Bridges, tramways and railways were also introduced to help expand transport links both locally and to the rest of the country. The city was bombed extensively by the Luftwaffe during WWII, Exeter defended by a squadron of Polish night-fighters, named the Lwów Eagle Owls, based out of Exeter Airport. Incidentally, the Polish city Lwów shared the same city motto with Exeter. The city was the first to be gifted a Polish flag in friendship and one is duly raised on each 15 November. In recent years, a serious fire damaged the Royal Clarence Hotel (said to be the first venue to call itself a hotel in England), though restorations ended up uncovering medieval pictures. The hotel’s restoration is still ongoing. Inside too. Full of all sorts. 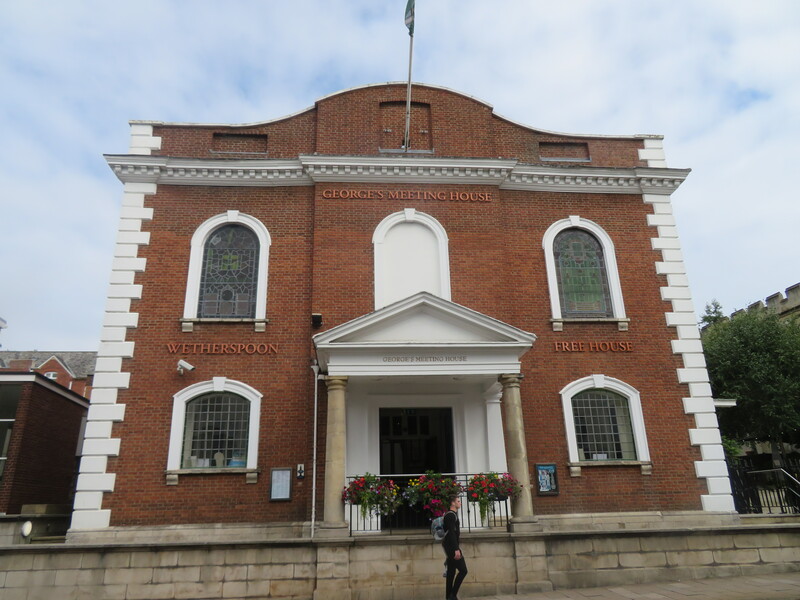 George’s Meeting House. I had no-one to meet. 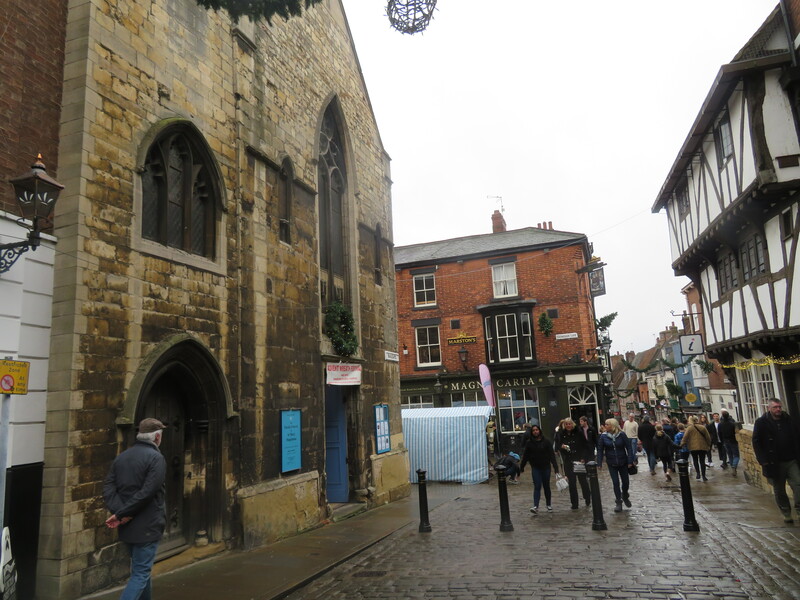 Continuing on, I headed onwards towards the cathedral part of town and to a pair of drinking holes just across the way from each other. 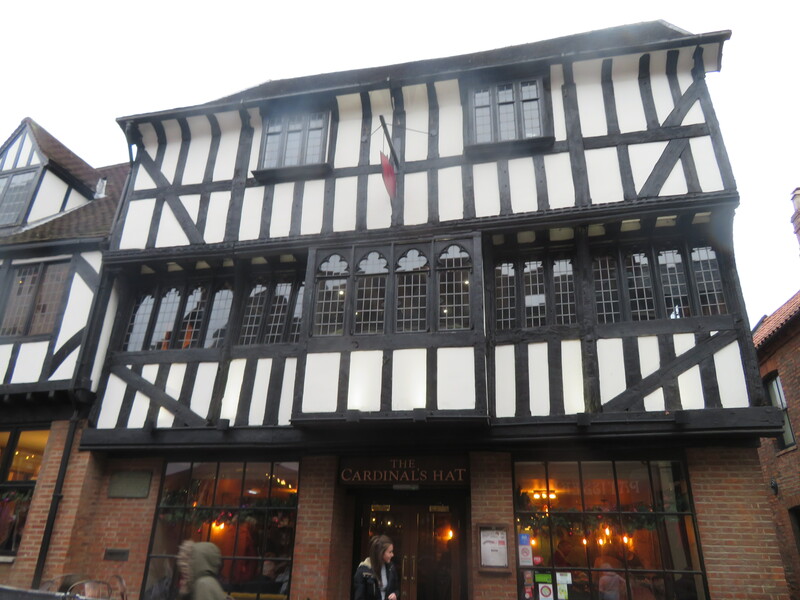 The first, the White Hart, was another oldie worldy place, dating from the 1500’s. 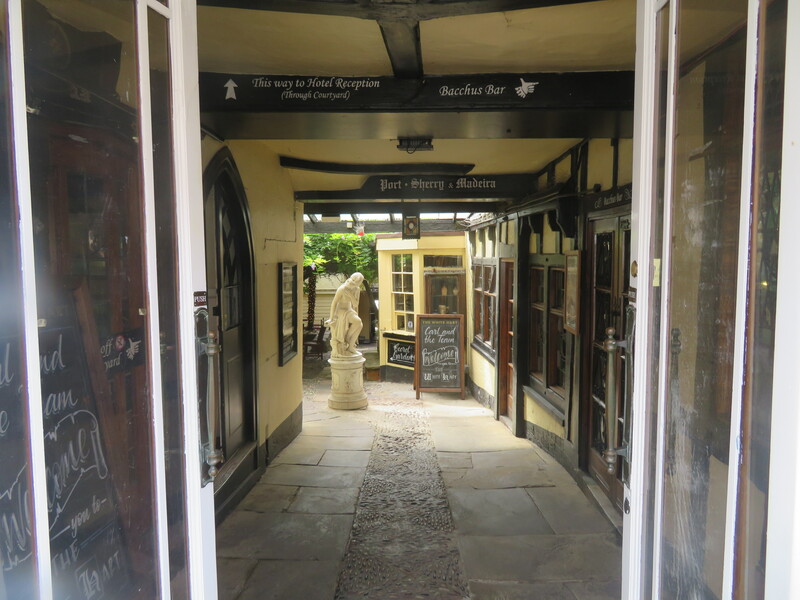 However, this wasn’t so apparent when outside, though once you head on through the entry way, it quickly became timber-framed and narrow. Indoors, the bar off to the right was the one in use, and it was, fittingly, dimly lit and full of all sorts of various paraphernalia lining the walls. This time, the older place was a little more easy on the pocket, the pint of Thatcher’s coming in at £3.95. Crossing over the way, it was to another fittingly named pub (personally anyway), George’s Meeting House, which was also the first Spoons visit of the day. This is an old chapel or something of sorts and is one of the more interesting ones I’ve visited in a while. It was cool for a quick one, the now staple Hooch at £2.39 to round off the pre-match drinking session. Cutting through the cathedral grounds, I continued on through down a little side road before again having to figure out where I was to be going. Eventually, I spotted a couple of guys who looked like match goers (you get to know them eventually) and followed them up to a large roundabout, from where I could actually recognise roads and the like. However, this didn’t help me in a pursuit of a programme, as I instead ended up with a fanzine but, for a quid, I wasn’t fussed at that and was actually looking forward to having a look through one of these for the first time since….maybe Huddersfield a couple of years back. It turned out to be a decent little read too. Eventually, I did locate the programmes via the help of “helpers” outside the ground and was soon in the queue for the Big Bank. Handing over £16 for entry (not too bad, really), I was into the already crowded terrace, though I did pop into the line for food first up, the Steak pie (I think it was) went down very well indeed. Anyway, St. James’ Park is a pretty smart-looking ground, though it does sadly now lack the traditional old stand I enjoy, though I dare say the Grecians fans may indeed like the new facilities better. The new grandstand is now pretty much complete bar the shouting, and is all-seater. The big bank is a large, covered terraced area, which stretches back a fair way above the playing area, affording decent views out to the city at the far, open, unused end. The current “Main” Stand is also all seater, though is a smaller affair than the grandstand in terms of overall size, it is longer, running the majority of the pitch. 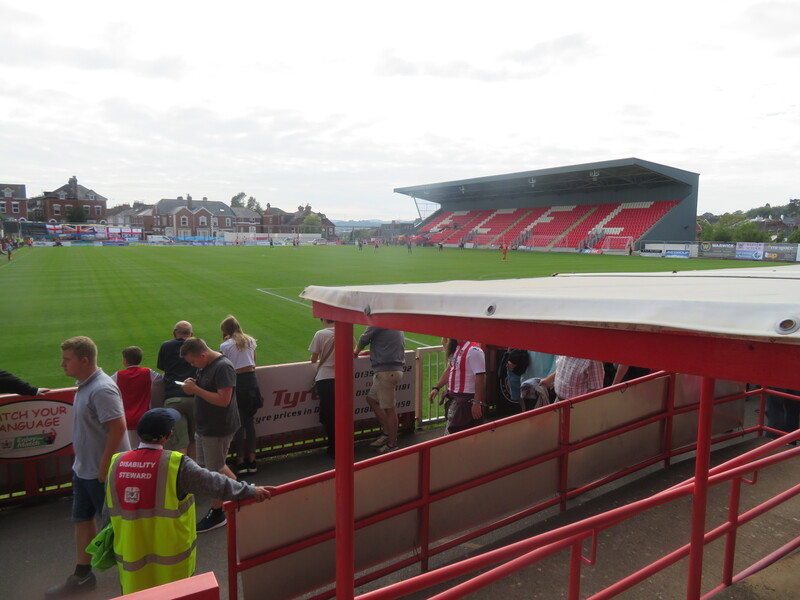 So that’s the ground and this is the story of Exeter City…. 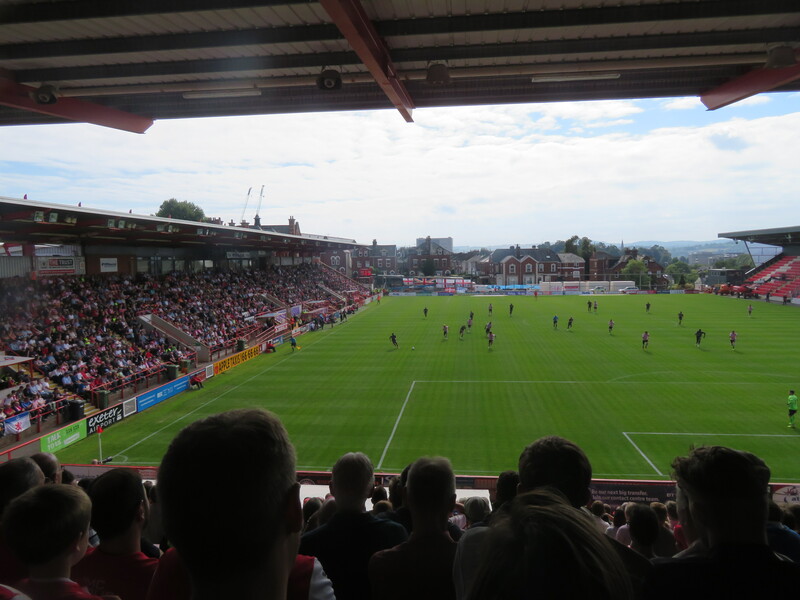 Exeter City Football Club was founded in 1904, upon the merger of local clubs St. Sidwell’s United and Exeter United, the sides having backdated football in Exeter back to 1890. In 1904, Exeter lost 3-1 to St. Sidwell’s whereupon, after the game had finished, the two sides agreed that the two merging was best for the future. 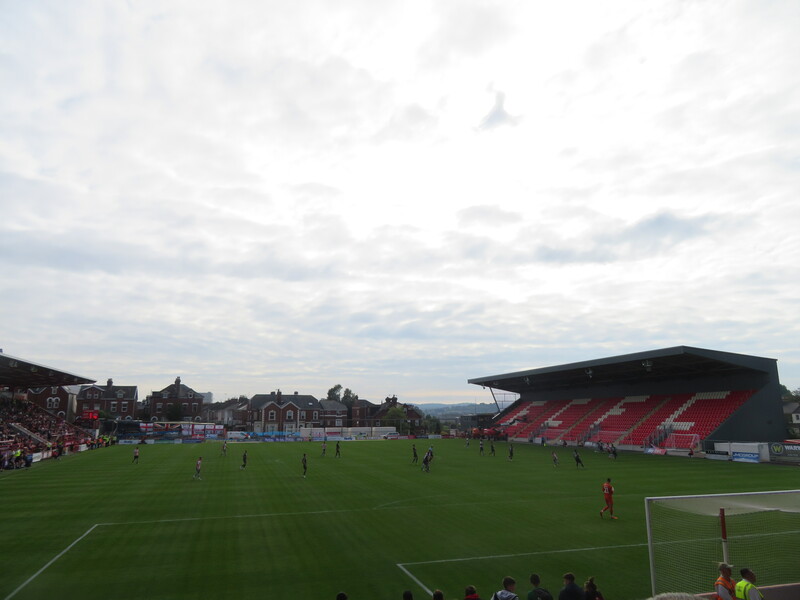 The new team took on the Exeter City name and continued on playing at Exeter United’s ground, St. James’ Park. The new club’s first competitive outing came in September, where they defeated the 110th battery of the Royal Artillery by 2-1 at St. James’ Park, in the East Devon League. City would duly go on to lift the title at the end of the season and transferred into the Plymouth & District League for the next few years. 1908 saw the club turn professional and successfully applied to join the Southern League, replacing Tottenham Hotspur in doing so. They got rid of their supposed “unlucky” green and yellow kit (derived from St. Sidwell’s colours) and switched to their now familiar red and white stripes. Upon the change, a 0-0 draw with West Ham United was followed by five consecutive victories, thus confirming the switch was indeed for the better, in those of a superstitious view. City would go on to tour South America in 1914, just prior to the outbreak of WWI, where they played eight matches against Argentine and Brazilian opposition, whilst also apparently providing the first ever opposition for the future Selecao, the Brazilian national team. This game ended in a 2-0 loss, or a 3-3 draw, depending on whom you believe! Post-war, 1920 saw Exeter invited to join the Football League’s Third Division South, and invite they duly took up. 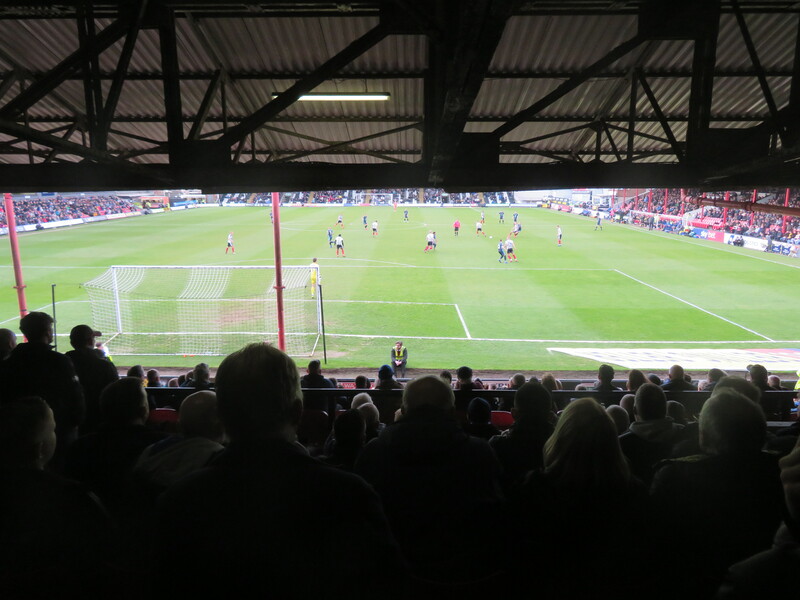 They took on Brentford in their first league match, a game which ended in a 3-0 home success. 1931 saw the Grecians record their joint best FA Cup run, as they reached the sixth round prior to bowing out to Sunderland. They would repeat the trick again 50 years later, this time eventually going down at the hands of eventual winners, Spurs, by 2-0. 1964 saw City secure their first ever Football League promotion, as they finally exited the bottom tier and duly took a spot in the, by this point, nationalised Third Division. However, their stay would only be a short one, as they would be relegated just two seasons later. They would remain in the Fourth Division for a further long spell, though this would eventually end in a first ever Championship title in League football, with this being lifted in 1990, ahead with a return to the Third Division. 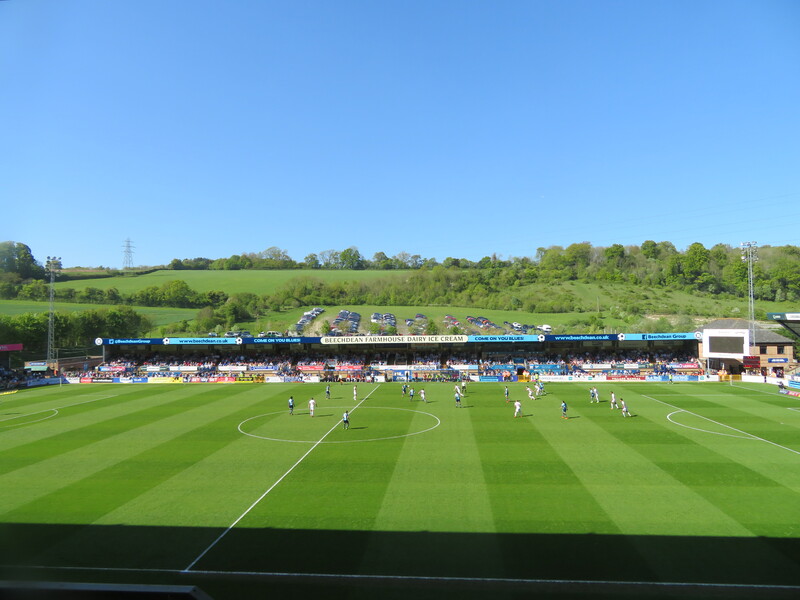 This time, the Grecians doubled their previous tenure here, but were relegated in 1994, from the current Second Division (re-designated upon the birth of the Premier League). 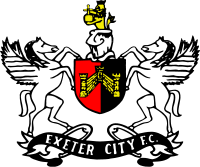 Back in the bottom division, Exeter would go on to struggle for the most part, entering administration and almost folding in the latter part of 1994 and having to sell off their ground to property developers, though were eventually able to remain at St. James’ upon the council purchasing it latterly. They would eventually exit administration in 1996, though things didn’t improve too much and, seven years later, City would be relegated out of the Football League to the Conference National, the club becoming the first to suffer this fate having not finished bottom (they ended 23rd). Continuing financial issues and off-field shenanigans continued to threaten the club’s existence for the next few seasons, but hard work from supporters and a helpful replayed FA Cup tie against Manchester United (after a 0-0 draw had been secured at Old Trafford) in 2005 helped boost the coffers. 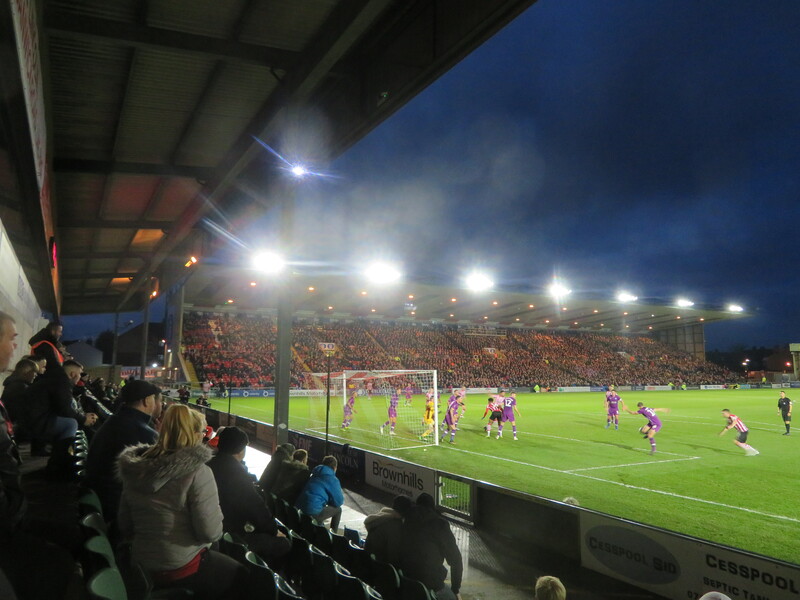 2007 saw Exeter reach the play-offs, whereupon they reached the final with a semi-final win over Oxford United. However, they would go on to lose out at Wembley to Morecambe. They went one better the next season, though, as they defeated local rivals Torquay United after an away second-leg comeback, before defeating Cambridge United by a single strike in the Final, thus securing a return to the League. Their first season in League 2 was an immediate success, as Exeter went straight on through to League One, a final day one-nil win at Rotherham United securing their promotion as runners-up to Brentford. 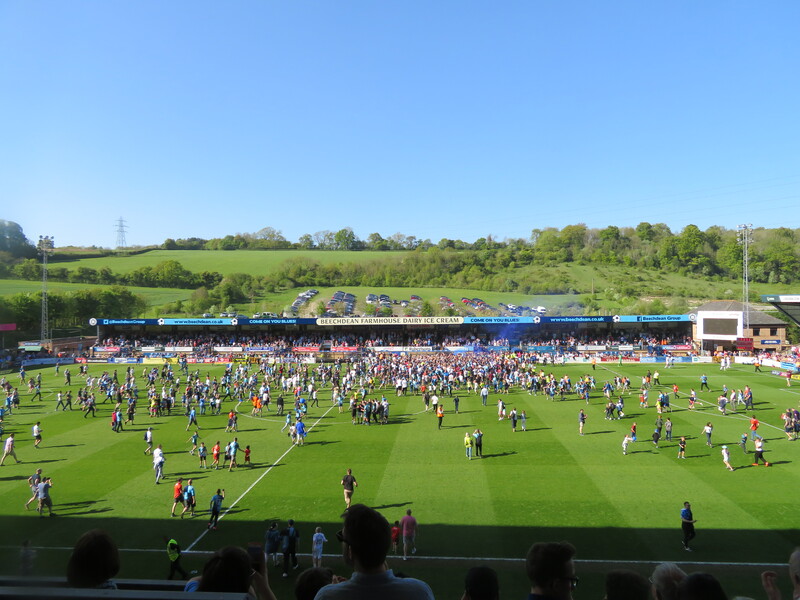 They would remain in League one for the next four years, though scraped survival in 2010 by overcoming promotion chasing Huddersfield Town on the last day by 2-1 and so condemned Gillingham to the drop instead. The following campaign saw the club bounce back from the tragic loss of Adam Stansfield to just miss out on the play-offs (by a single point) and finish up a strong eighth. However, this season was a false dawn of sorts for the Grecians, as they were relegated at the end of the following campaign, back to League 2. Here they have remained, despite a strong showing initially in 2013 before a tail off in performances. Meanwhile, 2015 saw the club become the victims of an FA Cup giant-killing, as they went out at the First Round stage on live TV at the hands of Northern Premier League side, Warrington Town. Their next cup campaign would be memorable for the right reasons though, the highlight being a 2-2 draw with Liverpool. I think he saw me. 2017 saw the club recover from a poor start to just miss out on promotion through the play-offs, a fifth placed finish being the precursor to a dramatic last-minute success in the semi-finals over two-legs against Carlisle, before they were defeated by Blackpool in the final at Wembley. Last season saw the Grecians end up in 4th, whereupon they again entered the play-offs, but were unsuccessful in the final again, despite seeing off today’s visitors in the semis, Exeter again fell at the final hurdle, this time to Coventry City. Paul Tisdale departed the club afterwards, with former skipper Matt Taylor taking the reigns for the coming season, which has seen another strong start. The game got underway soon after I took up a spot within the Grecian support up in the Bank, with very little happening in the first half hour or so, though Exeter were probably just about having the better of the play. After a few blocked shots had come and gone for both sides, it was the hosts’ Pierce Sweeney who eventually got in an attempt on goal, his shot flying over the bar and out of the ground, following a corner. Lincoln responded well and forced a few consecutive corners which ended in Tom Pett firing narrowly wide, before it all went wrong for the hosts in the final few minutes of the half. First, Lincoln skipper Lee Frecklington finished off from a couple of yards following good work by the ever dangerous John Akinde, who was played in on the left side of the area and slid across the face for Frecklington to add the finishing touch. Akinde would then grab a goal himself on the stroke of the break, netting in the second minute of stoppage time. He completed a solo effort by traipsing his way across the edge of the box, beating two defenders as he went, prior to sliding his effort beyond Exeter stopper Christy Pym, who was left rooted and wrong-footed. Half-time duly arrived with the game having taken on a very different look than it appeared to have been meandering towards. After a half time lit up by many attempted chips into a large bin, which also saw the mascot end up in there for a short while too for some reason, we were back playing once more. Again, there wasn’t a whole lot of action early on but, on 56 minutes, the Imps secures the points when Harry Toffolo (who is definitely the most famous person with that surname, ok?) drove into the box and delivered a low cross which was diverted into his own net by Troy Brown, denying the waiting Akinde behind a second goal in the process. Jayden Stockley and Sweeney again saw shots drift off target as Exeter strove in vain to get back into the game in some respect, but it would be Lincoln who would go the closest to finding the net again when Akinde struck the upright with around ten to fifteen to play. But that would be that and the Imps held out comfortably to gain a measure of revenge for their play-off defeat at the hands of Exeter a few months back. Full-time, 0-3. 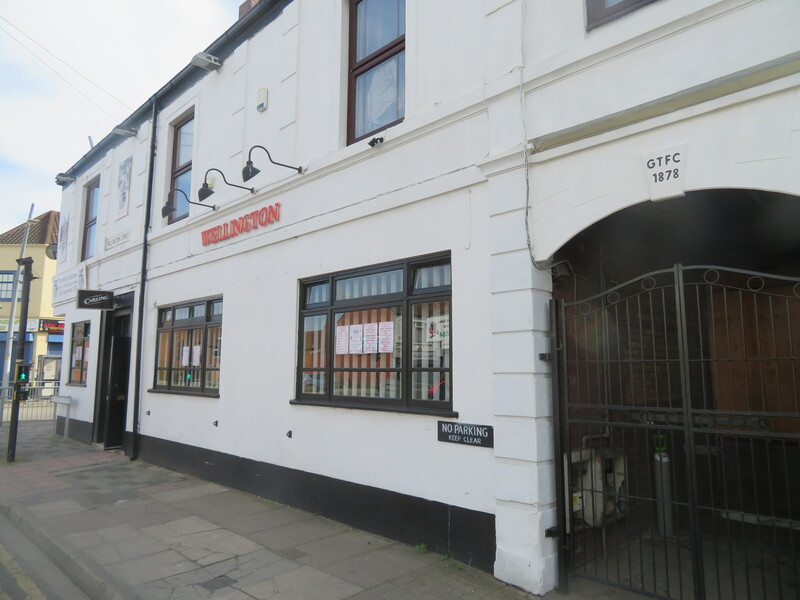 After the game, a hasty retreat back to the city was beat with a visit paid to the old Ship Inn, hidden away down a small, unassuming side street lined with scaffolding. 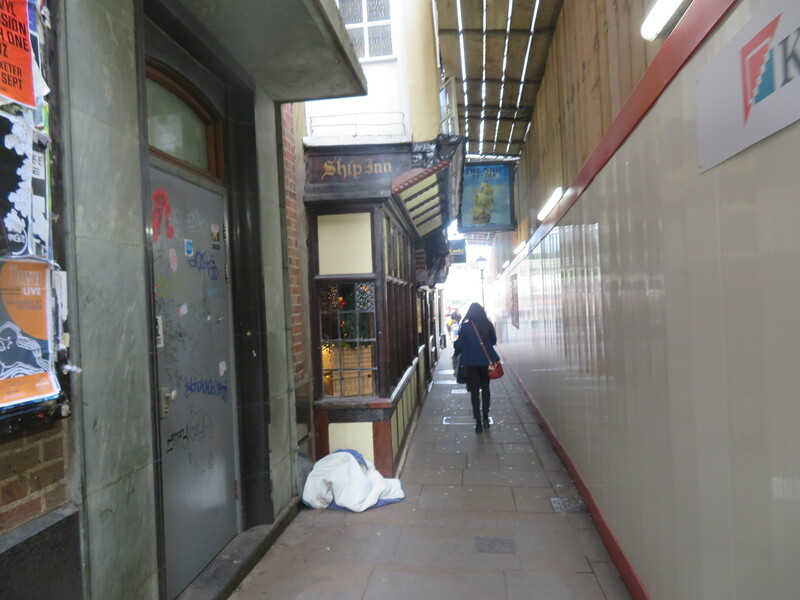 A lucky spot, really, but it would prove to be a second week in succession where I’d drank in an apparent favourite of Sir Drake. 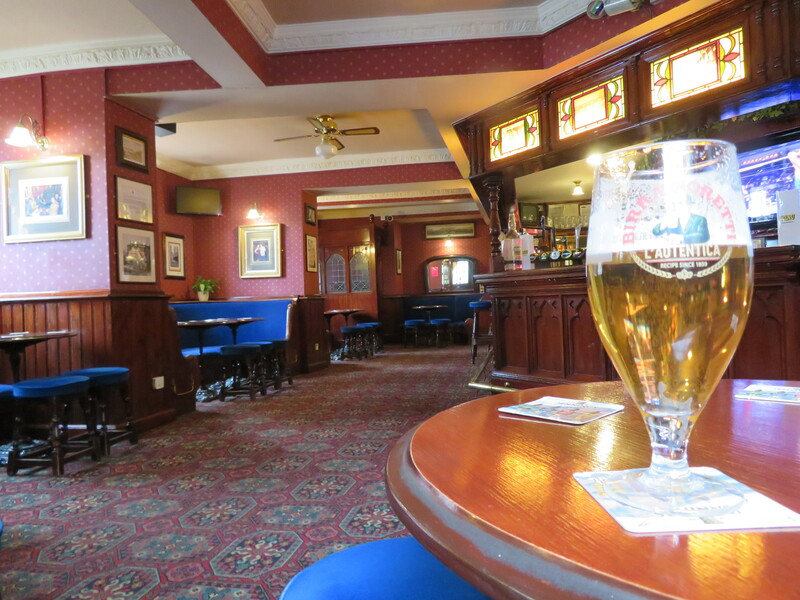 A pint of Amstel in this lovely, old pub cost a very decent £3.85 before I resisted the urge to seek out the Beer Cellar once more and took the far more sensible option of heading to the Imperial ‘Spoons near to the station to await my carriage home. In something of a stately home, Exeter certainly has some of the more intriguing offerings! A Kopparberg (again £2.39) was had here to give something of a refresh before I hopped on back over to St. David’s and onto the train for the journey back north. The Ship. Just about visible! After spending all but around twenty minutes without having to endure anyone sitting next to me, I arrived back into Manchester in time to meet up with blog regular Dan for a quick one in Piccadilly Gardens’ own ‘Spoons (which is certainly a fair bit less interesting) before grabbing the bus back on account of the bloody train strikes. But there ends my last long-range trip for a while. I really enjoyed visiting the city and the ground was decent too. The game wasn’t up to much, but the programme and food were both good and at least there were goals, so there’s that. 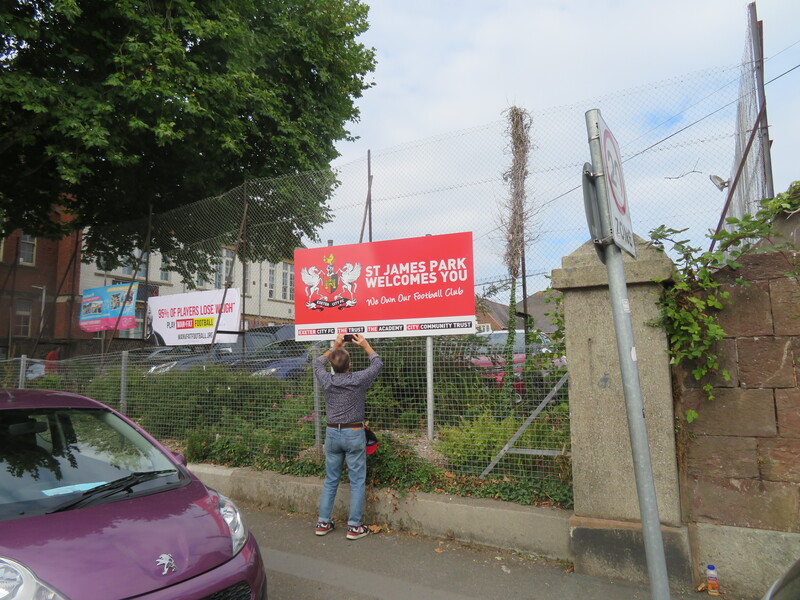 Onto next week and a return to the FA Cup trail, with somewhere a little closer to home on the horizon…. The EFL league season reached its climax over the early May Bank Holiday and this in turn allows for something of a football fest. Three games in three days was to come, beginning with a trip down to the Chilterns for a promotion party. Wycombe Wanderers had just secured their promotion in the previous round of fixtures and with the weather set to move into the bracket known as “warm”, the Chairboys were to be backed by a near capacity crowd in their final game of the campaign, as Gareth Ainsworth’s men looked to sign off in style. So to Adams Park it was. Now, my journey had originally been intended to take in Bournemouth vs Swansea, and I bought a ticket early enough to make it a worthwhile risk. 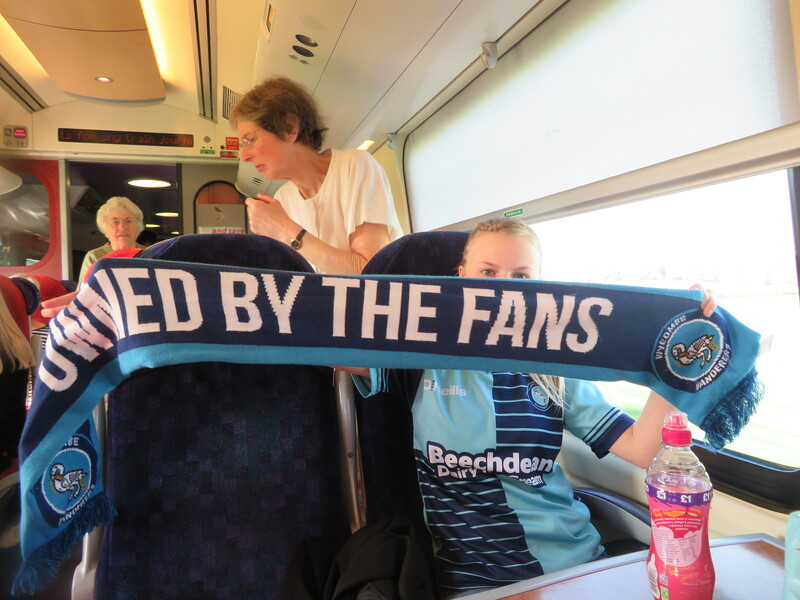 Unfortunately, but not unexpectedly, this fell through in the days leading up to the game and so I required a club to step into the breach and, luckily, both Wycombe and Swindon gave easy enough options – just hop off at Oxford and head either eastward or westward. As it was, the easterly journey was always the more attractive option, with me having wanted to visit High Wycombe for some time and so, with a match ticket safely secured a couple of days before, an early start saw me catch the 8.25 service out of Manchester and down towards the famed university city. As chance would have it, come the train’s arrival into Stoke-on-Trent, I would be joined at “my” table by a trio of (I assume related?) Wycombe fans of varying levels! They provided great company and entertainment for the trip down, prior to them leaving at Leamington (whether or not the sentiment is returned may be questionable!! ), though yet again my terrible memory when it comes to names has struck again, so apologies for that! What I do know is that the guy is an FC fan with not too much fondness when it comes to Stockport and Chorley – the former making the encounter with the Stockport supporting conductor interesting! The PAOK shirt is something that isn’t come across often either and it’s something of a shame that camera shyness put off the slightly elder pair, though young Mickie (I remember this, I just hope I’ve got the spelling right now!) was happy to display her colours, as shown below! After passing by the grounds of Leamington and the decent-looking Banbury United on the way down, I arrived into Oxford with good time to buy a ticket for the 40 minute trip over to High Wycombe, which came in at an extra £9 or so, so not too much more out-of-pocket, especially when taking into account the very decent ticket prices offered up by Wanderers too. 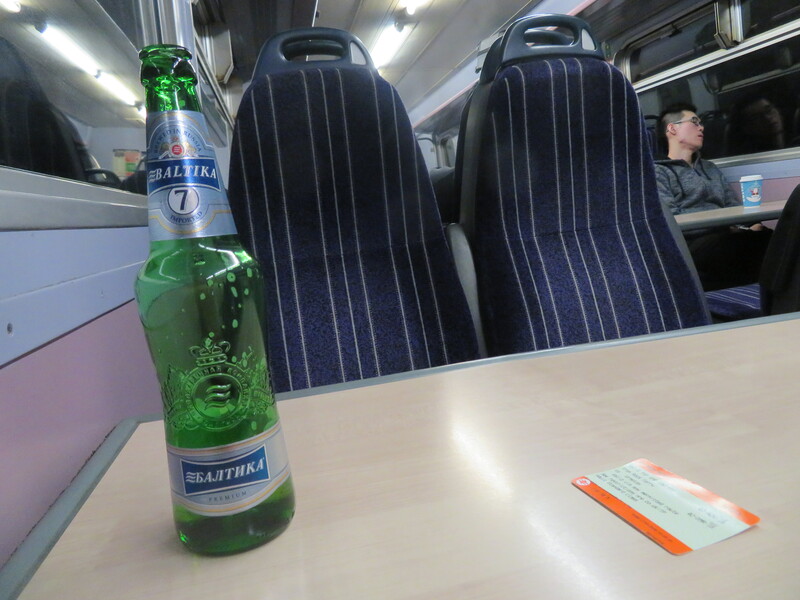 Anyway, the journey passed comfortably enough, though the initial quest for a drink went horrendously…. 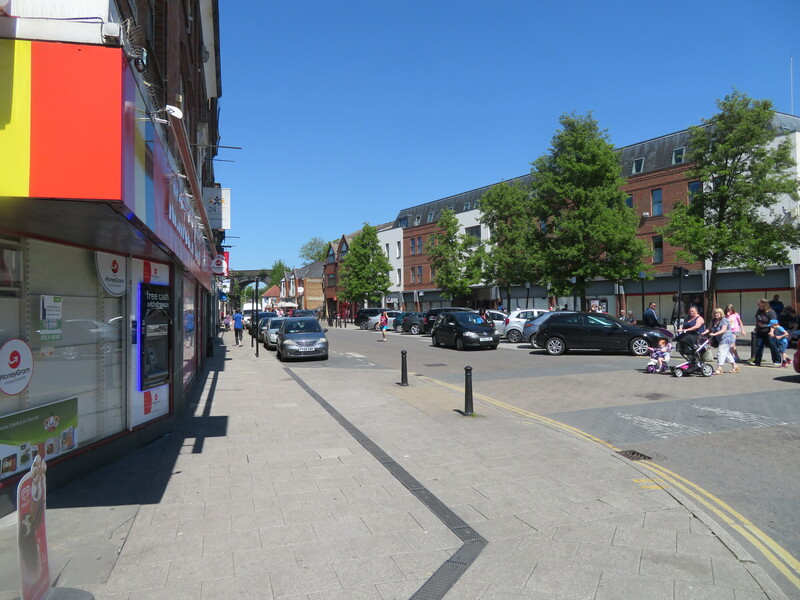 I initially took the wrong exit from the station and so was left having to navigate through a dingy underpass and back towards the far more pleasant town centre. 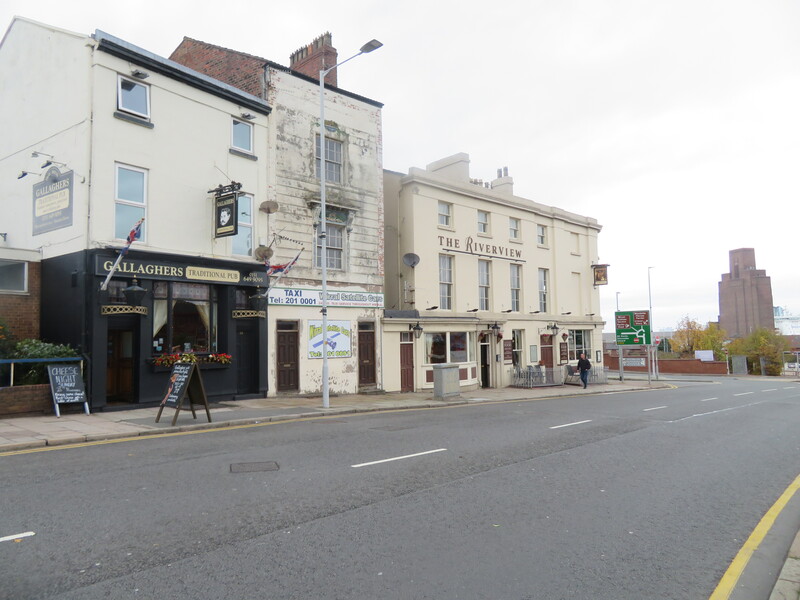 My eyes initially set upon the Three Tuns which looked a decent enough boozer…well, that was until I was left standing at the bar for well over five minutes while all and sundry around me were getting served first, despite me having money out in full show. As such, I decided that if my money wasn’t wanted in here, then I’d happily give it to somewhere else. Sadly, this also wouldn’t be the quaint-looking Antelope down by the side of the church there, with this one being shut up. This was made all the more painful when I noticed that they were advertising Hop House for just £2 a pint. Ah. After having a quick look in the finely named Mad Squirrel just across the church’s grounds, I instead reckoned I’d leave that one for now and head on over to the far end of town where I knew there were a few options too. These were namely the Snug and Heidrun and with the latter’s interesting grouping of ales within taking my fancy, I opted for them to end my ever-growing thirst. The prices weren’t exactly all that cheap, though this was fairly understandable given the options and strength, and given all the reasons there, along with the fact I wasn’t too sure how they’d go, I decided to just try out a half of the 6+% Nanban Kampai, a tropical fruity ale for £2.95. It was bloody good too, so no complaints here. Having planned out something of an itinerary to follow from here, I set off for the aforementioned Mad Squirrel, another tap house bar. Having seen the wide variety on offer in here, I settled on a pint of the Hop Fest which appeared to be brewed by the bar and possibly on site. All good, as was the price tag of £3.95, with it again being a lovely tasting drink, though it was soon time to continue my travail of Wycombe, which would end at the bus stop which, as luck would have it, just happened to have a bar all but opposite it. You’d think I planned it or something, wouldn’t you? 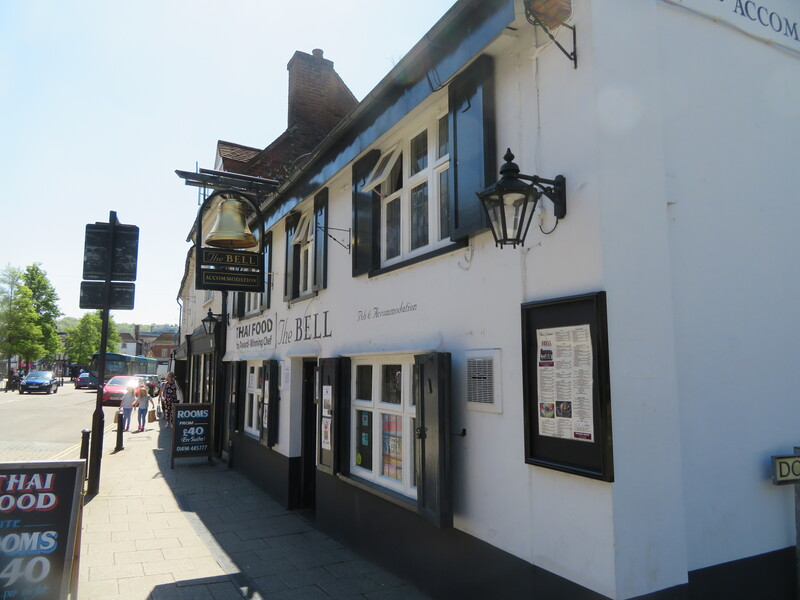 Before I got there, though, a quick visit into the old, wooden beamed Bell Hotel was paid, with a pint of Amstel in there coming in at somewhere in the mid £3 range. Having finished up in the Bell rather swiftly and popping just around the corner and under the A road that passes by there, I arrived at the Chiltern Taps which, as I mentioned, sits just a minute or so from the bus station, where a few buses can be caught to around five or ten minutes from Adams Park. Anyway, a second Amstel in here was around the mid £3 mark once more and having arrived at the station just as the bus pulled in, I was soon en route to the ground. Dropped off not far from the Hourglass which is near enough at the foot of the road leading to the ground, I instead made my way over to the ground where I planned on meeting back up with the Wycombe fans from the train in the marquee bar they had informed me of. After collecting my ticket and taking a couple of exterior pics of the ground, I made my way over only to see the form of a steward standing guard right outside the doors. This didn’t look too good and, indeed, it wasn’t. No-one was getting in and, to be fair, this was probably a wise choice as, having joined the queue for the turnstile with a good 20-25 minutes to kick-off, I only got to my seat after a minute of the game, this also taking in a visit to the food bar, with it looking unlikely to be any easier come the break. A Chicken Balti pie was the choice of the day today, and with it being a Pukka, you know what to expect. Having reached my seat up in the towering Frank Adams Stand, the rest of the ground looks fairly miniscule in comparison, but this does allow for nice views up the hills behind the Main Stand opposite. 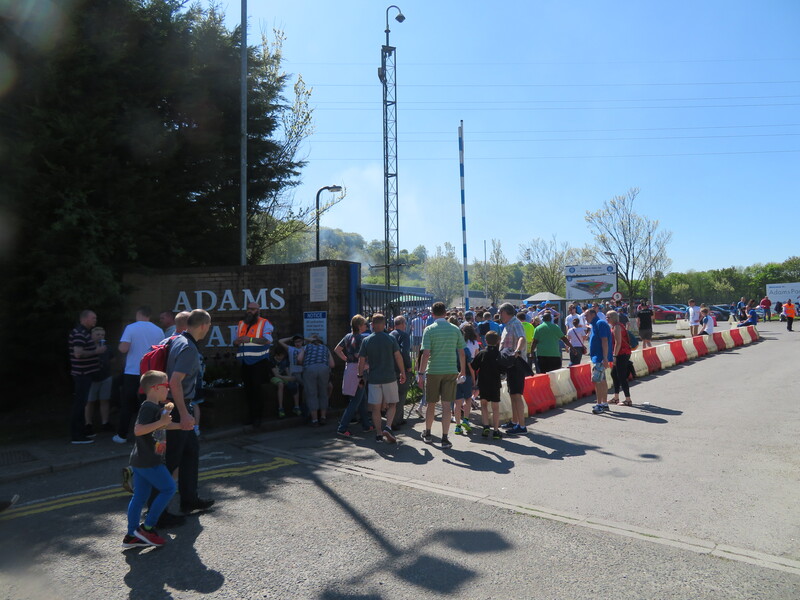 The Frank Adams stand, as I alluded to, is by far the largest of the structures that make up Adams Park and is named in memory of the man who donated the club’s former Loakes Park to the Chairboys. 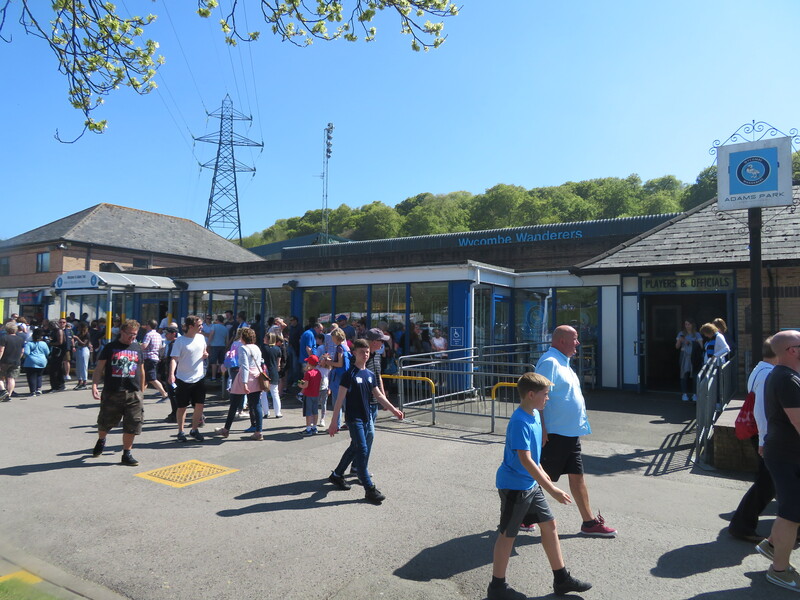 It is two-tiered and houses the executive boxes, The Main Stand opposite plays host to the dugouts out front, as well as the dressing rooms and the tunnel is to the centre. It is pretty interesting though, as the seats are raised from ground level, meaning they are accessed by sets of stairs and an area to walk along the front runs along the touch-line, with people stopping to watch now and again, without being unnecessarily harassed. Behind the goals, the two covered ends are slightly different, in that the home end is still terraced and the away end is all-seater. Between the latter and the Main Stand is a large video screen (though this was MIA today) and a smaller, more standard scoreboard. The terrace is where the main area of noise emanates from and this was my area of choice, prior to it selling out far in advance. Still, I was more than happy with my seat just about on half-way and with the action already ago, it’s probably best to delve into the history of the Wanderers right now…. 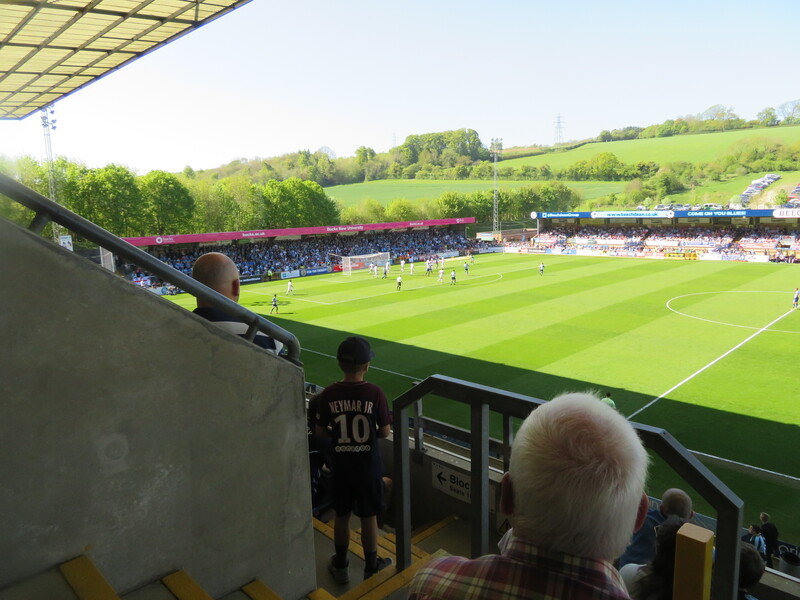 Wycombe Wanderers Football Club was founded in 1887, though a team known as North Town Wanderers did exist in the town from 1884, formed by furniture trade workers. As it was, Wycombe Wanderers came about during a meeting in a local pub and likely named after Wanderers FC, the 1872 FA Cup winners and who Wycombe played in the 1877-’78 competition, losing 9-0. The club derived their colours from the blues of Oxford and Cambridge Universities and originally played friendly games through to 1896 (their first against the interestingly named Wycombe Nose Club), also competing with two sides in the 1889-’90 High Wycombe Cup (the firsts in secrecy as Wild West FC who won it), though also entered the FA’s Amateur Cup in 1894 and the FA Cup the next year, 1895 also seeing the club move into their long-term home, Loakes Park from Spring Meadow. 1896 saw the club join the Southern League and they competed in the league’s Second Division through to 1908, whereupon they declined to retain their membership and instead decided to pursue a future in the professional game, moving to the Great Western Suburban League, remaining there until the outbreak of WWI. Other minor honours for the club saw them win another High Wycombe Challenge Cup in 1894, ’95, as well as the 1894 Maidenhead Norfolkians Cup. The Berks & Bucks Senior Cup was first lifted in 1902 (their first season back at Loakes Park after a short spell away) after a number of final losses in previous years. They have since won a further 28 of these over differing age groups. 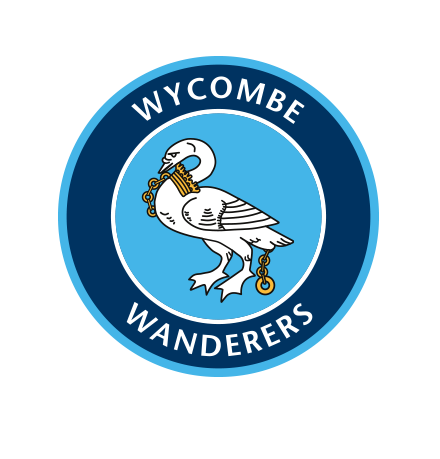 After the Great War, Wycombe joined the Spartan League and won their first league titles in both of their seasons there prior to joining the Isthmian League in 1921, remaining as an amateur outfit. Throughout their spell in the ranks, Wanderers embarked on a quest to be known as the best amateur side in the country. They would win the FA Amateur Cup in 1931 via victory over Hayes at Highbury and the following year saw the Chairboys reach the FA Cup’s First Round for the first time, eventually losing to Gillingham in a replay. 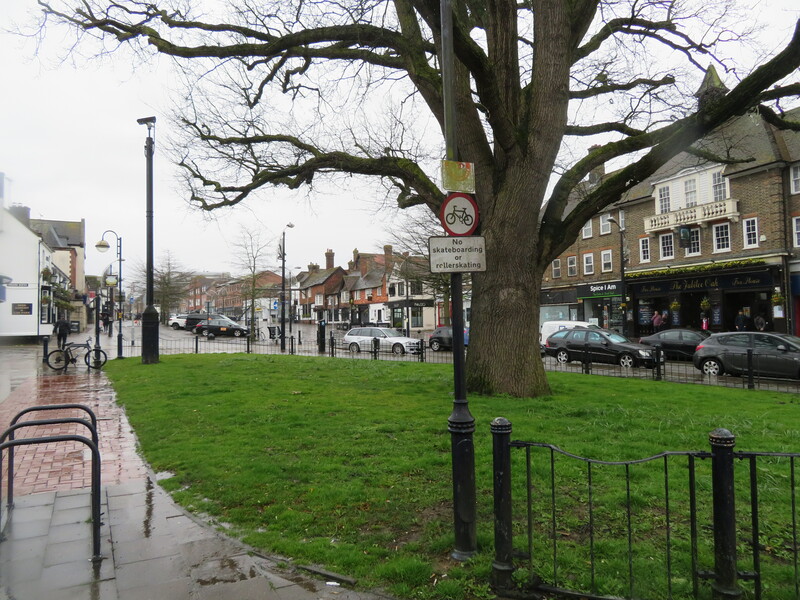 The club would remain in the Isthmian League with little success through to WWII, though the club did continue to play-on through the war years and took part in the Great Western Combination which was won in 1945. 1947 saw former skipper Frank Adams (who’d won the two Spartan League titles as captain) donate Loakes Park to the club and proved the basis for the club to begin a period of success. Wanderers would win their first Isthmian League title in 1956 under the coaching of Sid Cann and this was defended successfully. The 1956-’57 season also saw Wycombe reach Wembley for the first time, though they would suffer disappointment, losing at the hands of Bishop Auckland in the Amateur Cup Final, the North-Eastern club having also defeated the Chairboys in the semi-finals in both 1950 & 1955. Cup runs continued to be embarked upon on a regular basis, the club reaching the FA Cup’s Second Round in 1959, when they visited Watford’s Vicarage Road, eventually going down five-one. Cann would leave the club in 1961, with on-field fortunes taking something of a turn for the worse. 1968 would see Brian Lee appointed as the club’s first “conventional manager” and he led Wycombe to their third Isthmian title in 1971, with the club again defending it successfully the following season, whilst again suffering Amateur Cup disappointment, bowing out in the semi-finals. The Isthmian League continued to be a happy hunting ground though and 1973-’74 yielded a fifth title before it, quite unbelievably, was defended successfully yet again, though by only a single goal. That season also saw the club reach the FA Cup Third Round for the first time, meeting First Division outfit Middlesbrough at Ayresome Park and going down to a respectable single goal in a replay. Lee retired in 1976 and again this proved to be the catalyst for a downturn in form, allied with the abolition of “amateur football” by the FA. Wycombe rejected the chance to join the Alliance League on its formation in 1979 and again in 1981 due to concerns over travel costs. They remained in the Isthmian for the time being and reached the FA Trophy semis for the first time in 1982, losing out to Altrincham. A seventh title would eventually be won in 1983, though promotion would again be spurned in favour of remaining within the Isthmian ranks. As a consequence of a stagnation, crowds began to drop and eventually the club decided to go for it and accept promotion in 1985, having finished third in the Isthmian Premier Division. However, they would immediately be relegated, though bounced back immediately, winning the 1987 Isthmian Premier Division title. They now consolidated their place in the re-named Conference, winning the 1987-’88 Football Conference Charity Shield and finished fourth in 1989, prior to leaving Loakes Park at the end of the 1989-’90 season. Martin O’Neill would join the club during that year as manager and took the club on a run of success which saw the move into Adams Park undertaken in 1990 and an FA Trophy win in 1991, beating Kidderminster Harriers 2-1 under the twin towers. However, the next season would see them come agonisingly close to the title and promotion, finishing second to Colchester United in the Conference, but missing out on promotion to the Football League on goal difference alone. On a more positive note, Wycombe would only have to wait a further season for their League status to be achieved, Wanderers doing a double in taking the Conference title and the FA Trophy for a second time, overcoming Runcorn 4-1 in the final, again at Wembley, before O’Neill spurned the chance to join Nottingham Forest in favour of remaining Chairboys boss, a big boost to the club. The club also achieved a hat-trick of Conference Shields during this time, winning it in each of 1992, ’93 & ’94. This boost was taken into the next year which saw the club’s inaugural season end with a fourth place finish in the Third Division and, thus, a play-off place. 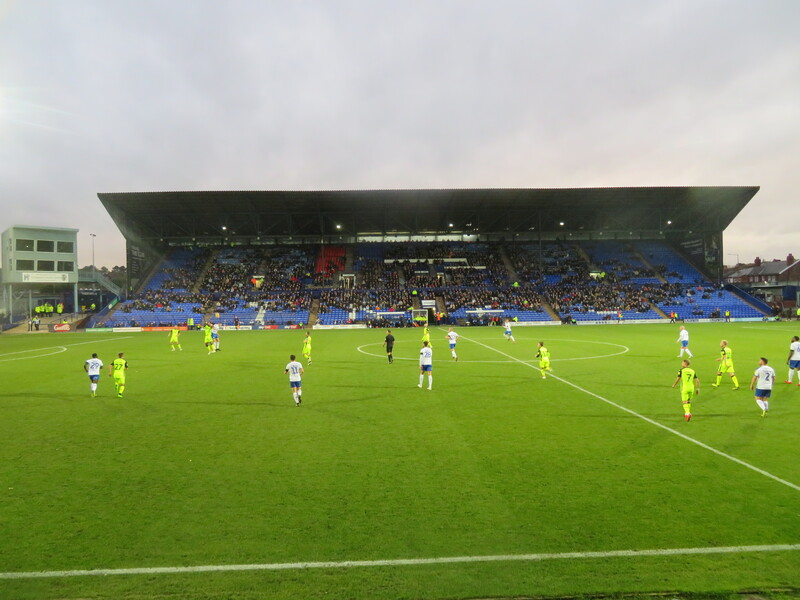 Victories over Carlisle United and Preston North End followed to ensure a second straight promotion was attained, with Wembley again proving a successful venue. League re-organisation put paid to Wycombe’s play-off hopes in their first season in Division Two despite finishing sixth and O’Neill was tempted to depart for pastures new this time around as he headed to Norwich City in 1995. He was replaced for a year-and-a-bit by Alan Smith before John Gregory guided the club to safety come the close of Season 1996-’97. Gregory left for Aston Villa early in 1998 and the managerial merry-go-round wouldn’t end there, as Wycombe would go through a further six managers over the next decade or so. This spell encompassed Lawrie Sanchez replace Neil Smillie keeping Wanderers up in a miraculous escape, as a last day win secured safety. The next year saw this positivity continue and turn into a run to the FA Cup semi-finals, Wycombe beating Grimsby Town, Wolves and Wimbledon en route to a meeting with Leicester City in the quarter-finals, when Roy Essandoah (proper blast from the past there) netted and injury-time winner to set up a clash with Liverpool at Villa Park, a game Wycombe would go on to lose by a narrow 2-1 margin. A productive start to the nex campaign tailed off and Sanchez was replaced by Tony Adams, but he failed to arrest the slide and Wycombe would go on to suffer only their second ever relegation and the club voted to become a PLC, thus ending their spell as the final members’ club in English football. Adams was soon out the door too, with John Gorman taking charge, but his spell was marred with tragedy; midfielder Mark Philo passing in a road accident along with a personal loss for the manager. The club slipped from the top-spot, rescuing a play-off but losing in the semis, meaning Gorman was relieved of his duties in favour of Paul Lambert who led the club to the League Cup semi-finals in a fine run – beating Fulham away, and Premier League side Charlton Athletic. Beaten in the League 2 play-offs of 2008, Lambert resigned and Peter Taylor was installed. He also oversaw a strong start to a season, but again results soon fell away, though Wanderers did rescue matters to secure the final promotion place and return to the third tier, League One. Just one season was spent there prior to relegation again being suffered, with Gary Waddock being unable to save them from the drop, though he did guide the club back at the first attempt. Again, their spell in League One would only last a sole season, with Wycombe again going down to League 2 after a battle against the drop was eventually lost. 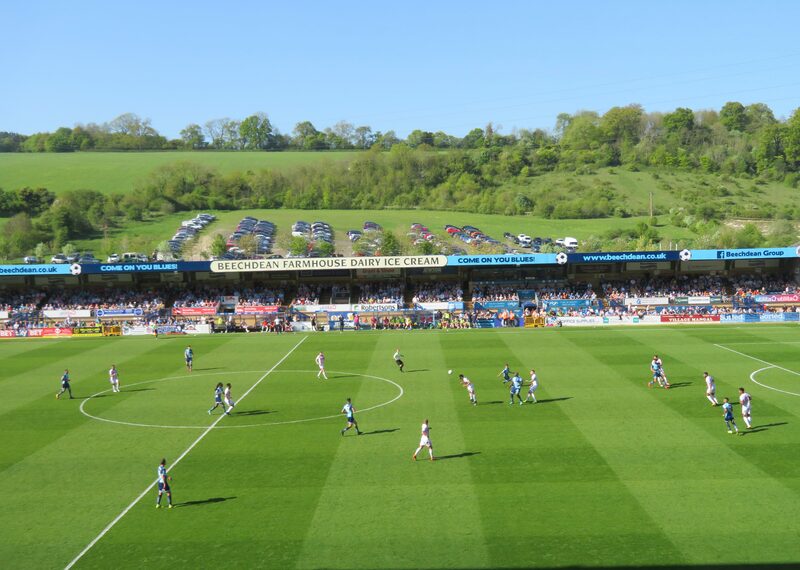 The Wycombe Supporter’s Trust would take over the club in 2012, which ended a transfer embargo. Waddock would be out early in the season, with Gareth Ainsworth taking the reins before ending his playing career. He struggled early on, battling relegation in his first two seasons (the latter seeing the club overcome three-point last day deficit to still stay up). 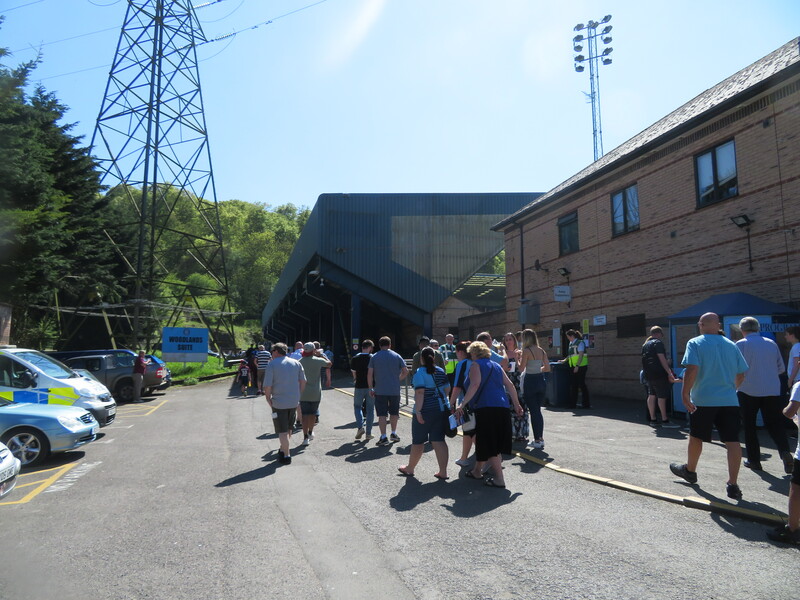 A change in playing personnel saw things turn for the better and after reaching the play-offs in 2015, the Chairboys reached the final but would lose out on penalties to Southend United. 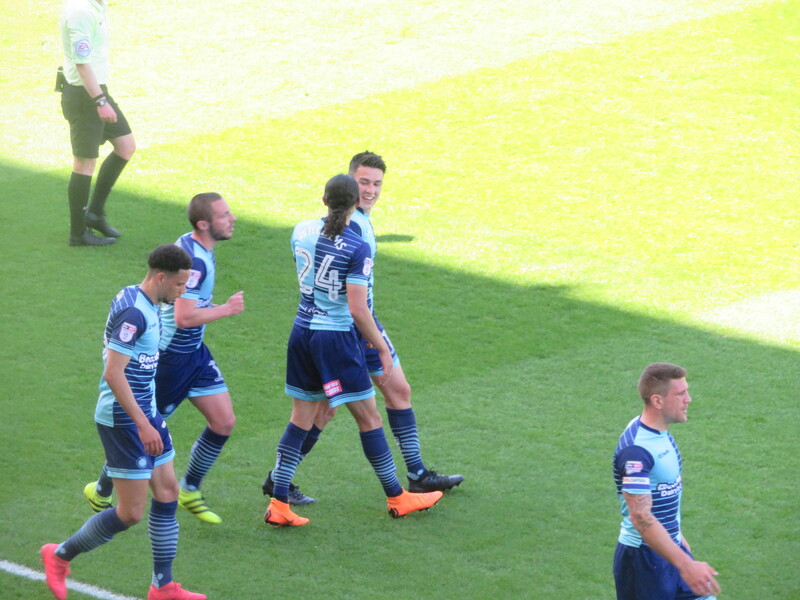 They have remained in League Two until this season, which has seen Ainsworth guide Wycombe to League One after an impressive third placed finish, somewhat against the odds. Now, let’s not beat about the bush; this game wasn’t great. Indeed, as it wore on, it became something more akin to a testimonial, with mid-half ‘keeper subs and the cult heroes getting appearances from the bench it seemed, with Adebayo Akinfenwa’s introduction being as popular as ever, my first viewing of the “Beast” in the flesh definitely being what I expected. The guy is huge! Anyway, let’s get back onto the game and it began at a fairly serene pace, what with little on the line for either side. What chances there were went largely Wycombe’s way, with the visiting ‘Boro’ fans being given little to excite them. The first opportunity came when Nathan Tyson’s ball in was almost turned into his own net by Jack King, before Matt Bloomfield opened the scoring after around 20 minutes when the apparent “Mr Wycombe” as he’s termed on Wycombe’s site found himself in space and he fired under Joe Fryer between the Stevenage sticks to send Adams Park into party mode, if it wasn’t already! Paris Cowan-Hall then saw a pair of efforts fly off target, before Bloomfield forced Fryer into a low stop as the half wore on. 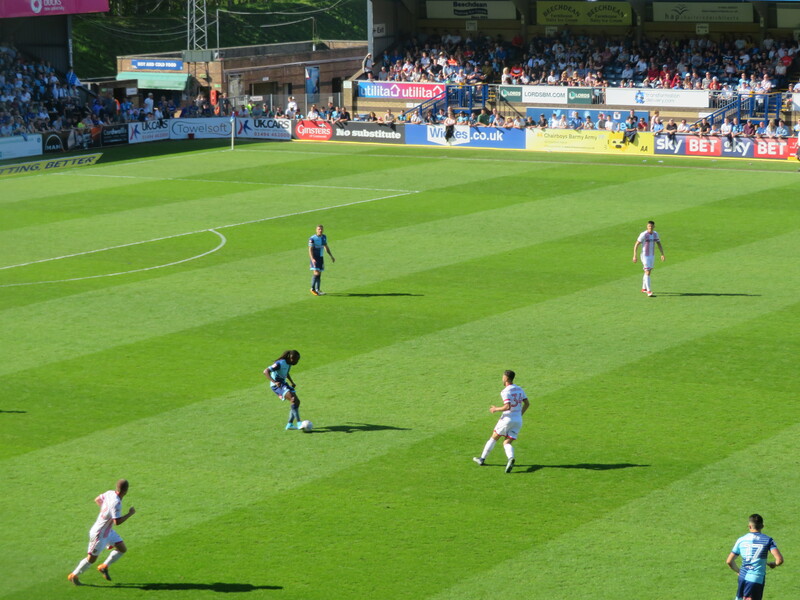 Stevenage looked to have very little to respond with and the first half slowly fizzled out. The whistle duly arrived and the sides headed in separated by the odd-goal, but it looked as though there was far more excitement happening in the terrace than there was on the pitch. Then wrestlers Triple H & The Rock’s entrance themes played out of the PA for no apparent reason during the break. I hoped it truly was “Time to play the Game”. Finally, Stevenage created something of a chance on 65 minutes, Danny Newton heading wide from a corner, before the ‘keeper swap was undertaken with Yves Ma-Kalambay making a debut appearance in place of Scott Brown (whose departure was announced as I write this) who would hardly have broken sweat had it not been hovering around the 23 degree mark. Bean then fired well wide having been encouraged to shoot by many in the stands, desperate to see him double his Wycombe tally, before the “Beast” entered the fray and immediately put himself about in and around the Stevenage defence. But it was to be Stevenage who finished the stronger, with the last couple of minutes seeing the Boro create a final chance when Ma-Kalambay marked his Wanderers bow with what proved to be a match-winning save, Matt Godden’s effort forcing the stopper into a stop with his feet before the whistle blew and prompted the easy to predict pitch invasion. 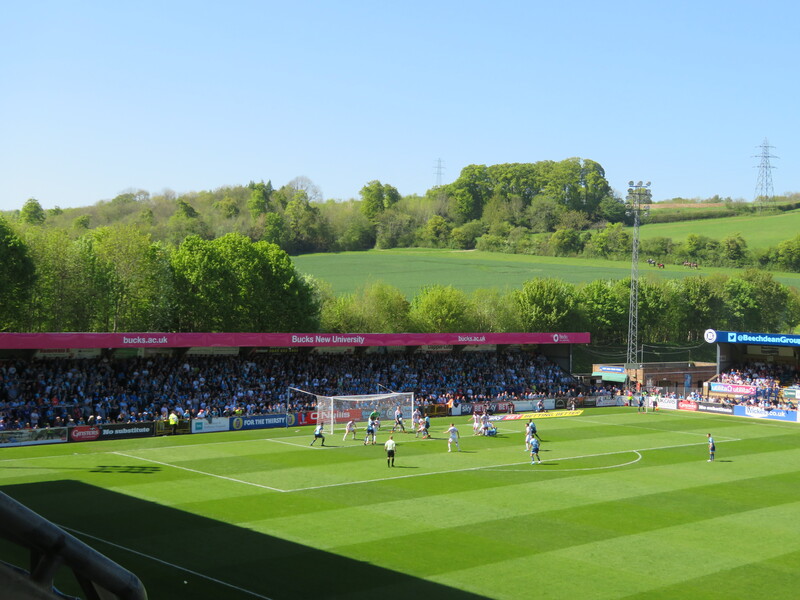 Stevenage needn’t have felt too uncomfortable, with them having played a large hand in securing Wycombe’s promotion the previous weekend, former Chairboy Alex Revell’s hat-trick seeing off Exeter and ensuring his former side’s third place. Pitch invasion in full flow! I was quickly out of the ground though and back at the bus stop in good time for the bus back to the centre. A quick transfer saw me back at the church swiftly ahead of a brief visit into the Falcon, Wycombe’s Wetherspoon’s, for a pint of Punk IPA prior to returning towards the station and the neighbouring Bootlegger’s, where I plumped for the safe option of a Greene King IPA which proved a stroke of luck, with it being one of the cheapest things on offer. 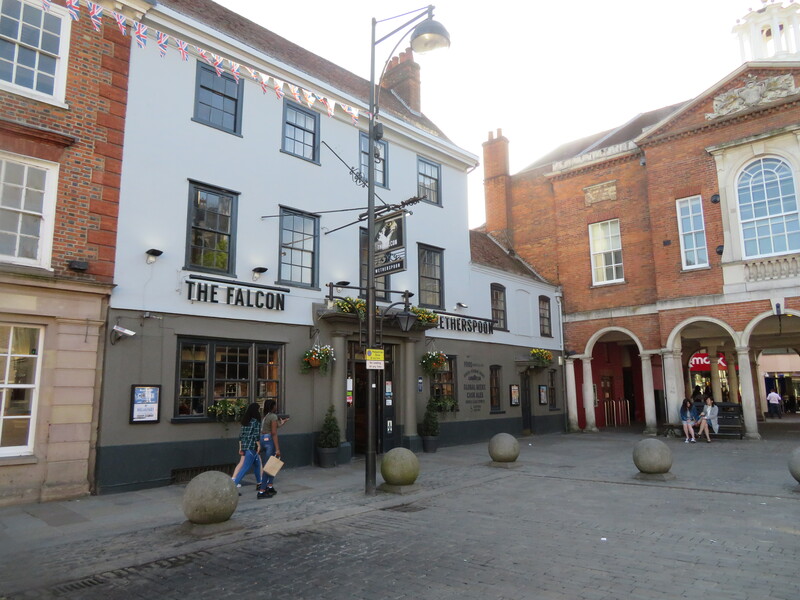 A decent place though and a nice bar to end off my visit to Wycombe. The journey back was a comfortable one, arriving back into Oxford with a good 20 minutes in hand ahead of the train back to Manchester. Unfortunately, a slight delay cost me the connection, meaning a bus job was required to get home. A bus job…that doesn’t sound pleasant….Anyway…! So, what of Wycombe then. 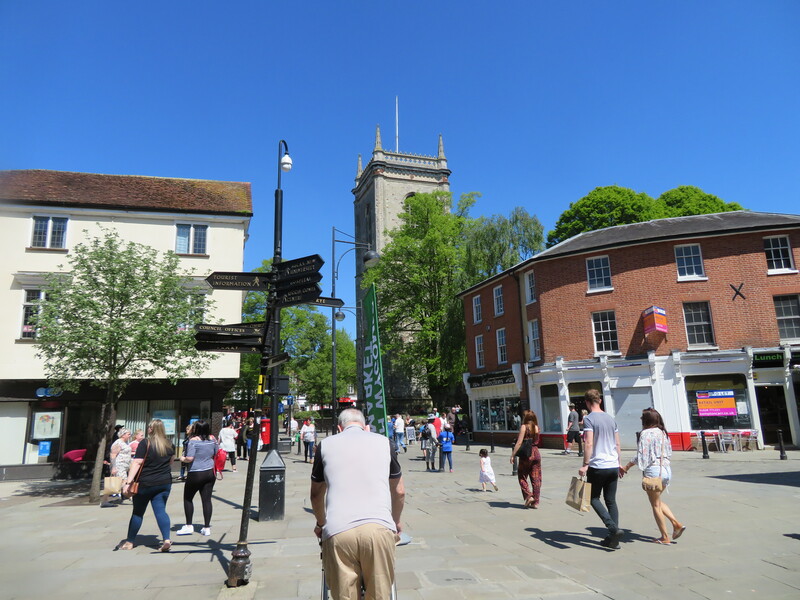 Well I found the town to be a really nice place, even more so with the market in full flow and with the weather fine for once. 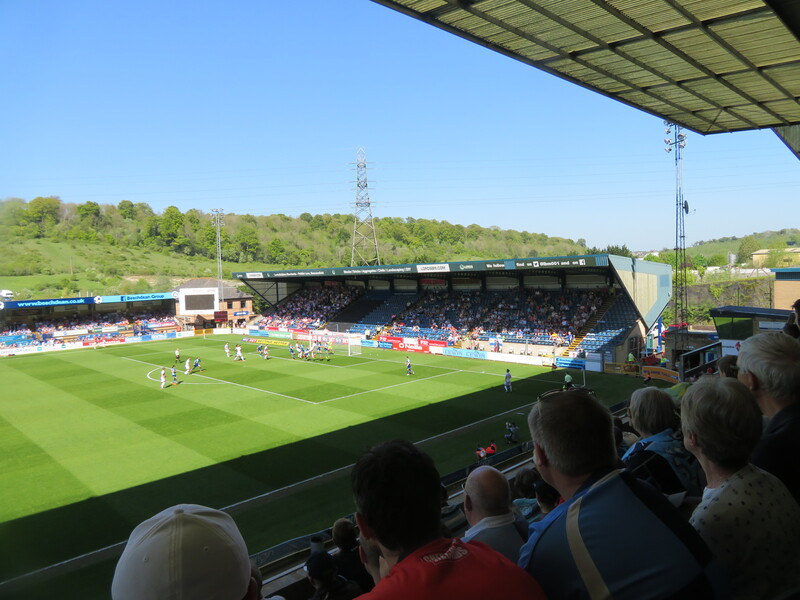 Adams Park was a smart ground too, encompassing its own character and the near capacity crowd certainly added to the occasion. Beer places were on the better side as well, despite a couple being a little on the costly side and the food & programme were all good too (the pie was piping hot, the programme a good read to help pass the journey time back). So there ends another trip. Just a few hours until the next…. Rounding off the trio of Easter games, the Broadfield Stadium would be where I would be spending my Easter Monday afternoon. 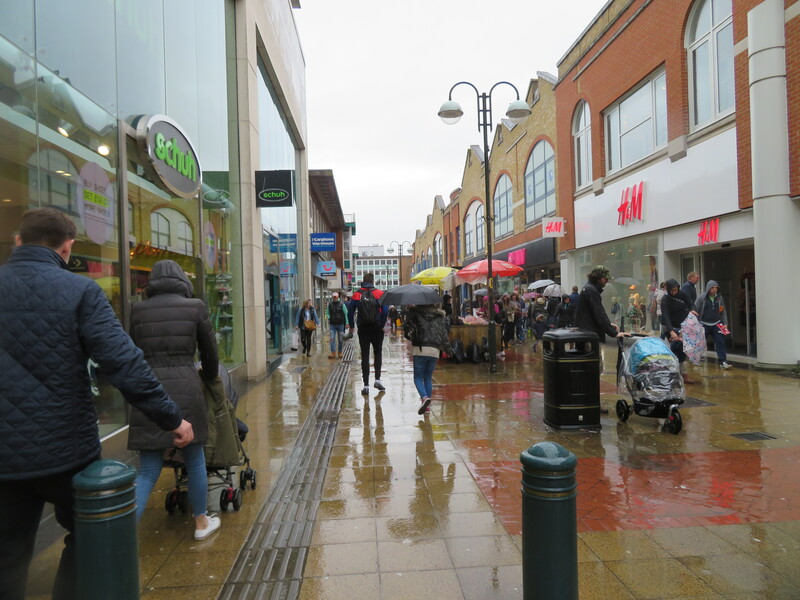 Yes, I was off down to the Sussex town of Crawley for the Red Devils’ game against the Robins of Swindon Town and, what a surprise, it was raining again. In fact, it had rained so much overnight up North, that the whole of the North West Counties Premier was off and so I hoped that things were a fair bit better down beyond the Capital. They were….but only just! As it was, I set off during the early part of the morning and caught the train from Manchester at 9.30am, arriving into London for just after eleven, my journey being mostly spent humouring a young lad opposite me who had roped me into rolling his toy car back and forth – his parents apologetic for this! My good deed for the day done, I disembarked and headed on over to St. Pancras and the Thameslink service which would take me through to Three Bridges, a short hop away from Crawley itself. But, my word, is the Thameslink one of the most infuriating, slow, crawling trains I’ve ever been on. If it got above 20mph for a good 40 minutes, I’d be surprised. The journey could take a good ten to fifteen minutes less, had it only been able to actually go, you know, fast. A nice water feature, though…. Anyway, after getting rather too excited as we passed Gatwick Airport’s threshold, I still managed to make the train connection from Three Bridges as this was delayed too (shock! ), making any doubts regarding this soon dissipate. 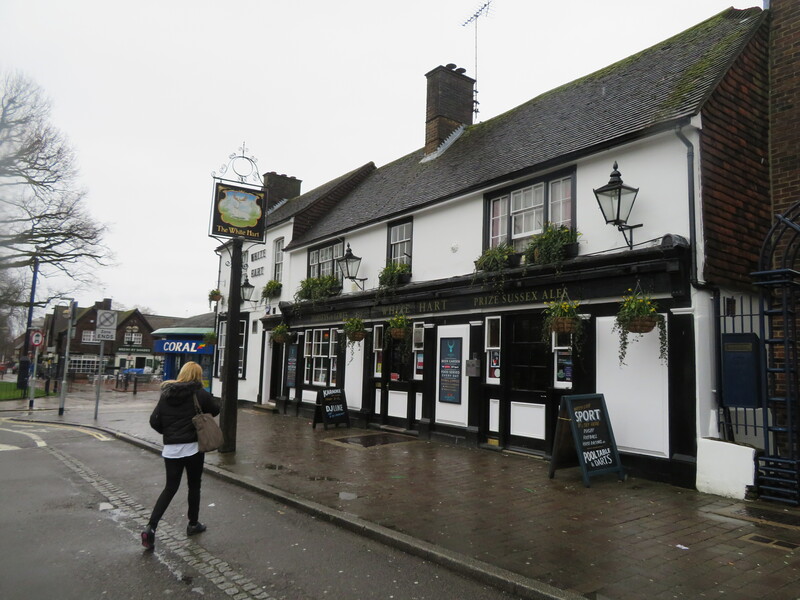 Arriving into Crawley after a further five-minute journey, I quickly headed through the town centre and sought out the first of a few pubs that I had scouted for my pre-match tour of the town. 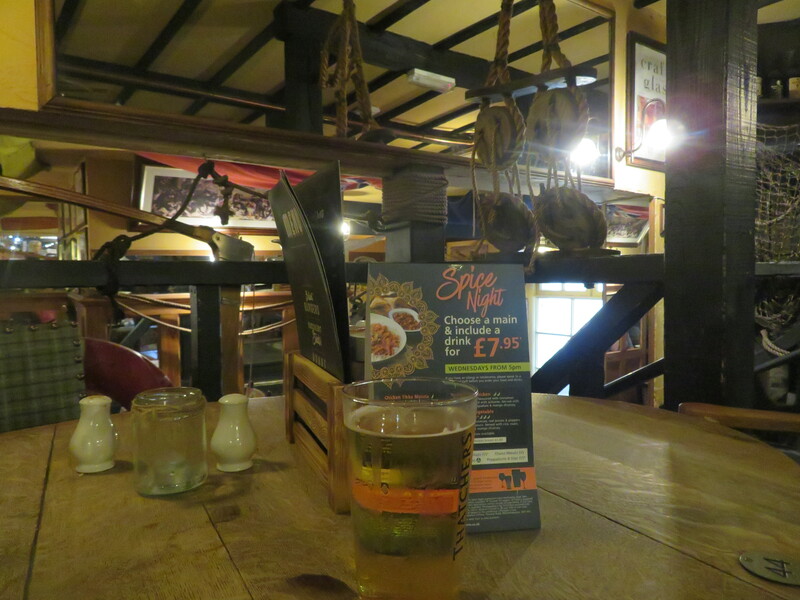 The Punch Bowl was up first, and what a gem of a place it is – a thatched roof and wooden-framed inside, the place gives off a really warm feel, added to be the fire crackling away in one of the rooms. 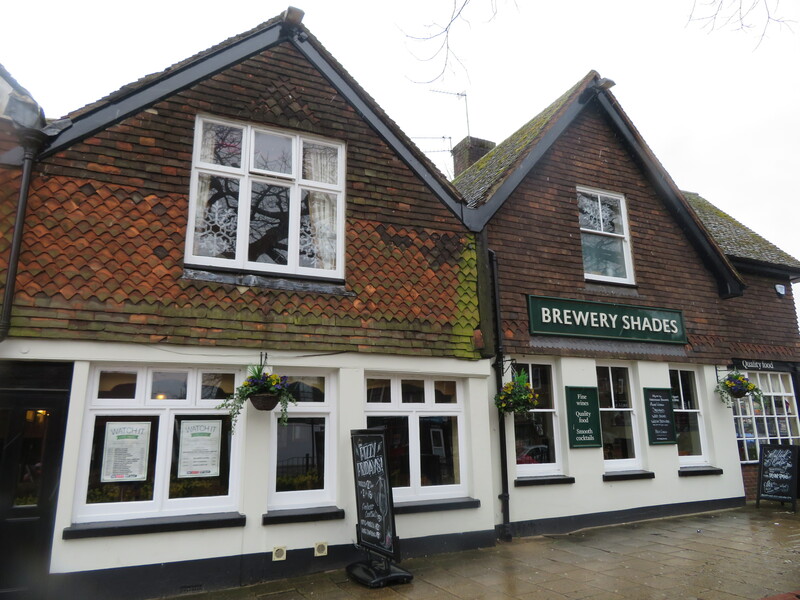 A pint of Hop House (£4.60) was enjoyed in here before Crawley (and obscure Slovakian-Hungarian club) fan Craig, who’d sorted me with a wallet bursting £1 ticket earlier in the week, would let me know that the pub just a couple of doors down wasn’t one to be missed out on either. 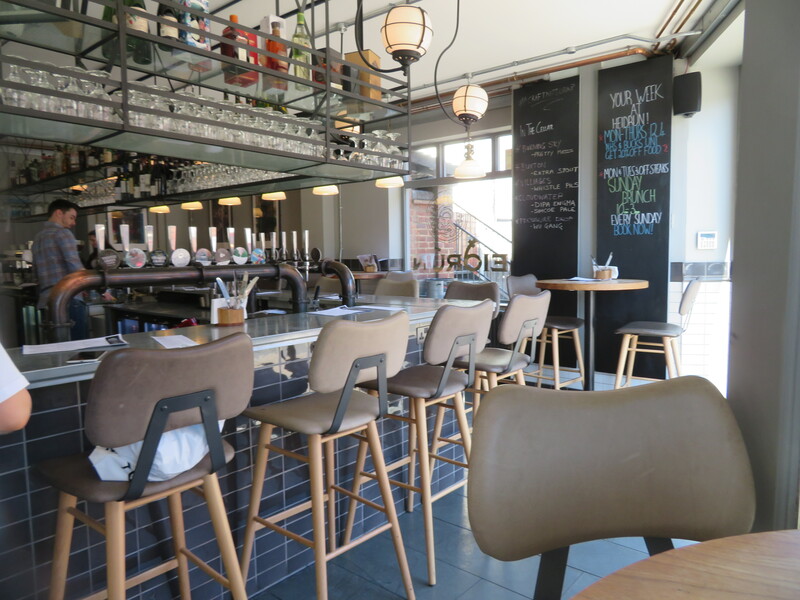 Indeed, it turned out that his local knowledge was on-point, with the Brewery Shades being a very decent real ale offering, though I did instead plump for one of their cider range: the Hazy Hog. At £4.60, it didn’t come too cheap, though it’s to be expected really, I guess. After a fair wait for the stuff to settle out of the pump, I settled in for a short while to watch a bit of the Preston-Derby game. A quick shout to the staff here too, who were very friendly and humorous, which isn’t always the case, as I’ve found on numerous occasions. It goes some way! Crawley, with Spoons on the right! I was next roped into the White Horse next door, which wasn’t a planned stop, but I figured it’d be wrong to miss one out in favour of a Wetherspoons. 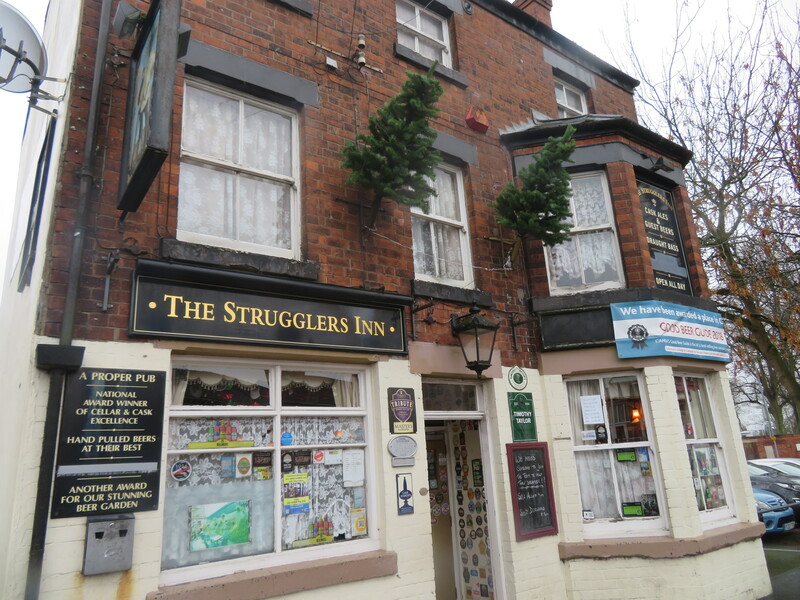 It was ok in here for a quick one and a pint of Strongbow (£4) fit the bill for that just nicely, with me deciding to stick with the cider with time beginning to run tight ahead of the bus which would deliver me to the gates of the ground. Finishing up there, it was over the road to the Spoons for a swift Kopparberg, before charging over to the bus stop via a car-park side-road, making it in the nick of time. The #10 service took around ten minutes to make it to the Broadfield and, upon debussing at the ground, quickly secured a programme – a fairly thin issue for the £3 – and almost immediately spotted Craig awaiting my arrival, after I’d selfishly delayed him of his usual entry time by a good half-hour and he would inform me that his usual spot had already been taken, on account of the higher than usual crowd, attracted in by the club’s “Pay What You Can” offer. Apologies, Craig! After a stop-off for some ok chips (£2.50 I think) at the food bar just within the turnstiles, I was directed over to the terracing behind the goal, with us originally ending up near a small band of more vocal home support, before Craig located his mates and we moved off over there instead for a slightly more serene afternoon. 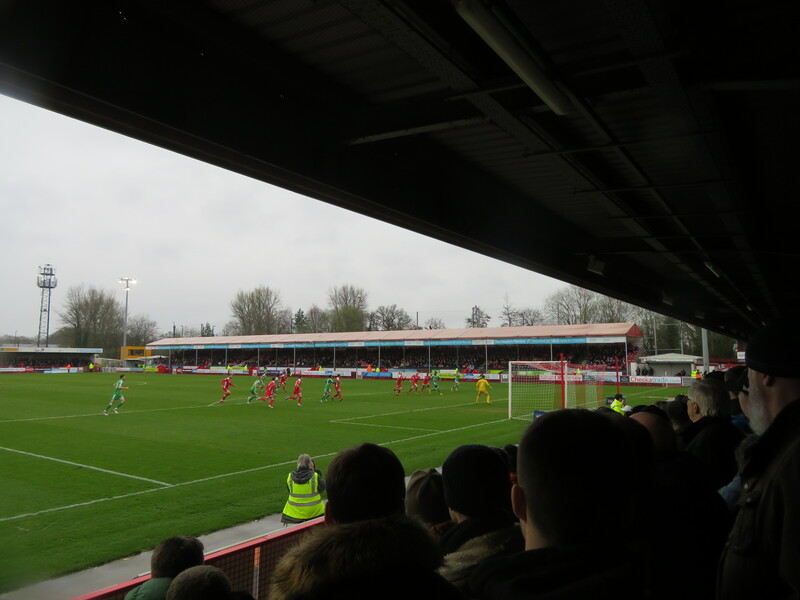 The Broadfield is a tidy ground, with the trees surrounding it providing a feeling of quaintness. Both ends feature similar-looking covered terracing areas that run the width of the pitch and continue round the corners to all but connect with the Main Stand, to our right, which has some of the more interesting floodlights I’ve seen in a while situated on its roof, protruding on some scaffold-like structures. The Main Stand, which straddles the half-way line, also hosts the tunnel, the dugouts out front and hospitality areas. Opposite is a temporary all-seater stand which, similar to Bristol Rovers, has a tent-like tarpaulin roof running along it, keeping those within dry from the elements today. It runs the length of the pitch over the far side, with ownership of the land behind apparently creating issues building anything more permanent. 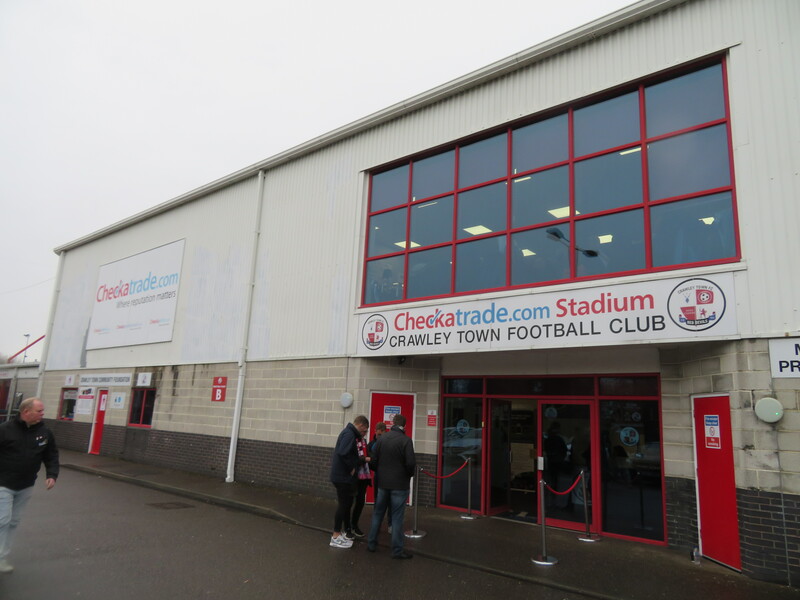 So that’s the Broadfield in brief and this is the history of the Red Devils of Crawley Town…. 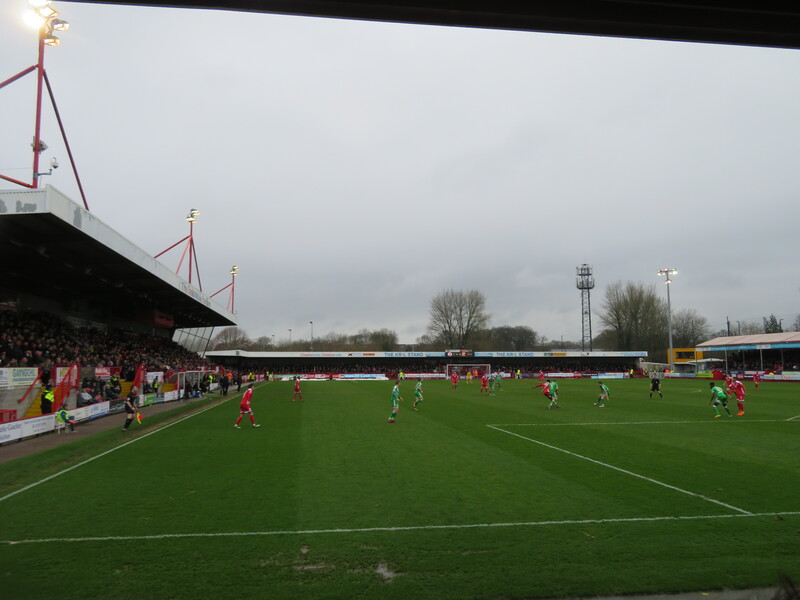 Crawley Town Football Club was founded in 1896 and became a founding member of the West Sussex Football League later that year, joining the ‘Junior Division’. They remained here for the next five years before moving to the Mid-Sussex League, winning the league title in their second year there. However, come 1935, the club would disband but would reform in 1938 and join the Division 2 of the Brighton, Hove & District League prior to WWII ending their short spell. Around the end of the war, Crawley FC (as they were known at the time) joined the Sussex County Emergency League for a time in 1945 before the end of hostilities saw them return to the Brighton, Hove & District League once again, joining the Division One for Season 1946-’47. Here they remained through to 1951, when the club switched to the Metropolitan League – a competition for both professional and amateur sides. 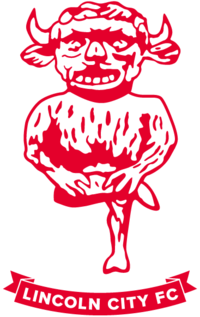 After changing name to Crawley Town in 1958, the club remained as an amateur outfit and won the league’s Challenge Cup in 1959, prior to turning semi-pro in 1962 and going on to join the Southern League the following year, going into the Division One. They would remain there until 1969 when the club achieved promotion to the Premier Division, but would spend just a sole season in the top division prior to being relegated back, though did temper this disappointment by winning the 1970 Sussex Professional Cup. Again, the club would spend a lengthy spell in one division, staying in the Division One (and the regionalised Division One South) through to 1984 when they were eventually promoted back to the Premier Division of the Southern League for a second time. This spell did encompass further cup silverware, coming in the form of two Gilbert Rice Floodlight Cups (1980 & ’84). Their spell in the Premier Division saw little in the way of league success, though cup titles continued to arrive at the club, as they would lift the Southern Counties Combination Floodlight Cup of 1986, the Sussex Senior Cup in both 1990 & ’91, as well as winning three straight Sussex Floodlit Cups between 1991 and ’93, the latter being the last to have arrived at the club’s then ground, the Goldstone, before it then became the first to feature in the club’s new ground, the Broadfield Stadium (they moved in 1997), as Crawley won it for a fourth time in 1999. 2003 saw the club win the Southern League Cup and Championship Match trophy, and 2004 saw this successfully defended, along with Crawley eventually seeing their Southern League stay come to an end after two decades, the Red Devils finishing top of the Premier Division table by 12 points, whilst also adding the league’s Championship Match trophy once again, as well as the Sussex Senior Cup in a ‘quadruple’ winning campaign. 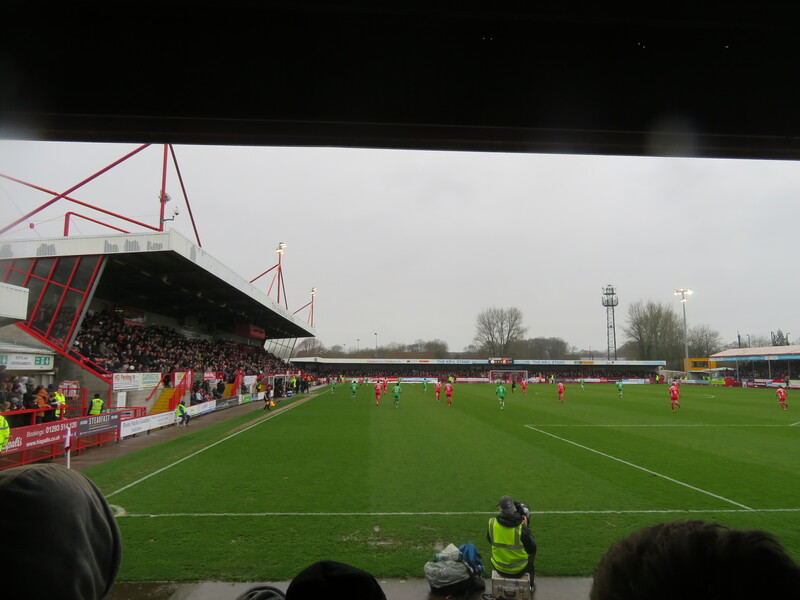 Promoted to the Conference National upon the title win, Crawley ended their first season in 12th, thus becoming the highest-placed part-time side in the country. They also retained the Sussex Senior Cup and after a later buy-out, turned professional for the first time, which saw a number of players leave the club, either unwilling or unable to give up their jobs. Things started badly, the club languishing towards the bottom of the table and having to slash the wage budget by half. 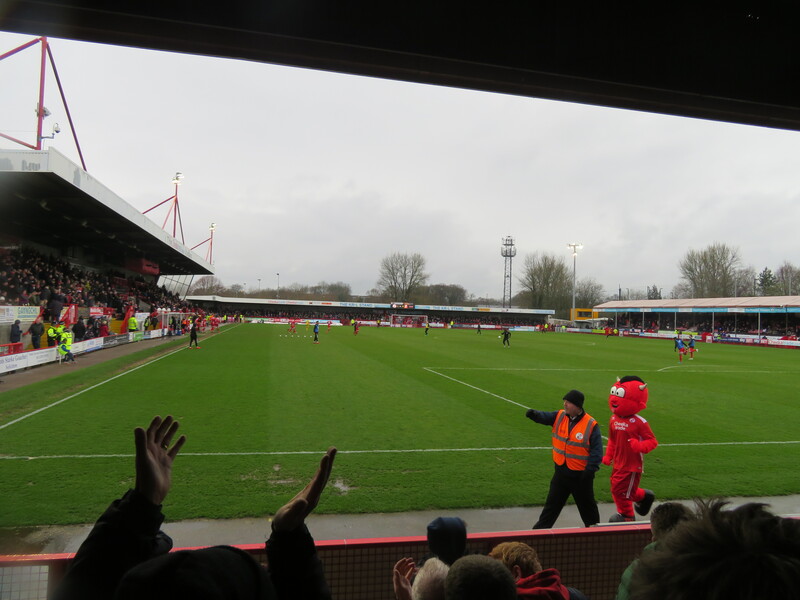 Things would improve later in the season, a five-match winning streak seeing the club rise clear of the drop by season’s end (despite a later 3-point deduction), though Crawley would later enter administration, and come ever so close to folding in 2006, only being saved by an eleventh-hour rescue package. 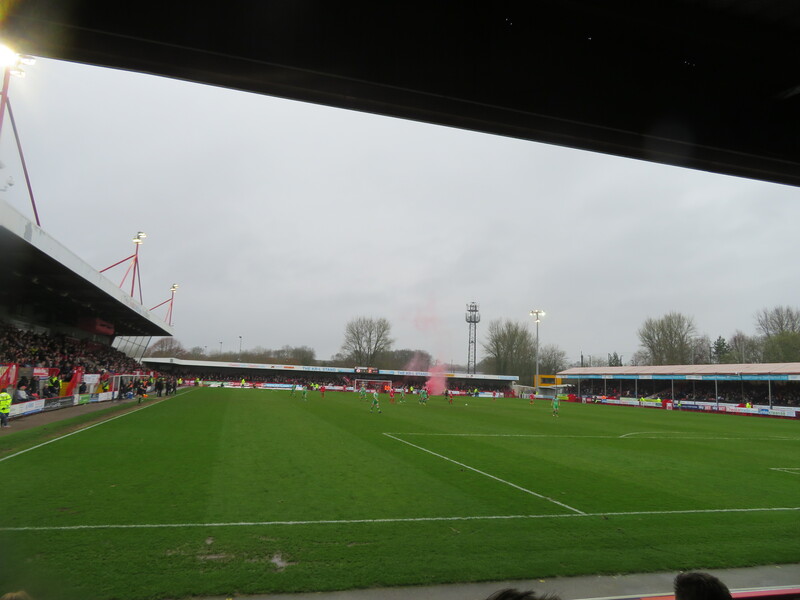 Starting the next season with a 10-point deduction was rather unhelpful and although Crawley overcame this swiftly, form again dipped and they dropped towards the danger zone once again. A change of manager saw them eventually finish up safe once more, scoring the required one point on the final day of the season. 2008 saw a new chairman and manager installed, Steve Evans becoming the dugout’s new incumbent, but a further pre-season six-point deduction was imposed on the club due to their financial standing at the time. However, a further buyout of the club saw these issues become a thing of the past and allowed the Red Devils to begin looking forwards. The start of the new decade saw the club benefit from further investment and new ownership and this helped matters on the field too, with Evans’ side seeing the likes of Matt Tubbs, Richard Brodie and Sergio Torres – the latter for a club-record £100,000 – arrive at the club, though Brodie’s fee was undisclosed and rumoured at over a quarter of a million, a Conference record at the time. This investment would pay dividends, with Crawley going on a famed FA Cup run which saw them dump out Derby County in the third round, Torquay United in the next prior to bowing out at Old Trafford by the slenderest of margins, a one-nil defeat to Manchester United. However, the season would be overshadowed by the death of the then owner, though the club would fittingly go on to take the Conference title soon after, reaching the Football League for the first time. 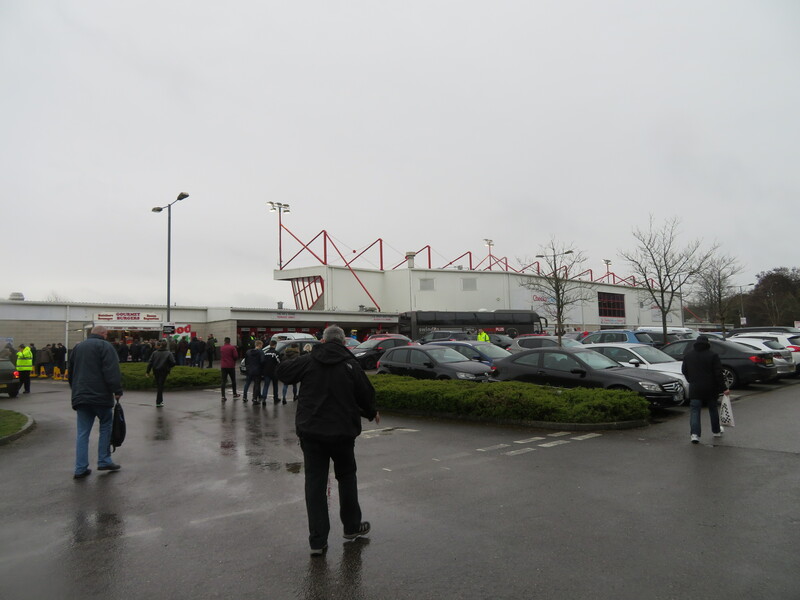 Another lengthy FA Cup run would follow, with Crawley again reaching the fifth round via wins over Bristol City and Hull City before bowing out to another City, Stoke, in their first match against top-tier opposition at their new home, the Broadfield Stadium. Finishing 2011 top of League 2, things looked promising, but things fell away and the club won just two of 14 during that time, whilst selling some of the club’s “better” players and seeing others banned for their respective parts in a post-match brawl. 2011-’12 saw Evans leave the club for Rotherham late in the season, with coach Craig Brewster taking the reins and going on to guide the club to promotion to League One by the end of the season, the club defeating Accrington Stanley on the last day to achieve the feat. However, Sean O’Driscoll was installed but left for Nottingham Forest before even managing a game. Richie Barker was instead brought in and he took Crawley to 10th place, though would be sacked himself early in the following campaign after talking to Portsmouth over their manager’s job without consent. John Gregory was his replacement and kept the club in mid-table before departing in mid 2014-’15 due to health reasons. However, their poor start saw them unable to recover under Dean Saunders and Town were relegated at the end of the season, Saunders becoming the latest boss to be ousted, his place on the bench being taken by Mark Yates who himself lasted less than a season, a poor campaign seeing them finish up 20th. Dermot Drummy was the next cab off the rank and a strong start to last season looked to be a good omen. But again the form went out of the window and he was out after a year in charge, with the club having again spent the season looking over their shoulder at relegation. They would recover, finishing up 19th, with former Champions’ League winner Harry Kewell taking charge ahead of this season where, after a sticky start, the club find themselves in a solid mid-table position. Before long, the teams entered the field and we were underway with the early action in the game seeing both sides exchange chances. 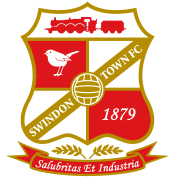 First, Swindon’s Matty Taylor saw his deflected cross head towards goal, only for a defender to get back and clear the danger, before Mark Randall replied for the hosts, firing a fizzing drive wide of the Robins’ net. The game had started off at a good pace, but we would soon have our first stoppage. Challenging for the ball in the middle of the field, the visitors’ Luke Norris fell awkwardly and was latterly forced from the field on a stretcher after a quarter of an hour, with what looked to be an arm/shoulder injury. It didn’t look too great and hopefully he’s ok. This obviously disrupted Swindon’s plans fairly early on and, just around ten minutes later, they found themselves behind. 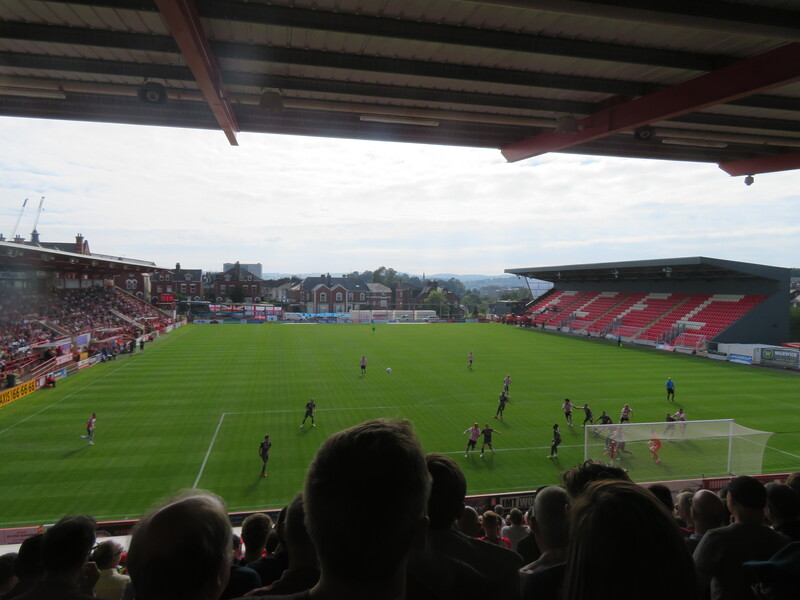 In the 25th minute, the ball found its way to Jimmy Smith on the extreme right of the Swindon box. 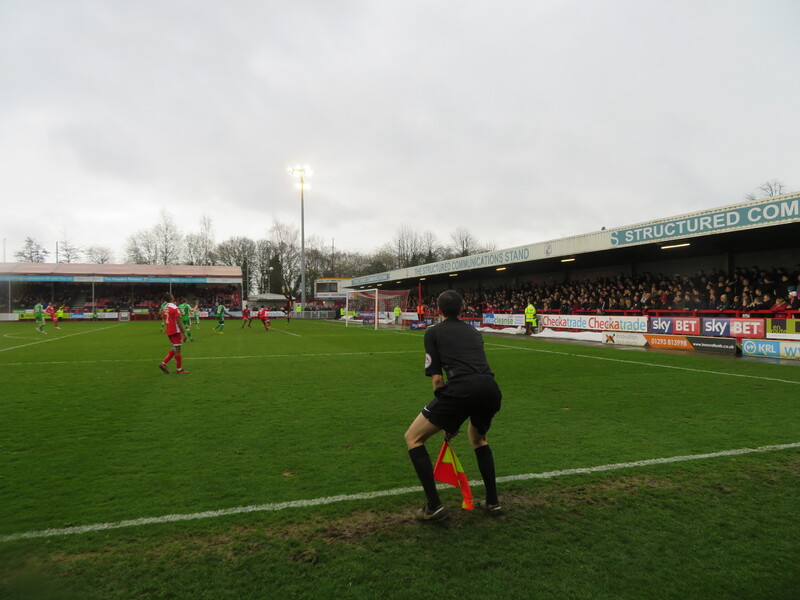 From here, there looked to be little to no immediate danger, but Smith was having none of that and he unleashed a superb, volleyed effort which flew across Stuart Moore between the sticks and into the far side of the net to give the hosts the lead and bring the majority of those in the bigger than usual crowd to their feet. One-nil, Crawley. This goal would signal a spell for the home side where they would begin to exert pressure for a time, with Karlan Ahearne-Grant forcing Moore into action twice, first forcing him into a sharp stop down low and, just before the break, firing in a fine, curling shot that looked destined to nestle in the top corner, only for Moore to pull off a fine stop, diving across goal to palm the ball behind for a corner, which was then cleared by the Robins’ back-line. 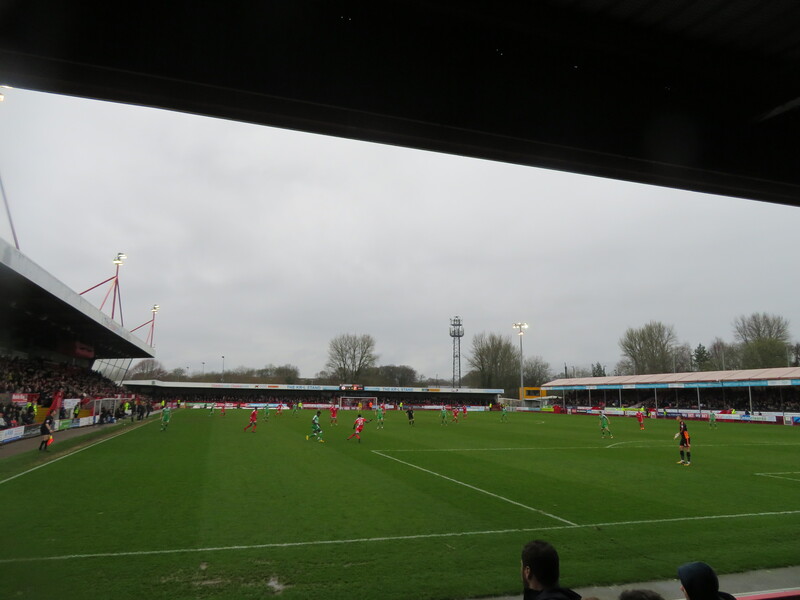 The game had been a watchable one, if a little on the quiet side in terms of chances, but it was Crawley who went in ahead in the battle of the Town’s. Half-Time was spent listening to Craig reading out a number of strange score-lines from around the country (none-more-so than Yeovil’s first-half thrashing of Coventry) and watching the Crawley mascot overcome his opposite number in a race to the posts and back to halfway. He was pretty pleased with himself too and it was hoped within the ranks of the home support that this would be something of an omen of what was to come once the final whistle was blown. We didn’t have long to wait to find out…. 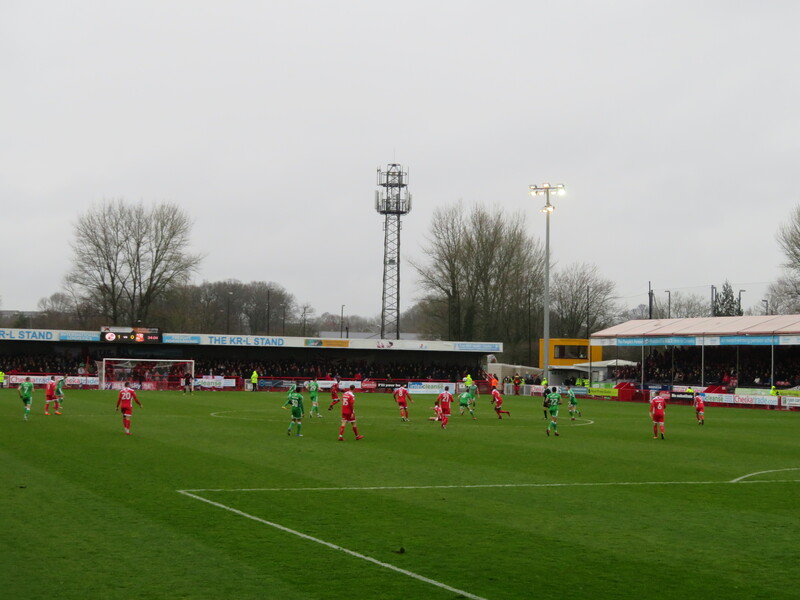 The second half got going with Swindon on the front-foot and striving to get themselves level. Firstly, a pair of early chances from Woolery & the veteran skipper Taylor forced Crawley stopper Glenn Morris into a couple of saves, but it was Crawley who went closest to netting again during the early part of the half, when Panutche Camara robbed a defender of the ball and pulled it back for Randall and his shot beat Moore this time, only for the upright to come to the rescue and keep the Crawley lead a slender one. 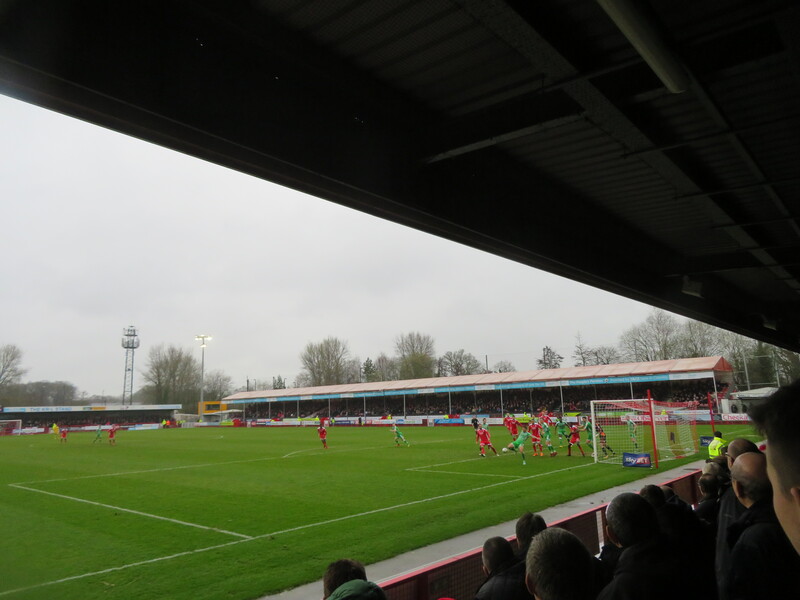 The dangerous Ahearne-Grant then forced Moore into another stop – the keeper knocking the ball clear with his legs despite looking to have been wrong-footed, with Swindon responding via Ollie Banks’ drive which forced Morris into action and Paul Mullin, who fired wide from the resultant corner. The game was picking up the pace as it entered its final throes. Then, with five-minutes left, disaster struck for the hosts and those in the home ends, as sub Marc Richards met a ball from the right and guided his header nicely beyond Morris and into the net to level up the scores and send the sizable Swindon contingent behind the goal into raptures. On came the smoke-bombs and we were set for a grandstand finish! Unfortunately, this never materialised and the sides cancelled each other out in the final few minutes, meaning that both had to settle for a hard-earned point on what was a difficult surface in places, especially one bit down the side of the box near us, which was nearing waterlogging proportions. As for me, I bid goodbye to Craig just prior to the whistle, as I had to beat a hasty retreat to the bus stop, as my booked train back from Euston had been originally planned around a visit to QPR, only for it to work out better to head to Loftus Road in a couple of weeks instead, with my other planned game at Fulham having been moved by the EFL. Ah, you scamps! Despite his kind offer of a lift up to the station, the bus was definitely the safer option and I arrived back at Crawley station with five minutes in hand before my train to Three Bridges. 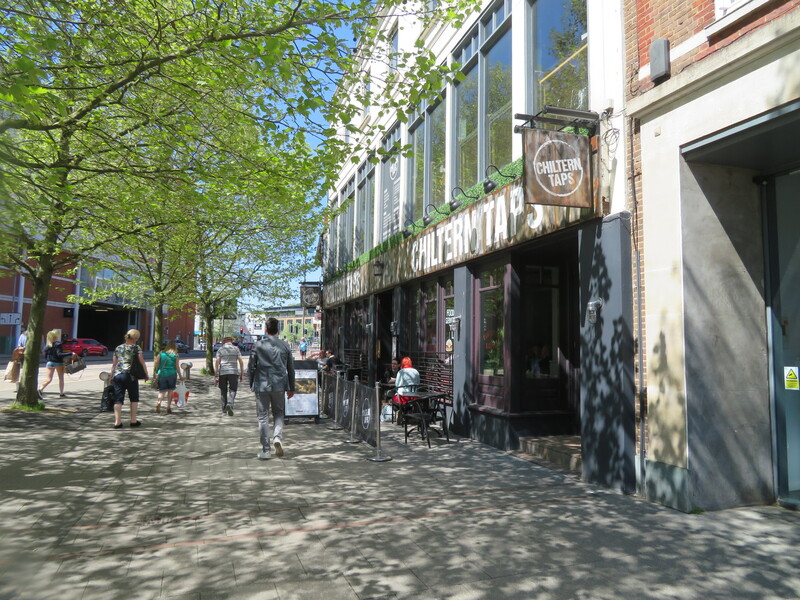 Safely over, I soon realised I’d have a good twenty-minute wait there, which I didn’t think would be too exciting nor memorable and, wouldn’t you know it, there just happened to be a pub right opposite the station there! What were the odds?! (I hadn’t already noted that, of course….!). 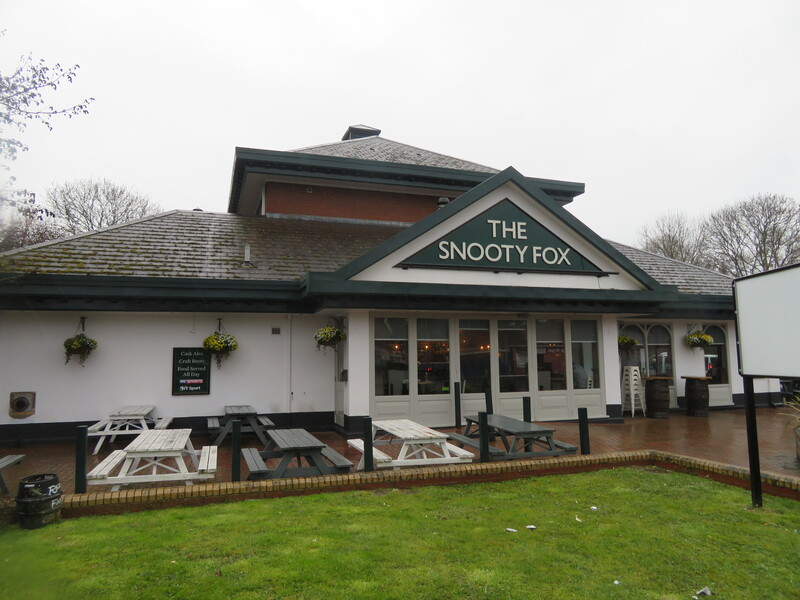 The finely named Snooty Fox was a nice, modern establishment and a pint of Amstel (£4.80) was enjoyed in there before I had to return to the station for the train back into London. After being allowed out & back in by the understanding guard (I mustn’t be the only one who has done this plan before! ), I was back arriving into St. Pancras with little issues, after a quick bit of sight-seeing through the window whilst crossing the river en-route. A short walk later and I was back on the train in the nick of time. Sorted. Upon my arrival back in Manchester, I had a good 45 minutes or so for my connection home and thus I decided to head back into the Piccadilly Tap for the second time this weekend. It proved a good choice as, having been told my first choice of the still Hogan’s cider wasn’t on at that moment, I instead had a fizzy one, only for them to bring over a free pint of the still stuff, on account that no-one behind the bar drank cider. The good deed from earlier had paid off and it meant a positive end to the trip, which also later saw a guy get on the train with a boom-box and manage to even get the guard involved in a phone recording. Scenes. So there we have it. Easter 2018 is in the books, as is my visit to the Broadfield. 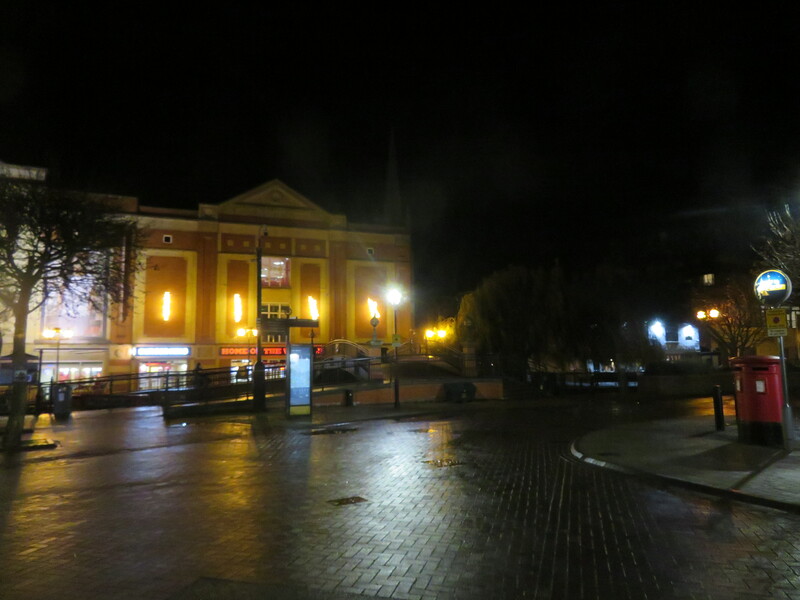 Crawley is a far better place than people make out too, especially so if you have an idea of where you are going (the ancient-looking hotel looked cool too, though I couldn’t tell if they had a bar and decided not to risk wasting time). The ground itself is decent and the game was ok too, though you can’t complain much for a quid (cheers, Craig!). So, it’s onwards to next week and a trip into Yorkshire for something a little more rural…. The “Beast from the East” struck with a vengeance during the week and, in doing so, decimated fixture lists up and down the country. Indeed, even my planned game at Aston Villa was called off during the morning as the British transportation and road systems came to a grinding halt once again, upon the arrival of a few inches of the white stuff. Maybe we should ask tips off the likes of Finland who must have nowhere near the budget/manpower of the UK, yet get by just fine? Anyway, moan over. For now. As it was, I was left to study the fixture lists once again and had even come to the conclusion that a local amateur reserve game may have to have proven sufficient, if anywhere at all. 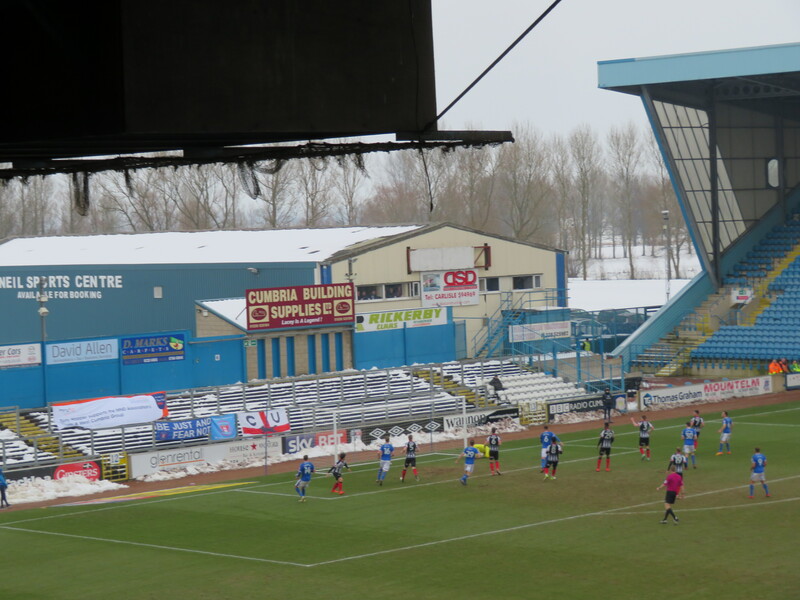 That is until I had a silly thought enter my head, that being a trip up to the border city of Carlisle, with Carlisle United having pretty much confirmed they were all set to go once the covers on the pitch had been fully cleared. This had all come early enough to enable me to still get into Carlisle with plenty of time in hand too, but I wasn’t fully committing just yet! As such, I decided to head into Preston first up for a short while and wait for definitive confirmation of “Game ON!” before continuing on up North. But, having reached my connection at Warrington (I was having to work around the striking Northern staff), I found myself arriving just in time for a delayed direct train through to Carlisle and so reckoned I might as well take the plunge and head straight there. It proved a good decision too as the message soon came through from Brunton Park that the ground staff and volunteers had completed a sterling job and cleared the pitch and, with the Grimsby side pictured walking down a street in nearby Penrith, there looked to be little to stop the game going ahead. 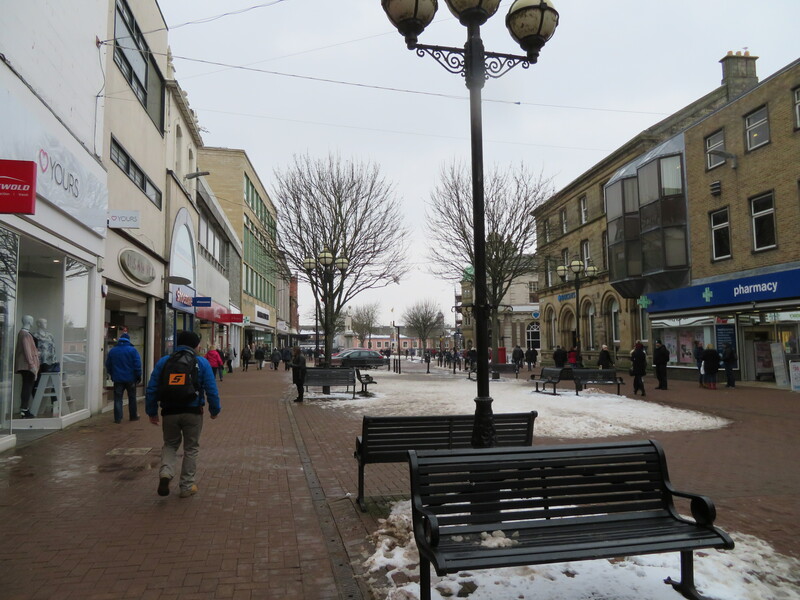 Carlisle know how to cope with the snow! 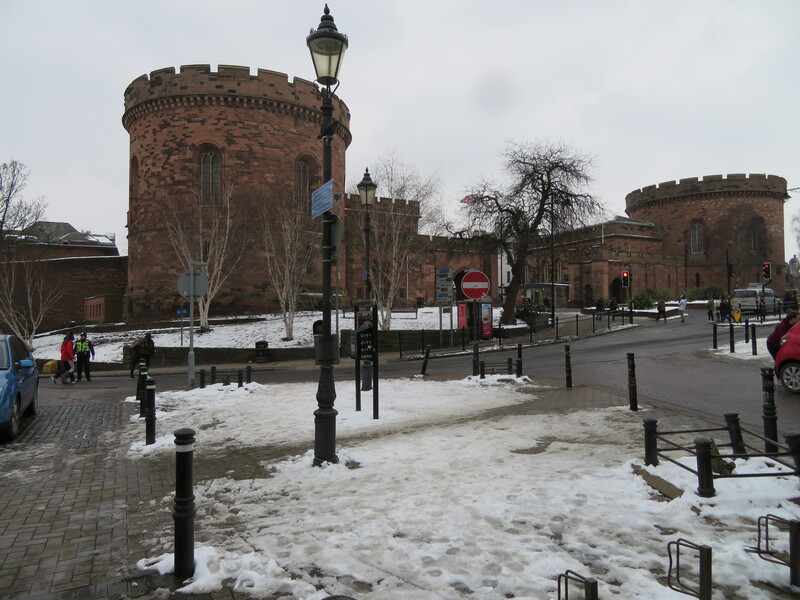 After passing through the snow-capped hills of the Lakes, I arrived into the city at just after midday and headed off for a quick look at the castle at the far end of the city centre. With that complete, I reckoned I might as well nip in somewhere out of the cold and, just by chance(! 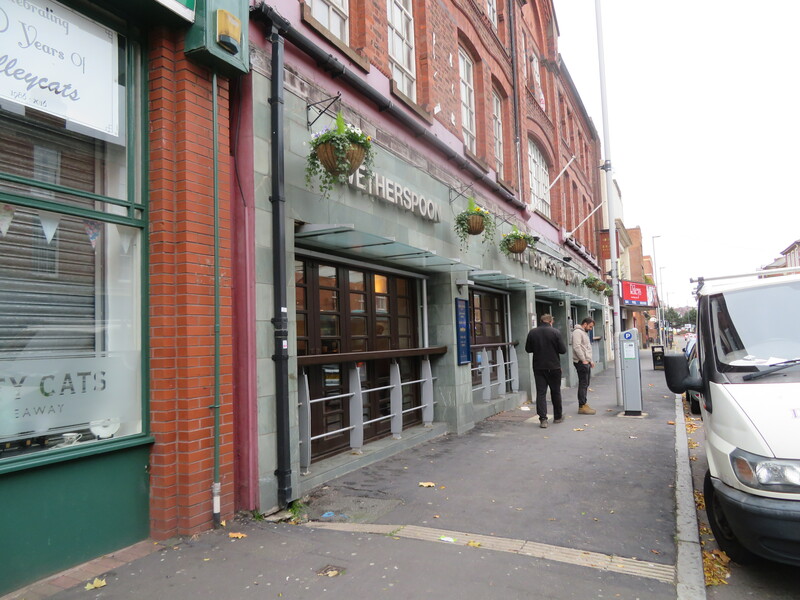 ), a pub by the name of the Boardroom happened to be right on hand. Talking of hands, I soon had a pint of Moretti (£4.20) in mine and settled in to plan out the remainder of the trip over towards the ground. However, my next stop had already been decided upon, with the Sportman’s advertising board working well in attracting me to visit the “17th century inn”. Finishing off in the quiet Boardroom – which I think I may have been the first customer of the day in – I headed back into the surprisingly busy centre and, after being confused by the arrows pointing the wrong way on the board, eventually found my way to the Sportsman which sits alongside the city’s cathedral. A lovely, quaint, building, the Sportsman definitely keeps hold of its traditional feel, being only quite a small building and it has a really welcoming feel to it. I also heard good things from those eating in there, though I didn’t partake. Instead, I stuck with lager in the form of San Miguel (£4). 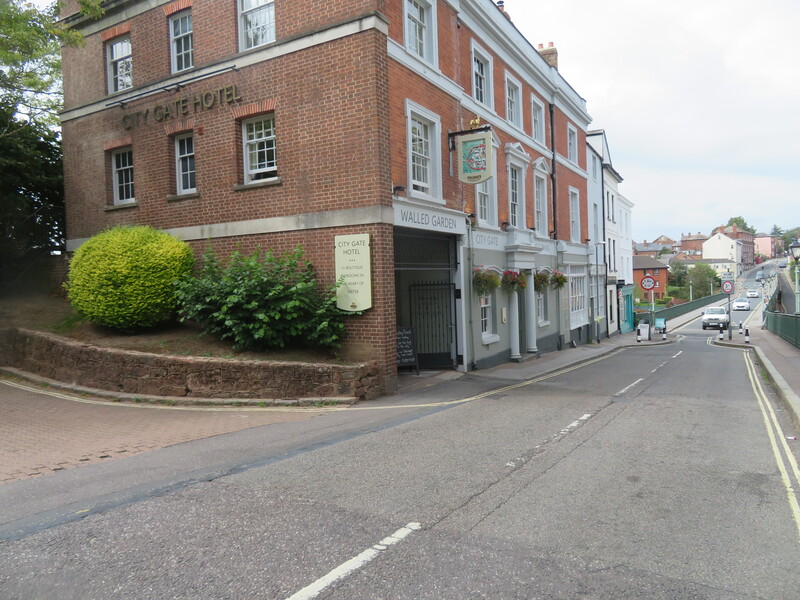 Again my stay was brief and I continued onwards through and past the citadel-style walls and station before arriving onto Botchergate and having a wide choice of pubs to choose from along both sides of the road. I decided that the Border Rambler looked decent enough and it was alright too, a pint of Amstel setting me back a tick over £3. 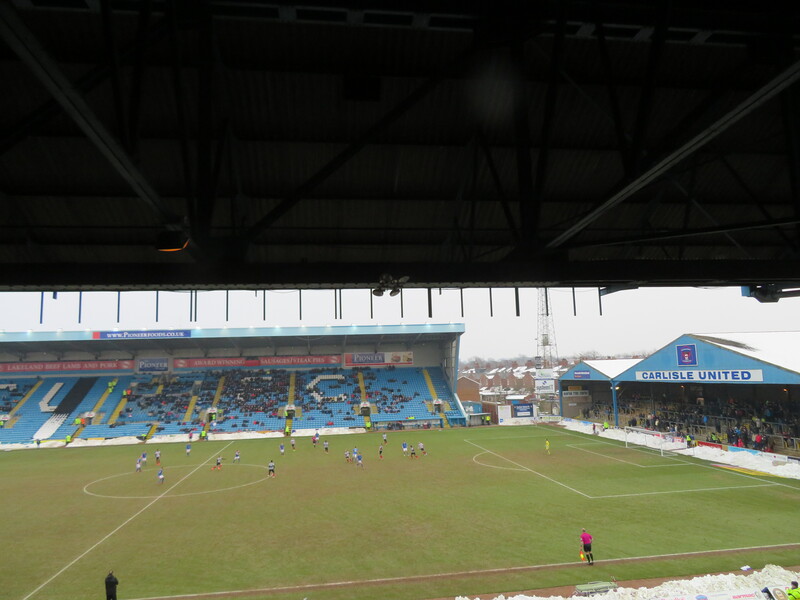 From the Rambler it was off to Brunton Park itself, whilst dodging the icy, untreated pathways en route to the ground. 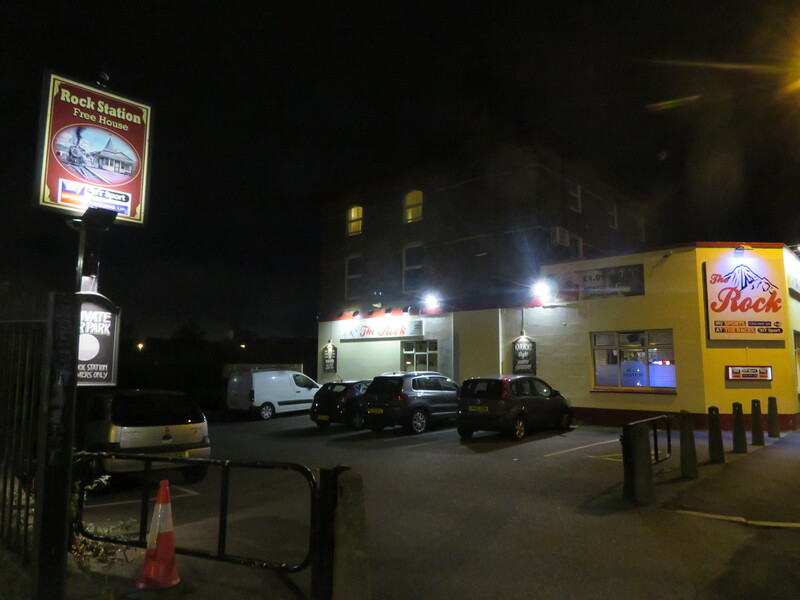 Having done so successfully, I clocked the Beehive pub opposite and earmarked it as my final pre-match stop. But first it was to the ticket-office where I secured my discounted £10 “Mad March” ticket and was placed up the steps alongside the office, just about on half-way and nicely out of any weather that may have been approaching us. 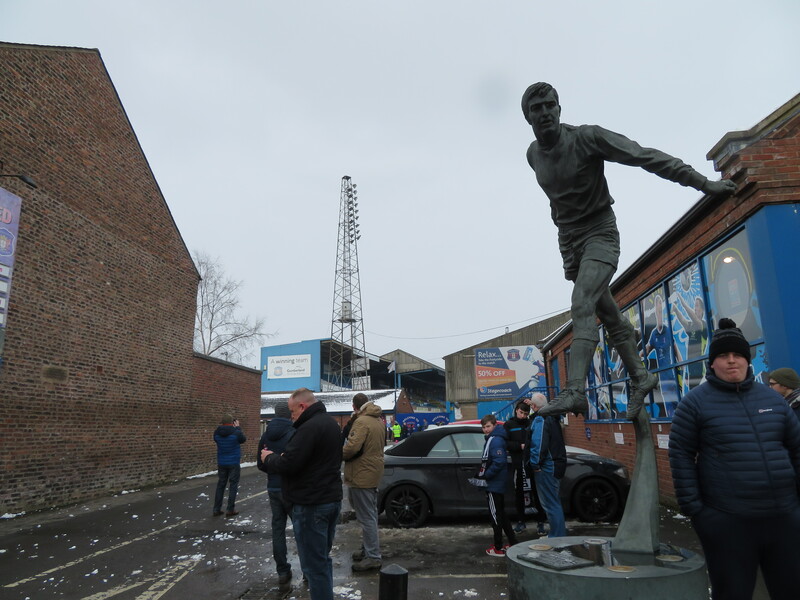 With ticket and a programme (£3) safely stowed away, I back-tracked to the aforementioned Beehive which today was housing fans of both sides, which included some hardy souls who’d made the arduous journey from the East coast of Lincolnshire. Good effort from the 150~ Mariners. The Beehive was duly packed with standing room only at first, before the place began to empty out on the full-time whistle at the Burnley-Everton TV game. Soon enough it was time to join the earlier leavers and head back to Brunton Park once more, which was just a couple of slippery minutes away. Upon arriving and heading up those stairs I mentioned earlier, I only had my ticket scanned at the top of the stairs (a somewhat strange layout) and headed up towards the rear of the stand, with my seat being just a few rows from the top. As such, I was allowed a good view over the play which was due to start in a few minutes time. 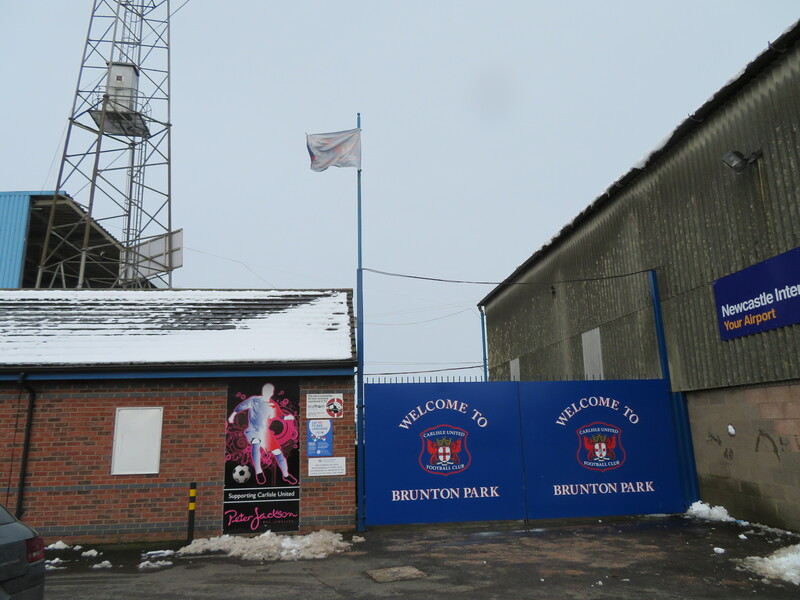 Brunton Park is a traditional ground for the most part with both the fantastic Main Stand and equally great large, covered Warwick Road End terrace being throwbacks to another era. The Main Stand also features terracing along the front of it, known as the Paddock, whilst the Warwick Road End is a deep running construction that usually houses the louder part of United’s support, though they were, understandably, a little more subdued today. Meanwhile the far smaller, uncovered Waterworks/Petteril End (occasional away) terrace with a peculiar few rows of uncovered seating upon it sits behind the opposite goal with the opposite side to the old Main Stand playing host to a newer construction, a smart-looking all-seater East Stand, which played host to both home and the away fans with the latter group situated at the far end, nearest the uncovered terrace. Interestingly, this stand runs beyond the Petteril terrace, a clue to plans the club once had to relocate the pitch slightly and also has gaps to the rear for hospitality boxes to eventually be built into it. 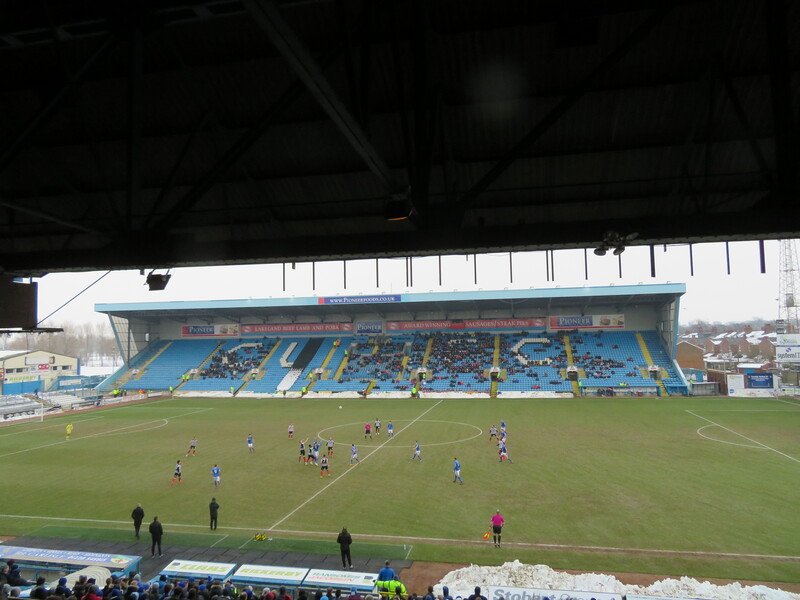 That’s Brunton Park and this is Carlisle United…. 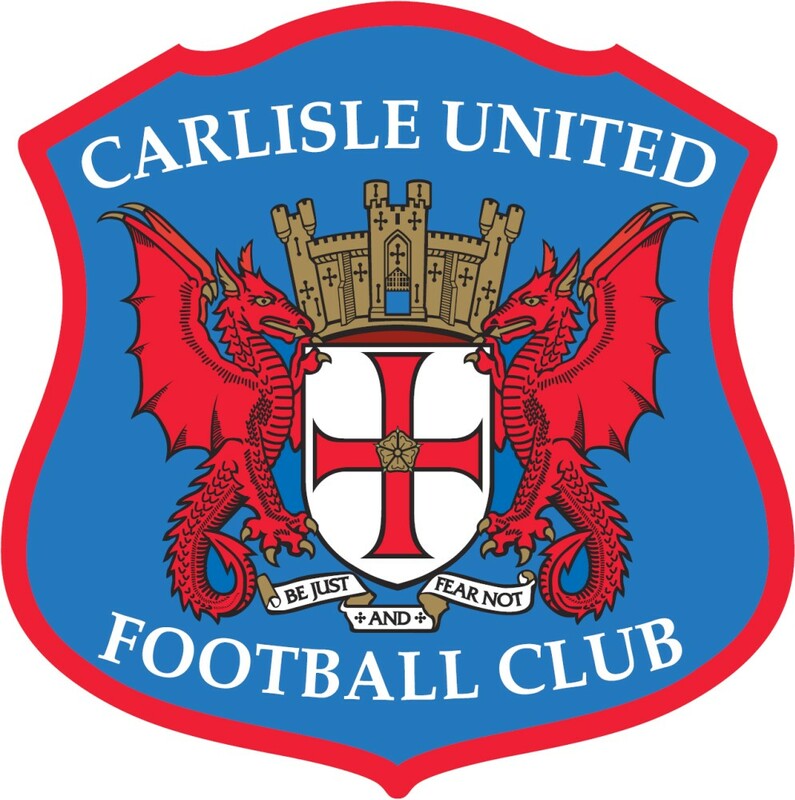 Carlisle United Football Club was founded in 1904 at Shaddongate United’s AGM where club members voted to change the club’s name to Carlisle United. As Shaddongate Utd, they initially played at the Millhome Bank and Devonshire Park grounds before changing their name and spending a further four years at Devonshire Park prior to settling on their long-term home at Brunton Park in 1909, though lost the original wooden grandstand that stood at the ground to fire in 1953 and has suffered from regular flooding issues. 1905 saw Carlisle join the Lancashire Combination where they were admitted on the condition they paid all visiting team’s travel expenses for two years as Carlisle weren’t a Lancastrian side. They remained here for four years, winning the Combination’s Division 2 and finishing Division 1 runners-up in 1908, before the league’s re-organisation saw Carlisle make the decision that the league was no longer suitable for them and so they switched into the North Eastern League, taking the place of their reserve side, who’d been a founder member. Carlisle would win the league on one occasion, in 1922, before the club left to join the Football League in 1928 after being elected to join following a runners-up placing in the 1927-’28 North Eastern League season. Carlisle would defeat Accrington Stanley in their first league game in the Third Division North, with their second game seeing the club record what remains their record win, an 8-0 triumph over Hartlepool United. Upon the outbreak of WWII, Carlisle withdrew from national and regional football and continued to play only locally before returning to the Football League upon the end of the war and after appointing the youngest ever League club manager in history, Ivor Broadis, gave Bill Shankly, a former United player, his first managerial job in 1949 upon Broadis’ departure to Sunderland, becoming the first manager to transfer himself! The Cumbrians continued in the Third Division North through until 1958 when the division combined with the Southern section to form the Fourth Division. Carlisle were placed in the bottom division and remained there until 1962 when they won their first ever promotion, though this joy was short-lived as they were relegated the following season. However they rekindled their promotion season the year after that, returning to the Third Division in 1964 after finishing runners-up and missing out on the title on goal average only. They followed this up by going on to win the 1965 Division 3 title and went on to embark on a “golden era” which saw the club cement themselves as a Second Division mainstay, finishing third twice (’67 & ’74), the latter occasion seeing Carlisle reach the First Division for the first time. Meanwhile, 1970 saw Carlisle defeated in the League Cup semi-finals and 1972 saw the club partake in their only European competition in their history, as they took part in the Anglo-Italian Cup which was highlighted by a 3-2 win over Roma in the Stadio Olimpico. After winning their first three fixtures of the 1974-’75 season, Carlisle sat atop of the English footballing landscape. However they ended the season at the opposite end of the table, finishing bottom and being relegated as a result. Another relegation in 1977 saw the club back in Division 3, though this stay was only fairly brief, as a return to Division 2 was secured in 1982 after a runners-up placing. Unfortunately for United, this was to be as good as it got for a while, as they began to fall away and 1986 & ’87 saw them suffer successive relegations to find themselves back in the Fourth Division once again. They even ended their first season back there second-bottom, though did reach the FA Cup Third Round where they were knocked out by eventual winners, Liverpool. After coming close to the play-offs in 1990, Carlisle continued their swing in fortunes and finished bottom the following year, only retaining their Football League status as a result of Aldershot being expelled. From there, a new owner saw fortunes take a turn for the better and after missing out in the 1994 play-offs at the semi-final stage, 1995 saw promotion to the Second Division (now the third tier after the founding of the Premiership)as Division Three champions, before relegation the next year saw them back, once more, in Division 3. However, they continued to yo-yo around between the divisions, being promoted once more the next season, 1996-’97, with this campaign also seeing the club lift the Football League Trophy for the first time. Unfortunately, things soon turned for the worse once again and relegation in 1998 saw the club back in Division 3 again. The next season saw Carlisle needing to win their final game to avoid dropping to non-league. With time almost out, it looked as though they were down until the famed last-kick goal from goalkeeper Jimmy Glass arrived to save Carlisle’s league status and send Scarborough down. Along with disappointment in the Football League Trophy final of 2003, the spectre of relegation continued to hang around Brunton Park for the next few seasons, though, the club finishing above 22nd only once between ’98 and 2004. However the latter year did see Carlisle eventually fall into the Conference, losing their Football League status for the first time since 1928. 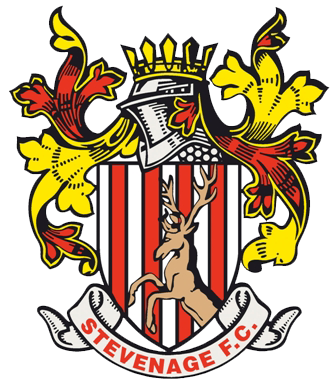 As it was, the club would only spend a sole season in the Conference, being immediately promoted back to “League 2” in 2005 after defeating Stevenage Borough in the play-off final. Their return was successful as they went on to lift the 2006 League 2 title, were again on the wrong side of a Football League Trophy final the same season and reached the League One play-offs in 2008. 2010 saw the Cumbrians lose out in the Football League Trophy final, but they righted this disappointment the following year by lifting the silverware under Gregg Abbott, though just missed out on a spot in the play-offs at the end of that season. 2013 saw Abbott replaced by player-coach Graham Kavanagh after a poor run of form, though this change didn’t help matters as Carlisle were relegated back to League 2 in 2014 ending an eight-year stay in the third tier. Kavanagh was replaced early the next season, with Keith Curle taking charge hoping to bring some stability to the hot-seat after a number of pretty quick changes. Some decent results followed with points being secured against promotion contenders Plymouth Argyle and champions Burton Albion seeing Carlisle eventually finish clear of relegation, whilst they also recorded a creditable 1-1 draw with Liverpool at Anfield in the League Cup, though would bow out on the resulting penalties. 2016-’17 started out with the club losing just once in their opening 23 games and sitting pretty in second place. However, they then lost form horribly and won just four of the following 21. 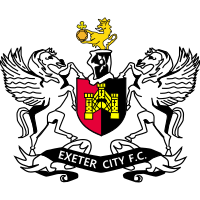 But late wins over Newport County and Exeter City saw them take a spot in the play-offs, where they’d bow out to the latter over the two-legged semi-final and find themselves in something of a similar position this season, again chasing a play-off placing. The club have also won a total of nine Cumberland Cups, the latest arriving in 2015. The game got underway and it took just three minutes for the hosts to break the deadlock, as ‘keeper James McKeown could only parry Richie Bennett’s initial effort and the ball fell to Hallam Hope who picked up the pieces to fire home. From there, the game continued to be a very watchable one, despite the lack of clear-cut chances for either side, the next true opportunity arriving half and hour later and it was almost a fantastic second for the hosts. Bennett and Hope combined again to force their way forward before the ball was played into the midfield where Jamie Devitt was waiting. From around 30 yards, Devitt unleashed a rocked of a shot that beat McKeown but unluckily thundered into the underside of the crossbar and failed to bounce the right side of the line from the home side’s point of view. Bennett than had a great chance to net the elusive second goal but, after receiving a header down from Clint Hill following a corner, only guided the ball weakly into the grateful hands of Grimsby’s custodian. Half-Time arrived shortly afterwards and I headed down just underneath where I was sat and to the bar area within the stand. 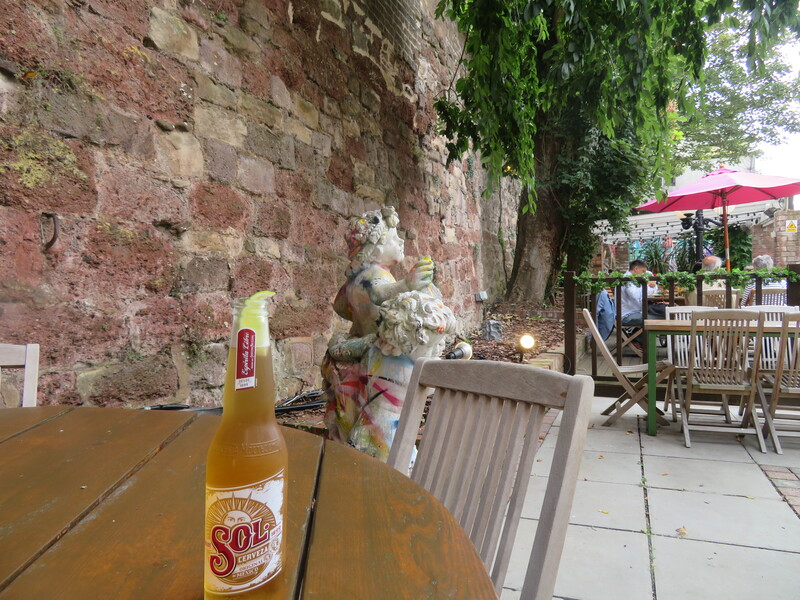 A lovely area, the bar has a good offering of draught beers etc. on and also serves a pie selection, of which I tried out the Steak and Ale variety whilst watching the scores of the games that had survived the cold snap arrive into the Soccer Saturday studio. A fine offering it was too. Soon enough it was time to head back up into the seats and await the imminent second half. As it was, Grimsby fashioned the first chance of the half and their first real sight of goal, as Jamille Matt’s knockdown fell nicely for Harry Cardwell who met the ball well on the volley. Unfortunately for the Mariners, home ‘keeper Jack Bonham pulled off a superb, near point-blank stop to keep his side ahead. Charles Vernham and Luke Summerfield both went close too, but the away side couldn’t force themselves level. This proved to be the end of Grimsby’s spell of dominance in the game as Carlisle wrestled back control from the visitors and, with around twenty minutes left on the clock, Devitt forced a corner. He went on to take the resultant set-piece which found the head of Mark Ellis, who towered above all in the box to power his header home from close range to put clear daylight between the two outfits. McKeown felt he’d been fouled in the immediate lead-up to the goal, but the referee wasn’t interested in his protests. The goal stood and United had a two-goal advantage which looked as though it would be decisive. Carlisle then had the chance to add gloss to the scoreline with a few minutes remaining when sub John O’Sullivan was brought down in the area with the ref having no hesitation in pointing to the spot. There was little complaints from anyone this time and up stepped Hallam Hope with the task of putting the three points under lock and key. However, Hope’s spot-kick wasn’t the best you’ll ever see and McKeown dived away to his left to palm the kick clear of danger. The miss mattered little in the long run as nothing much of note occurred through until the final whistle, with Keith Curle’s side continuing their chase of a play-off spot with a vital three points. Grimsby looked solid enough and you wouldn’t expect them to drift into relegation issues. 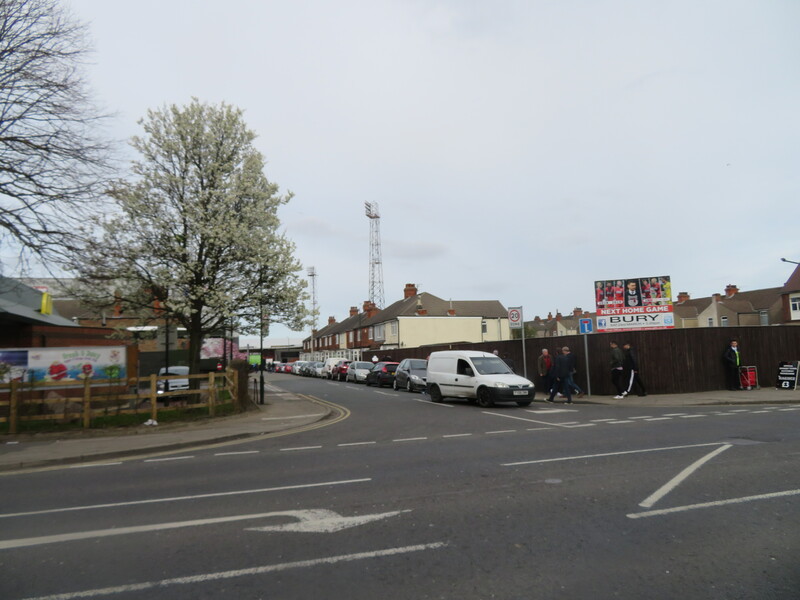 As the committed group of Grimsby fans left to head off on their long journey back, I followed a group of home fans down an entry way which ran past the neighbouring rugby club. This proved to not be the smartest of choices as this too was rather icy, though not much worse than the conditions around the side roads and certainly not dangerous. 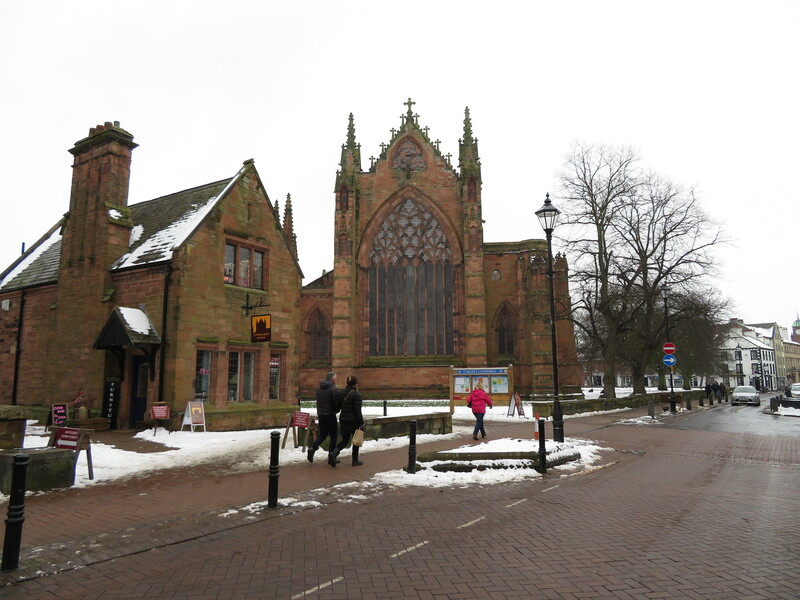 I survived and arrived back onto Botchergate after a 15 minute walk and headed into one of Carlisle’s two Wetherspoon’s, which are separated by only a few feet. With me ideally wanting to squeeze one more in before the train back, I opted for a Hooch in the Woodrow Wilson (named after the 28th President of the United States whose mother was born in the city) which was swiftly polished off before I opted to visit the interesting-looking Cumberland Arms. 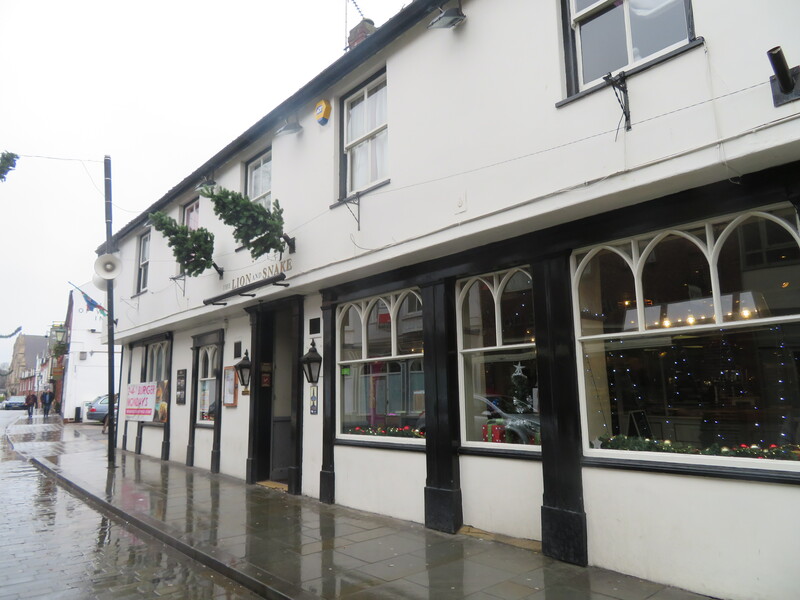 However, what looked like a traditional pub from the outside was certainly different inside, with disco running wild within. Though it was pretty quiet at this hour, the amount of staff on makes it appear this is a popular spot later in the evening. For now, I got in a Dark Fruits to finish off my first true visit to the city. Returning back to the station, I had a short wait until the train which would take me back to Warrington. No problems were encountered thankfully as I arrived in fine time to walk across town for my train back towards Manchester. Whilst having some quiet time in the waiting room, I was soon joined by a group of ladies and matters soon livened up. A rat appeared to send mass panic through the girls’ ranks and I seemed to pull off an unbelievable task by getting close to the small rodent, whilst a couple of them took to standing on the seats. The poor thing ended up retreating within another block of seating and the train arrived shortly afterwards to enable a safe exit! Drama at its highest, let me tell you! Upon heading home, I enjoyed a couple more back in my parents’ bar to end off the first of a likely double for the weekend. Having wanted somewhere more memorable for ground 250, Brunton Park was a fine replacement for Villa Park and definitely fits the bill. The traditional look of the ground is always one I prefer to the bland new builds and so I was more than pleased for Carlisle’s home to bring up the milestone. The ground is cool, the game was decent (I was happy to just see one) and the city seems decent too. 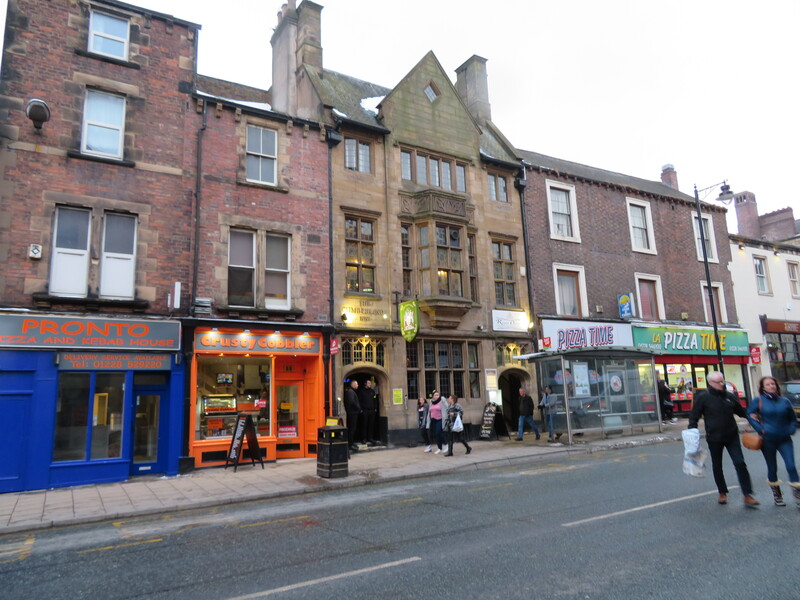 I’ll have to return again soon for Carlisle City or even Northbank Carlisle, perhaps! 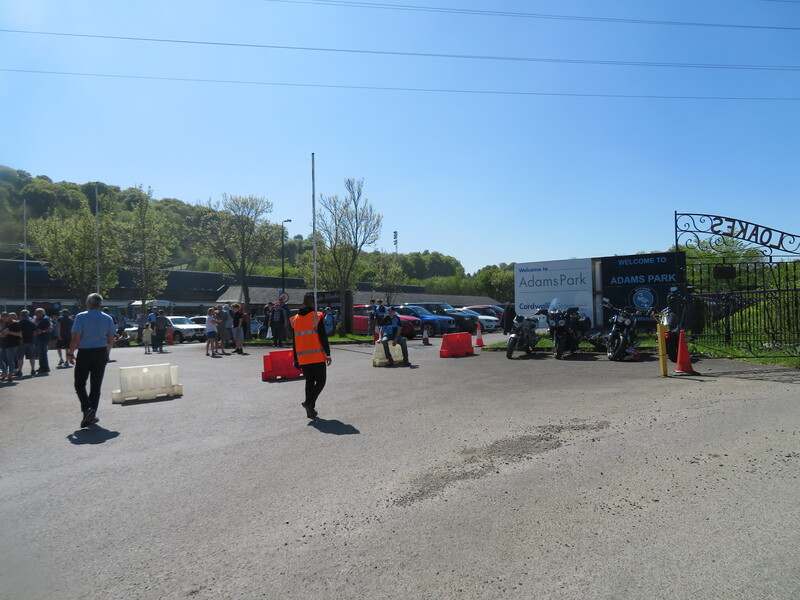 Anyway, round one was complete with a Sunday trip over the Welsh border to come….